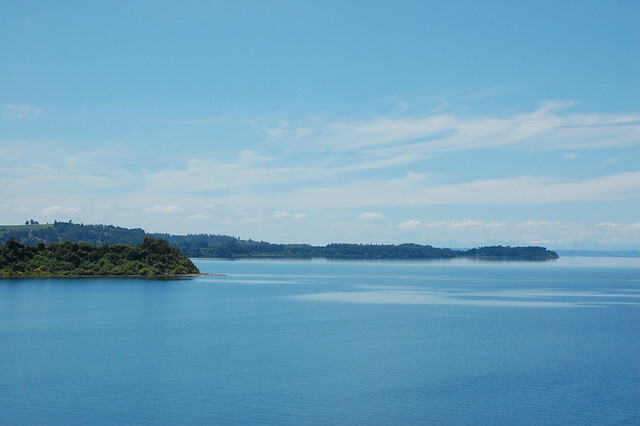 Fresh off my successful bike adventure to Lago Caburgua in the Araucania region, I moved on to Puerto Varas already knowing that I wanted to rent a bike and explore the area along Lago Llanquihue. My research had shown me that the most common route was biking to and from nearby Frutillar, a journey of 30 kilometers each way, including some incredibly steep climbs up and down hills (as well as amazing views). Because the buses between Frutillar and Puerto Varas are small and often filled with passengers, it’s challenging to convince a driver to let you bring your big, heavy mountain bike on the bus, which could save your tired legs the difficult return journey. I started to worry that I wouldn’t be able to make it back, so I asked the hostel staff for their opinions on the ride. That’s when I received the best suggestion ever: you don’t have to do the whole route. You can turn around whenever you would like. As it turns out, the struggle begins about two-thirds into the ride, when the coastal road turns into a peninsula; up until then, the route provides a comfortable challenge, with some off-road biking and low hills. 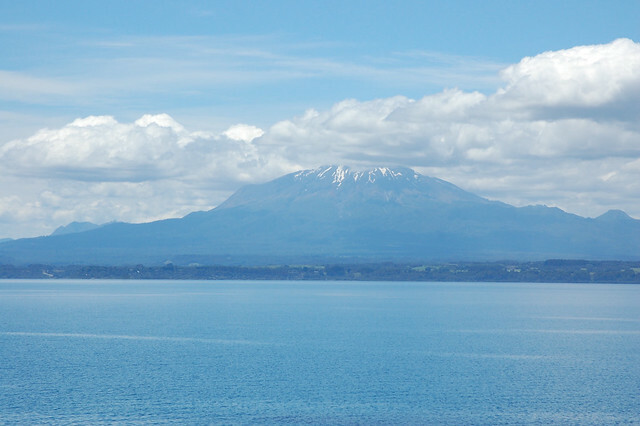 Why not just bike to the attractive lakeside town of Llanquihue and keep going until you feel like heading back? It’s amazing how such a simple suggestion can change your entire perspective! Often we get sucked into the idea that we have to make it all the way to the end, that there’s something to prove, some feat of physical prowess or determination. But that’s limiting. 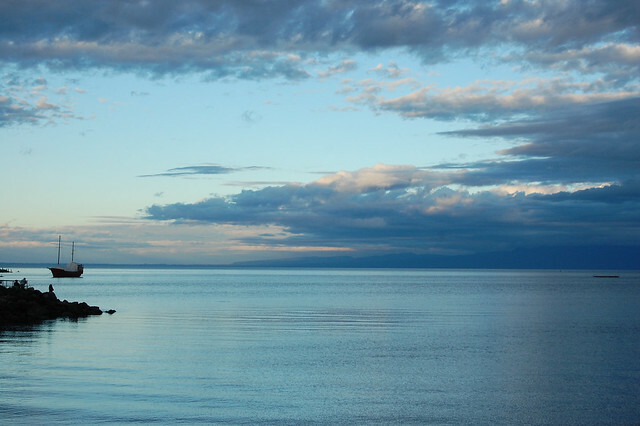 Remember, it’s the journey, not the destination – and I wanted to make the journey and be able to enjoy biking along gorgeous Lago Llanquihue and taking the millions of photos that often slow down my progress. Best decision ever! 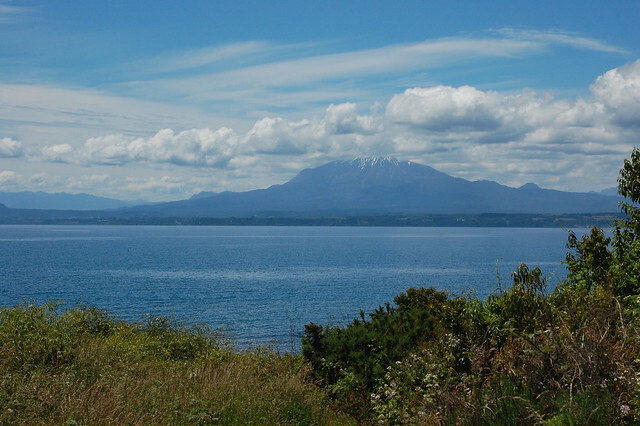 So that’s what this post is about – biking from Puerto Varas to Llanquihue, continuing to the fishing village of Totoral, and appreciating all the stops along the way. This serves as a nice reminder that there are many ways to achieve the same thing; I ended up taking the bus to Frutillar the next day, so I was able to appreciate the popular town at a relaxed pace without being exhausted and nervous about how I would physically make it back to Puerto Varas. So I rented a mountain bike from the hostel and set off from Puerto Varas. The bike route follows the railroad tracks out of town for a few kilometers, making for an extremely bumpy beginning to the ride and proving the need for a mountain bike! 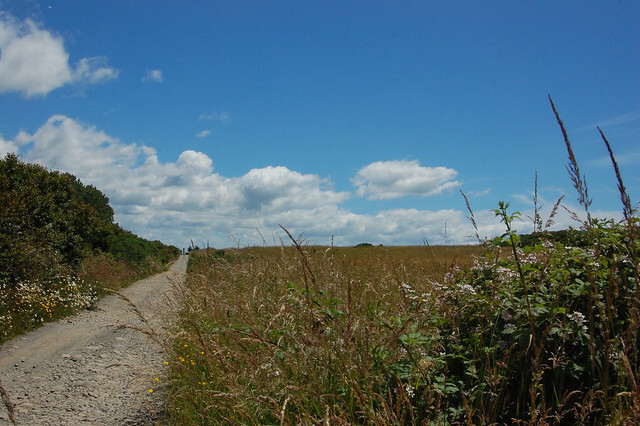 After a few kilometers, a narrow but obvious path appears to the right, passing through the green fields you see in the photos above before connecting to a dirt road. Once you’re on the Costanera Viente Norte, the route gets a little bit easier (and even more scenic!). 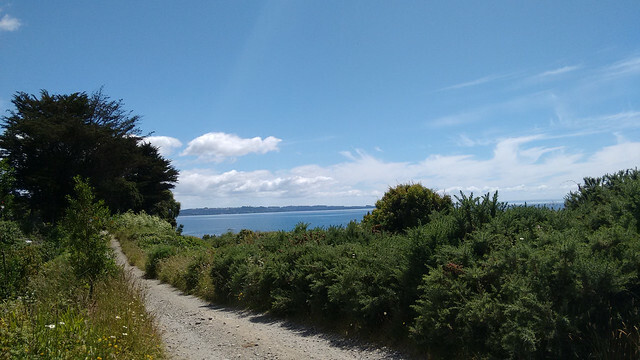 Along this road, there are several houses, cabins for rent, and new construction by people wisely taking advantage of the currently unobstructed views of Lago Llanquihue. Naturally, I couldn’t help but stop to take pictures of the green fields with the houses perched on rolling hills. How perfect are those puffy clouds in the blue sky? 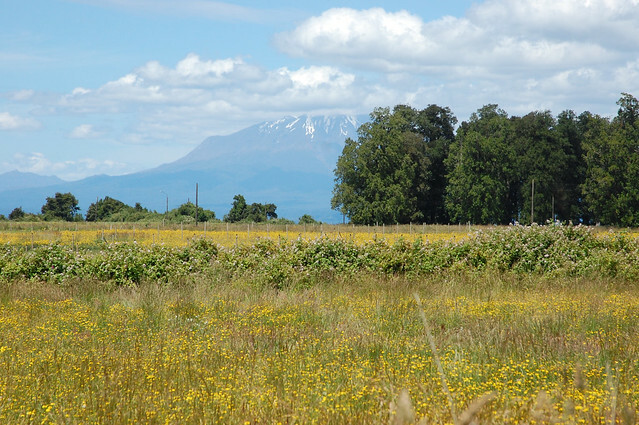 Descending the dirt road towards Llanquihue, the trees and fields start to reveal Lago Llanquihue’s aquamarine blues. 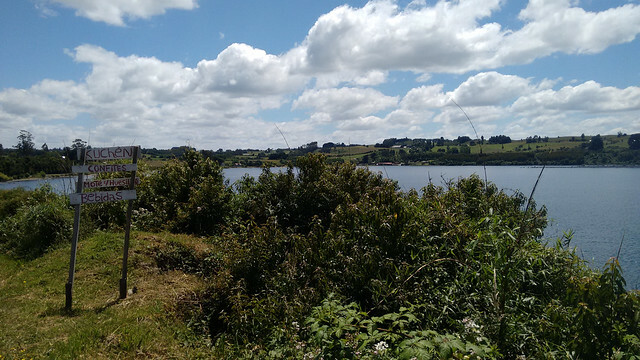 Even though I’d seen the lake up close and personal in Puerto Varas, there is something special about seeing it while out and about in nature rather than surrounded by the noise of a busy city. 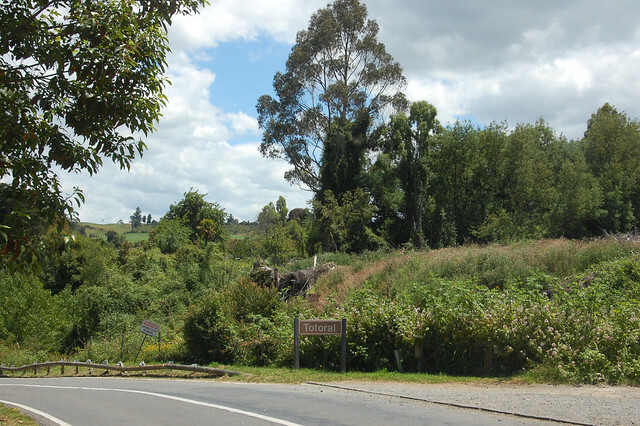 Eventually the dirt road connects to a paved one, and you abruptly reach Llanquihue, coming in on a long stretch of road named Teniente Merino with a beautiful park bordering the lake views. When I hit the paved road, I suddenly realized that my tire had gone flat, making a very sad sound! By complete chance, I happened to run into two bikers on a long-distance ride around southern Chile, and they immediately pointed out the flat and helped me change the tire. (We discovered that my tire had actually been punctured by a staple, which may have been picked up in the hostel!) Yet another one of those fortuitous travel moments; I would have struggled to change the tire on my own, and I actually didn’t run into any other bikers on the rest of the trip. After my new acquaintances continued along their way, I paused to take pictures of the lake from this quiet little stretch of road. The roadside park would be a perfect place to stop and have a picnic or read a book all afternoon, away from the crowds. The views are amazing and the flowers and bushes in bloom for spring made it an idyllic place to hang out. 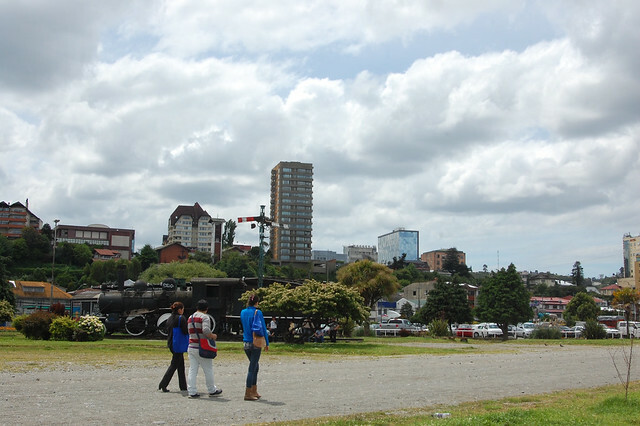 After hopping back on my bike with its newly-repaired tire, I continued through the town of Llanquihue, following the main road through the center of town and crossing over the train tracks. I planned to spend more time there on my way back to Puerto Varas, but first, I wanted to see how far I could get on my bike. On the way, I spotted this awesome mural painted on a stretch of stone wall on the outskirts of time. 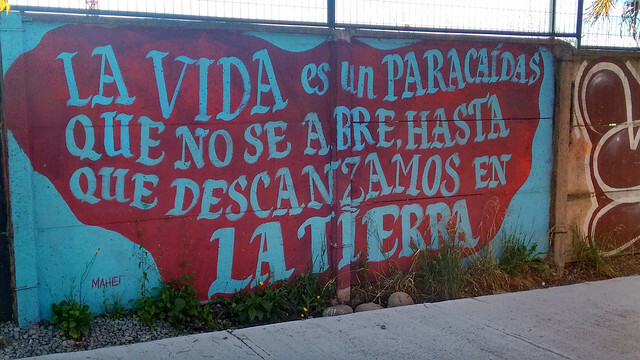 Its message resonated with the reason I was on this trip – to take some time for myself to really connect to the beauty of southern Chile, and that’s just what I was doing on my bike adventure! 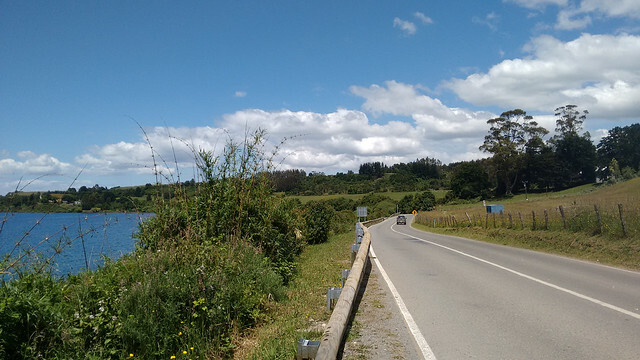 After passing though Llanquihue, I continued biking along Ruta V-155, the scenic coastal road that runs along Lago Llanquihue. Although I had packed a picnic lunch, I was happy to see that enterprising Chileans had set up stands selling Chilean treats like kuchen (German-style cake with fruit) and mote con huesillo, the super sweet Chilean drink commonly served in summer. Beyond that, there are artisanal breweries along this route, another nod to the region’s German heritage. But what I was there for were the views, and they were amazing. With the Panamerican highway nearby, this coastal road is not heavily transited by vehicles, except for tourists admiring the views. As I rediscovered in my last bike journey, there is nothing like feeling the air in your hair, being out there in nature, experiencing the views 360 degrees around you. 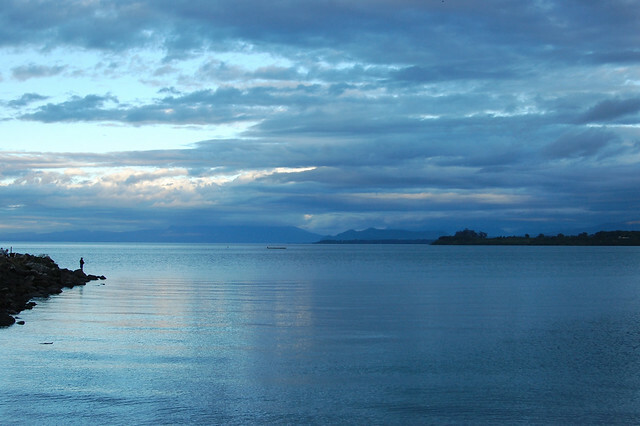 Pictures cannot capture the hugeness of Lago Llanquihue and words cannot substitute for the experience. If you’re considering biking in this area, please go and do it! It’s amazing! As I continued the route towards Totoral, I passed a couple of lookout points where I stopped and took pictures of the expanses of lake below me, but finally after some hills I came to a little fishing beach right on the water, near a Nestlé plant. I continued beyond for a little while, but quickly realized the very steep hills and descents were beginning. After consulting Google Maps and seeing that I had reached the challenging part of the journey after 17 kilometers, I decided to head back to the beach and enjoy my well-deserved lunch. Absolutely the right decision, don’t you agree? This little beach appears to be a little bay for fishermen, and I was the only person hanging out there, appreciating the views of Volcán Calbuco in the distance. These kinds of quiet moments are the reason I do solo journeys, and this particular experience reminded me of my explorations on Rapa Nui (Easter Island). After enjoying my snack, I headed back to Llanquihue, enjoying heading downhill after some of the steep climbs along the way, and stopping to take as many photos as I wanted. Since I already knew what the terrain was like heading back, I was more relaxed and could truly enjoy the ride! 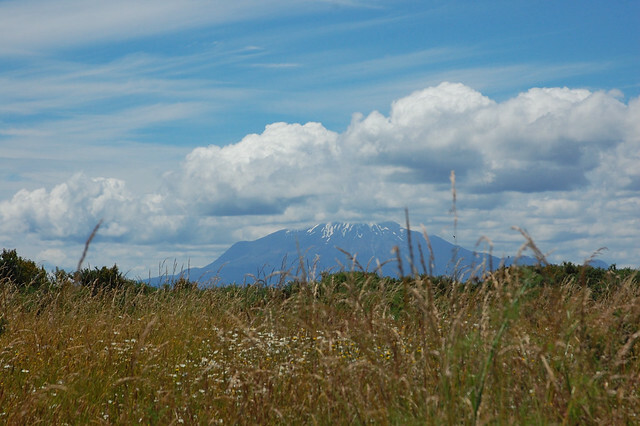 Along the way, I spotted gorgeous fields in bloom at the beginning of summer, with the volcanoes towering above. 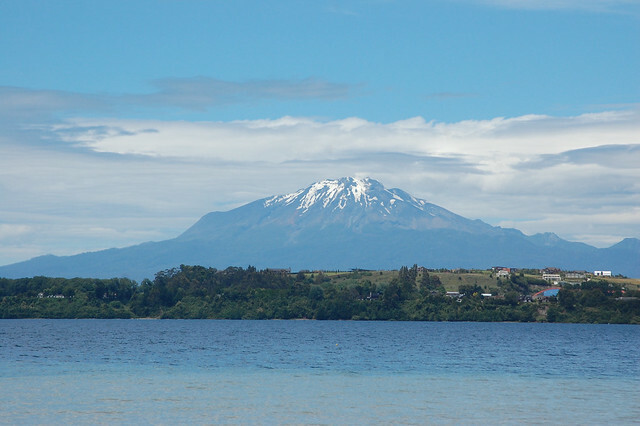 I had finally learned to identify which volcano was which, with Volcán Osorno’s perfect snow-covered peak. 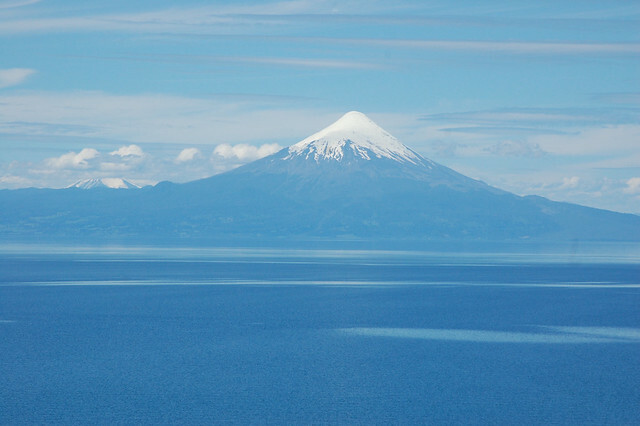 And on another overlook, Volcán Osorno towered over the blue lake. So much blue, just like Lago Caburgua. 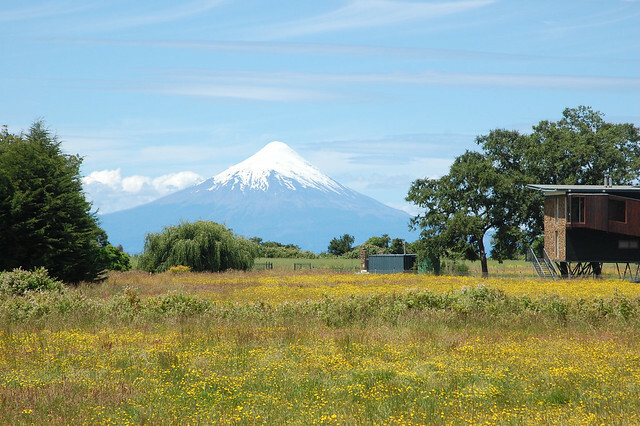 Of course, I can’t forget Volcán Calbuco, with its wide, jagged peak, equally beautiful towering over the golden fields. And there it is again, atmospheric clouds floating around its speak, providing a nice contrast to the blue sky. After some dedicated pedaling, I made it back to the town of Llanquihue. As I crossed the train tracks, I realized that there was another road leading down a tree-lined street. I had come in on Baquedano through the commercial district, but the views to my left lured me in. I started down Salomon Negria, immediately spotting this traditional house in the German style. Can you imagine the views from this place? This is still one of my favorite photos. I continued along the road, realizing as I approached that I was heading towards the beach. Who knew that there was such a nice, quiet beach located in this little town? I certainly didn’t! 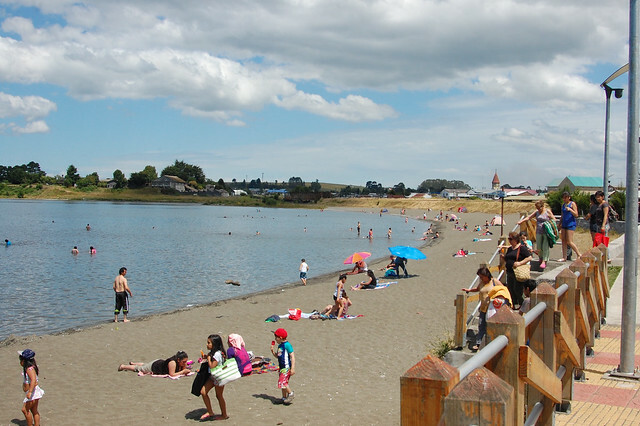 Not only does Llanquihue have a sandy beach, but there is also a park with lots of trees offering shade from the hot sun. 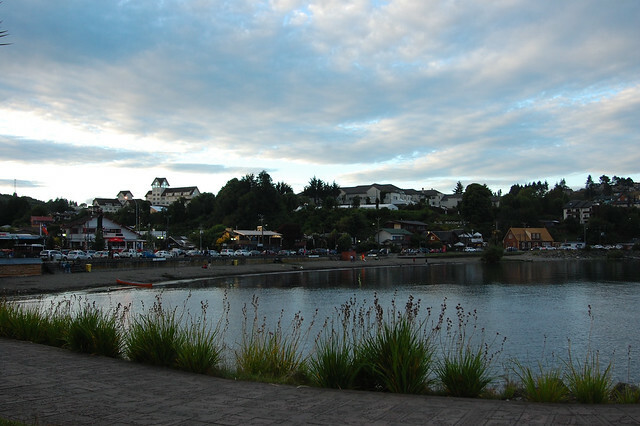 I can see why this little town is attractive for families and anyone needing an escape from nearby Puerto Varas. If I had known, I might have brought my swimsuit! Just as I felt in Villarica, there is something special about swimming under the watch of this lovely volcano. Having sufficiently appreciated the beach, I headed back into town, stopping in to a little convenience store to buy more cold water. I ended up chatting with the shop owner for quite a while, as Llanquihue does not often see many foreign tourists passing through. These little moments of curiosity and connection are some of my favorite things about solo travel. 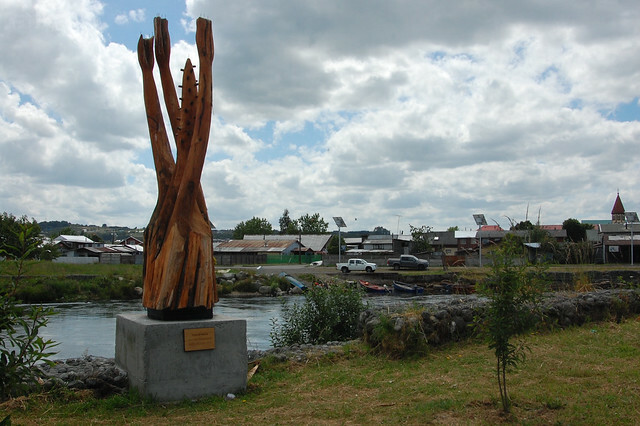 As I headed out of town, I spotted more of these wooden sculptures lining the river that crosses through the town. 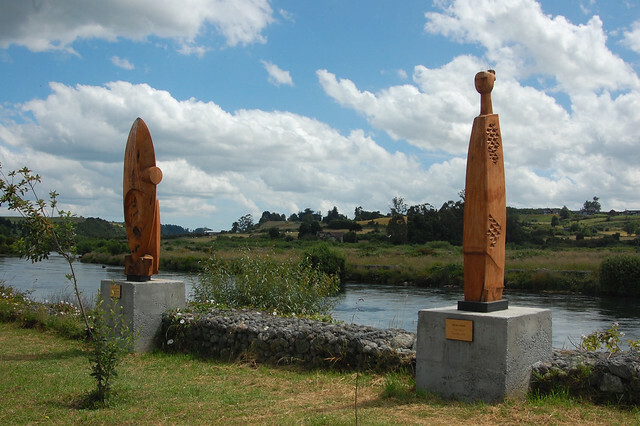 I decided to check them out; they appear to be an art installation celebrating the indigenous cultures of Chile. 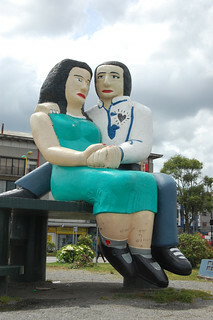 While the commercial district of Llanquihue is not particularly attractive, these sculptures help give the town more character. 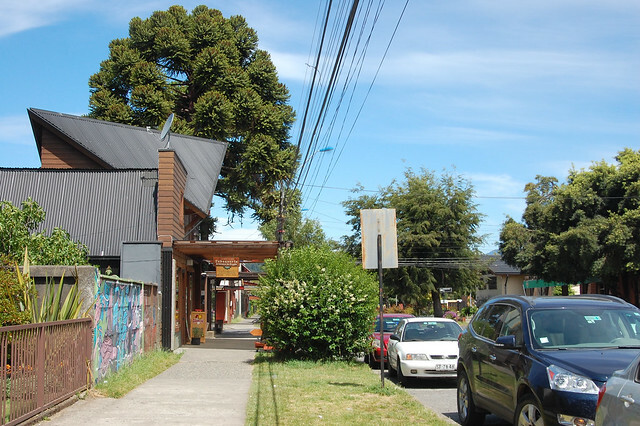 This is real town, living and breathing with the everyday lives of its inhabitants, as opposed to the tourist-friendly sheen of Puerto Varas. And it has lots of character and is well worth a visit! From there, I continued my return trip past my favorite little park, where I took the photo at top of the post (my favorite from the day, though it’s hard to choose) as well as this one. The clouds over the lake had mostly cleared, which led to some pretty reflections of the snow-covered peak in the water. The wildflowers and grass growing along the edge of the park provided an nice contrast to so many blues. As a reminder to anyone considering the bike journey: after leaving Llanquihue, the route turns into dirt roads and narrow paths through fields before the gravel-filled, bumpy adventure along the train tracks. 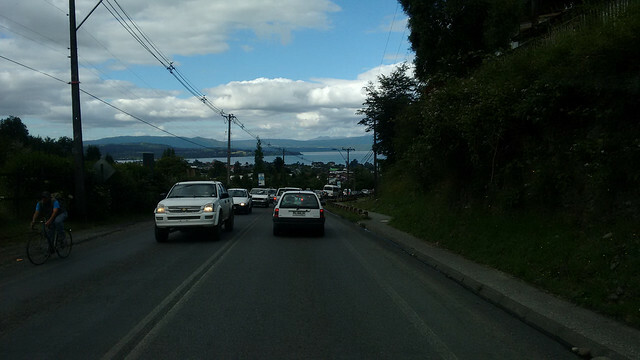 Make sure to save some energy for the last 30 minutes of your trip, and be smart about the path you take through hilly Puerto Varas. As you can see, I throughly enjoyed my bike adventure along the coastal route from Puerto Varas to Totoral, and especially appreciated the chance to get to know the town of Llanquihue more than I would have otherwise. This was what was right for me on this trip, and I highly suggest it to anyone feeling intimidated by the hilly route to Frutillar! 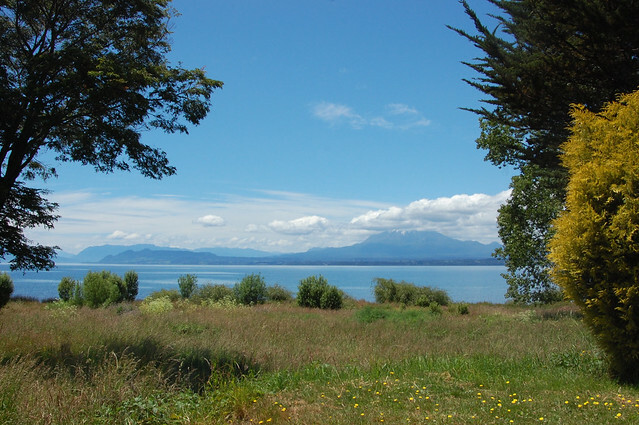 As I mention above, the traditional bike route is a 30 kilometer trip between Puerto Varas and Frutillar, and then another 30 kilometers back. 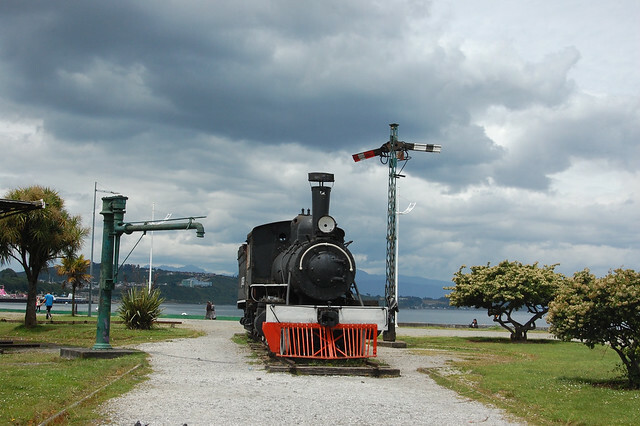 You leave Puerto Varas by following the route along the railroad track for a few kilometers until you see a trail appear to your right, and head along a dirt path leading to an unpaved road along the coast. 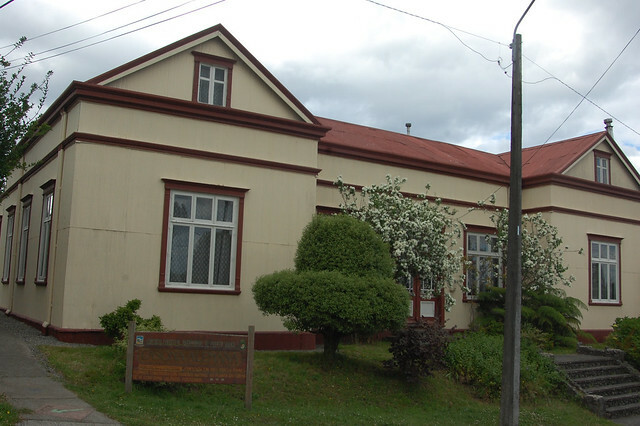 Then the road continues along a paved road through the town of Llanquihue until you reach the coastal highway Ruta V-155. You follow Ruta V-155 for about 15 kilometers of fairly easy terrain, with some hill climbs and descents, until you pass Totoral. After Totoral, Ruta V-155 heads inland, considered to be the “shortcut” to Frutillar along a hilly gravel road. The coastal highway turns into V-305 and apparently includes lots of hills as well. I chose to turn around at Totoral to enjoy a more relaxing and less physically exhausting day. Although most of the route is along a highway, there is not much traffic on this road and there are kiosks, artisanal breweries, and tourist accommodations along the way should you run into any issues or need to refuel with water or snacks. There are several descents down the cliffs to lakefront beaches as well as an easily accessible beach in Totoral, in case you don’t feel like locking up your bike. This is the advantage of taking it easy on the bike – you can stop and check out some of the stops along the way. Make sure to bring lots of water for the journey and make sure your bike rental provides a kit for changing your tire as you will head through gravel and dirt roads and might get a flat like I did. I rented my bike from Hostel Margouya Patagonia, where I was staying, and it cost me $5000 CLP for a half-day rental. 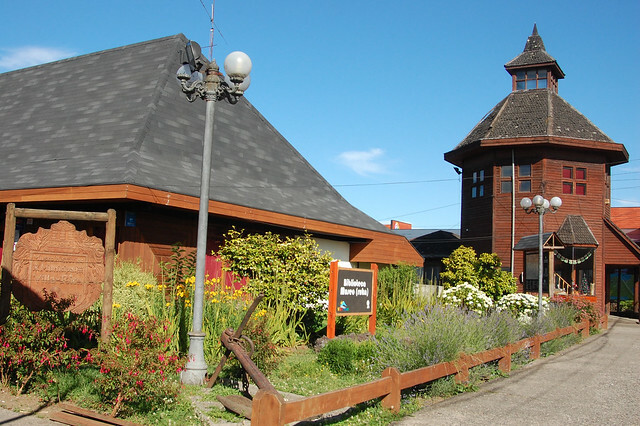 There are other bike rental shops in Puerto Varas, or you can go with an organized tour. The advantage of doing this is that you go with a group that follows you with a van just in case you run out of steam (I saw a group doing this on my way). 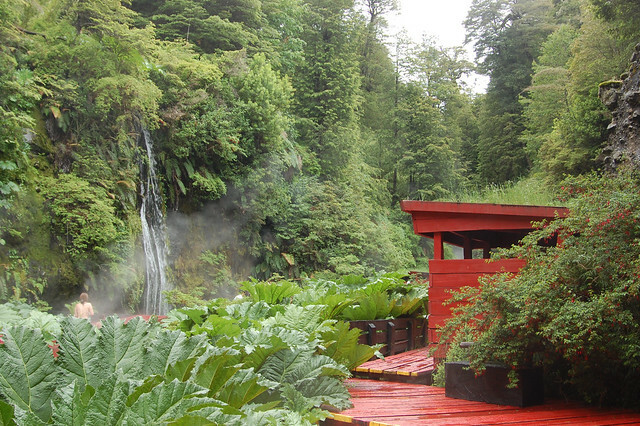 I highly suggest visiting Llanquihue! 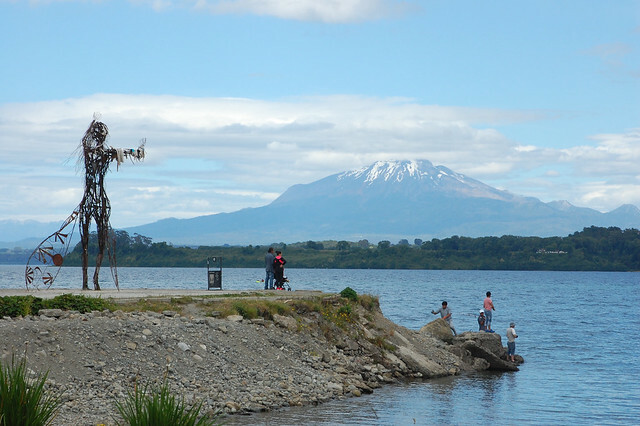 Even if you don’t feel like biking, or you do want to do the full journey to Frutillar, you can take a bus from Puerto Varas to Llanquihue (they leave from the center of town near the gas station). 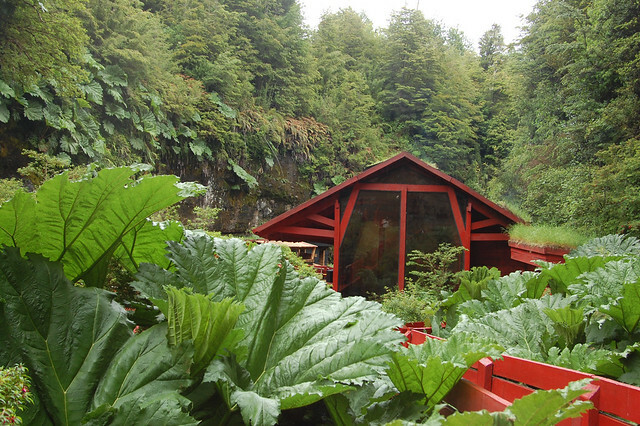 Any of the Frutillar buses stop in Llanquihue. 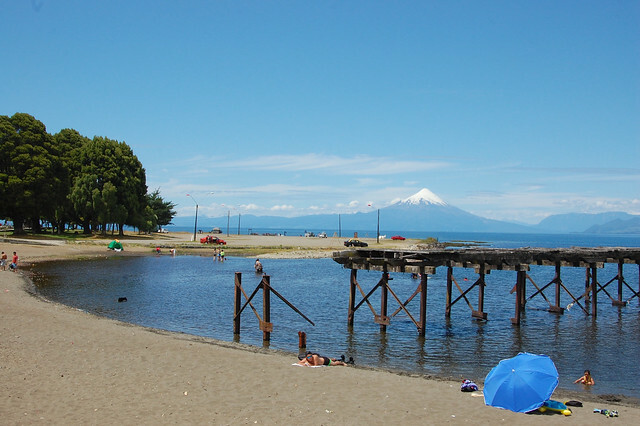 Llanquihue is a small town with a residential district and a commercial district, but if you head towards the water there is a lovely beach with a little tree-covered park. This would be a great place to spend the afternoon. I also really liked the quiet park on the outskirts of town, which would be my pick if coming in on bike. As I mention above, the biggest lesson I learned on this journey was that I don’t have to do everything the way the rest of the travelers do. I knew I physically was not up for the hill climbs, and so I decided to make the most of my own adventure by taking lots of pictures and stopping whenever I felt like it. This was the right choice for me, but you might feel differently! 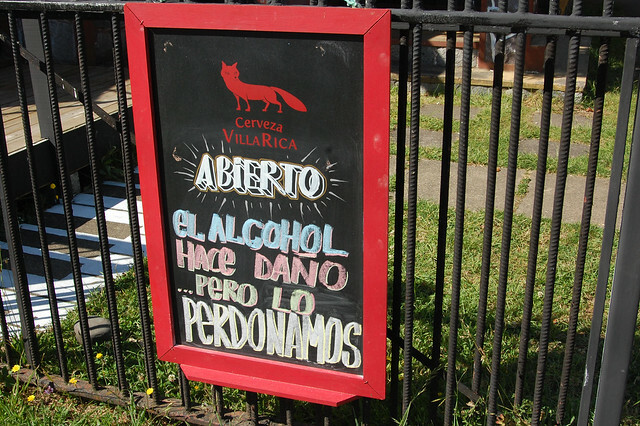 I like this blog post detailing two travelers’ quest for artisanal beer along the way. Choose your own adventure! 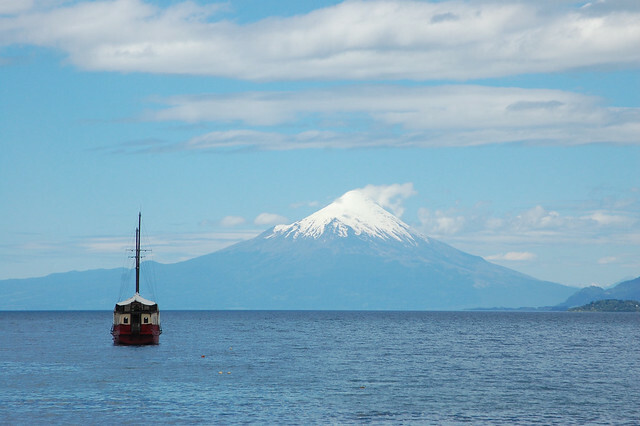 After leaving the amazing lakes and landscapes of Pucón and the Araucania region, I headed south to Puerto Varas. 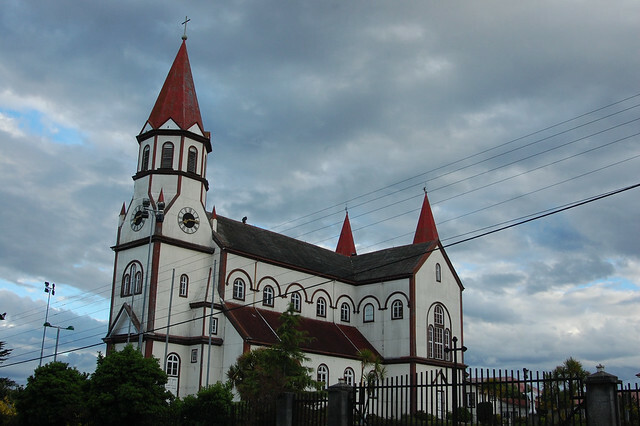 Where nearby Puerto Montt is the official gateway to Patagonia and commercial capital of Los Lagos (the Lakes Region), Puerto Varas is the center of all tourist and cultural activity. 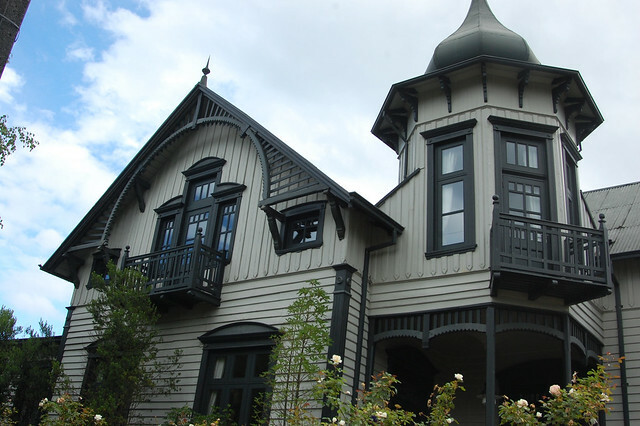 It draws you in with its ideal location on the shores of Lago Llanquihue, with impressive views of Volcán Osorno and Volcán Calbuco, and then keeps you there with its strong ties to German architecture, food, and culture imported by immigrants a century ago. 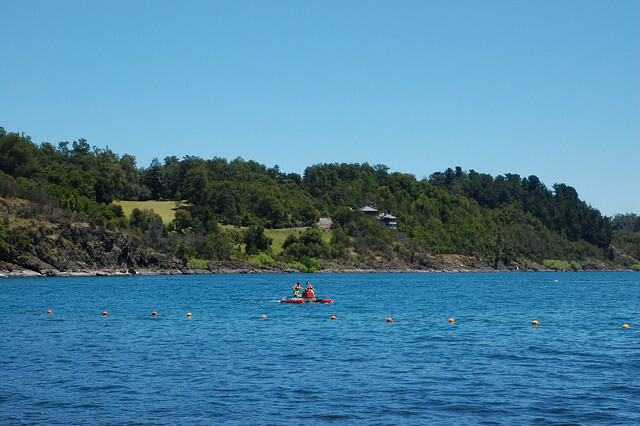 Not only that, Puerto Varas offers easy access to adventure activities all around the region, including trekking, biking, and my new favorite, kayaking. There’s also an emphasis on natural products and sustainable lifestyle. As you can probably tell, Puerto Varas is my favorite city in Southern Chile. 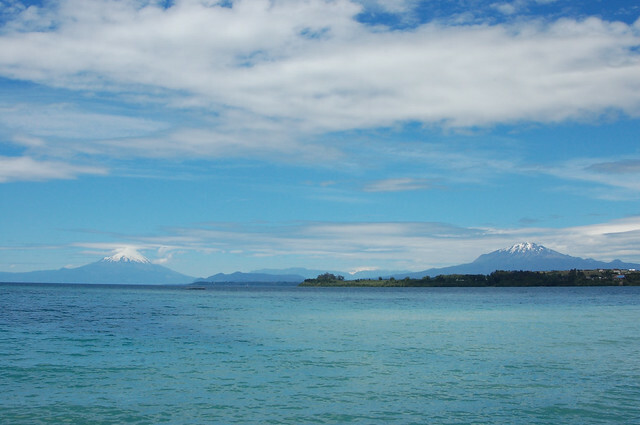 As my former manager (also a Chile-phile) said when I told her it was my next destination, “I love Puerto Varas. I never feel like I have enough time there!” There’s so much to do and see and experience. 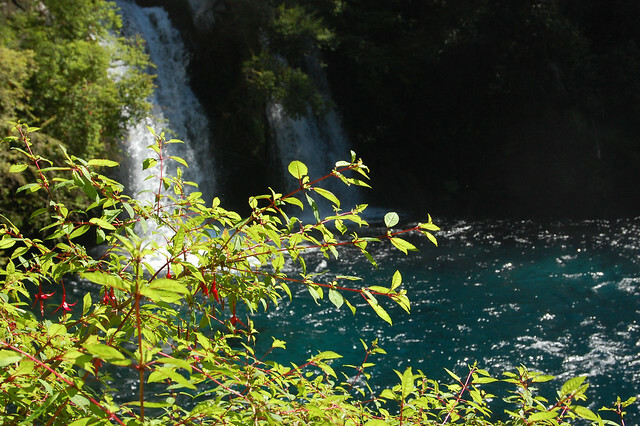 It’s a perfectly situated tourist destination where you can easily spend a week or two, and yet somehow manages to avoid feeling over-sold like nearby Pucón. 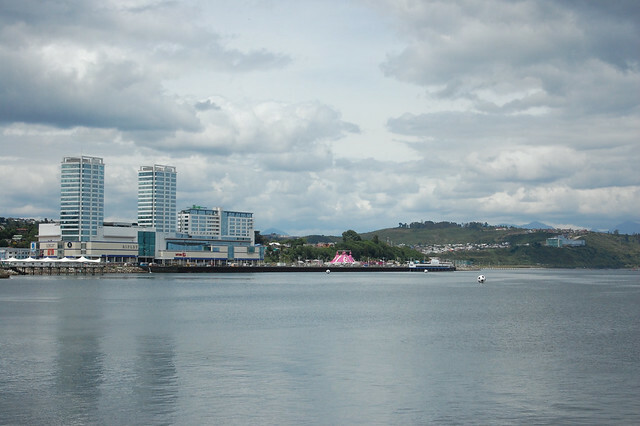 In this post, I describe Puerto Varas proper, and in future posts, I’ll get into details about the surrounding area. Because the buildings that line the coastline are constructed in the traditional German-inspired style, the entire skyline looks serene and picturesque, spreading across the green hills and city streets. But really, what you’re there to see are the volcanos! I was fascinated by the jagged peak of Volcán Calbuco, and took so many pictures of it that it was hard to narrow down to this one. And then you turn just a little bit to the left and see both volcanos right in front of you, sitting majestically over the sparkling aquamarine lake. 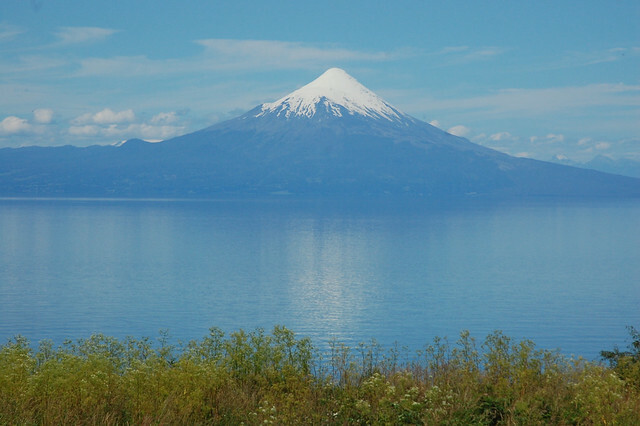 Of course, Volcán Osorno is yet another perfect looking peak – Chile’s blessed with so many pretty volcanoes. Well, I guess you could say that the country is actually cursed with them considering there’s an eruption every few decades. But they sure are beautiful to admire from a distance! 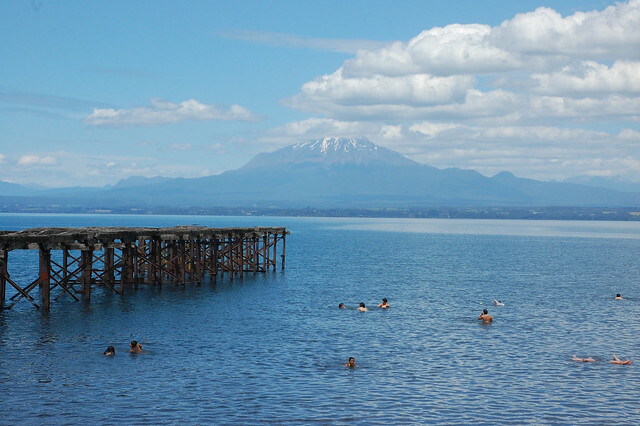 After sufficiently admiring the views of volcanoes from the coastline of Puerto Varas, you can appreciate Lago Llanquihue by getting in the water. There are a few stands renting canoes and there are also travel agencies that can take you out kayaking in the bay. Or you can just go swimming! 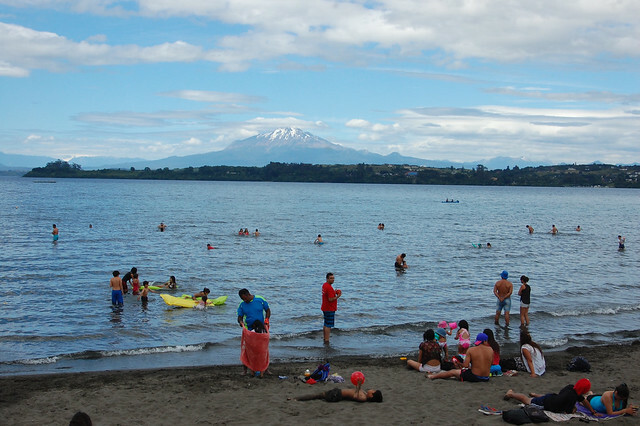 As I visited during the holidays, right between Christmas and New Year’s, there were lots of families lounging on the beach located near downtown Puerto Varas. 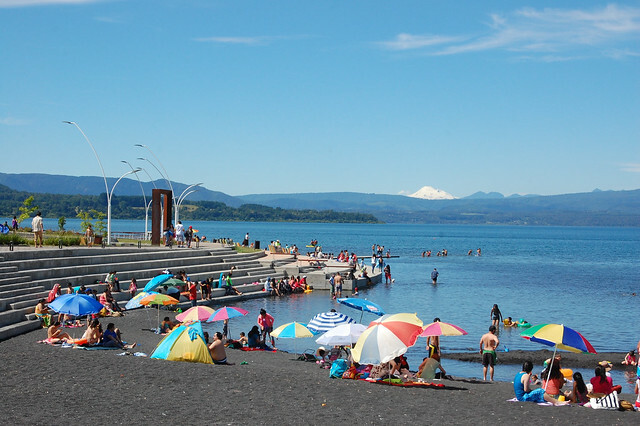 In Puerto Varas, there is another beach further down the costanera heading towards towards Ensenada; each town that surrounds the lake has a least one lakefront beach! Heading towards the railroad tracks and Parque Phillippi, there is another peninsula with a rocky beach and this interesting metal sculpture, which appears to be a woman majestically looking out over the water. 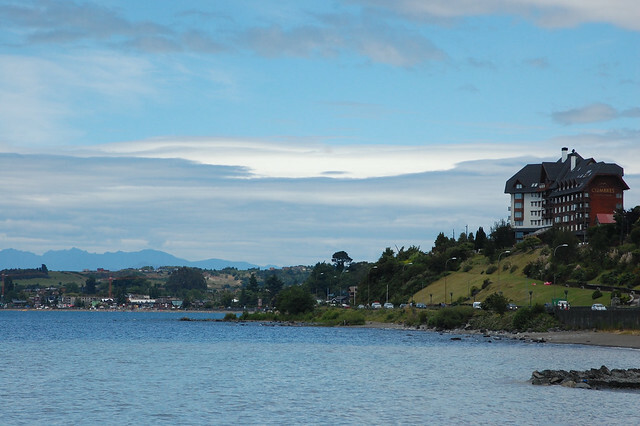 It’s worth walking down this far because you get a great view of the skyline of Puerto Varas, with its distinctive architecture. 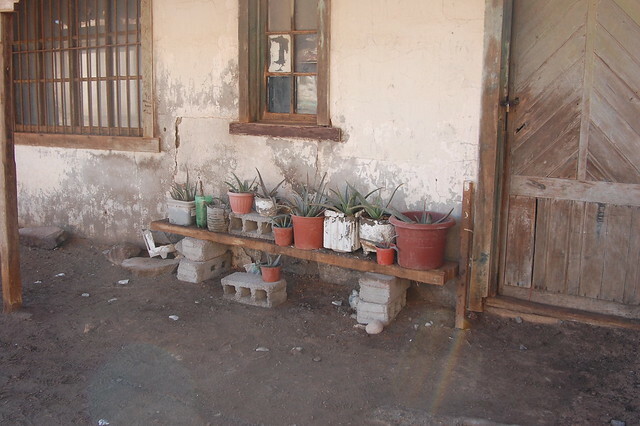 Definitely a far cry from the adobe of northern Chile (where I lived for a year)! 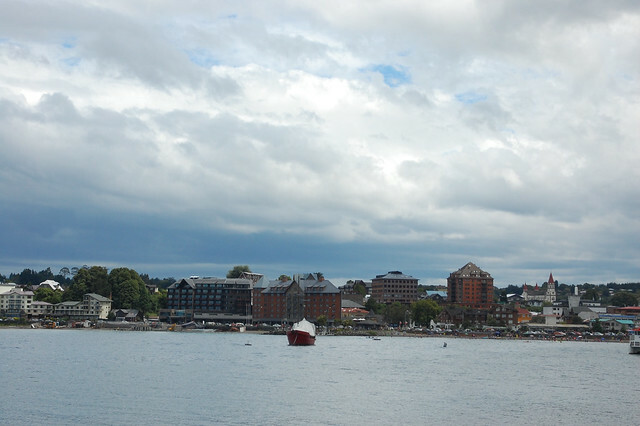 As I visited Puerto Varas just as the seasons changed from spring into summer, the weather was changeable, bringing clouds that came and went over the course of the days. Though the skies were mostly clear when I arrived, the clouds rolled in as the afternoon went on, leading to what I’m calling a “blue sunset.” I’ve mentioned before that I’m obsessed with clouds, so I headed to the waterfront to capture their magic. The patches of sun through the clouds led to teal blue reflections on the water. The colorful clouds also completely obscured the volcanoes, providing an entirely new perspective on the lake. 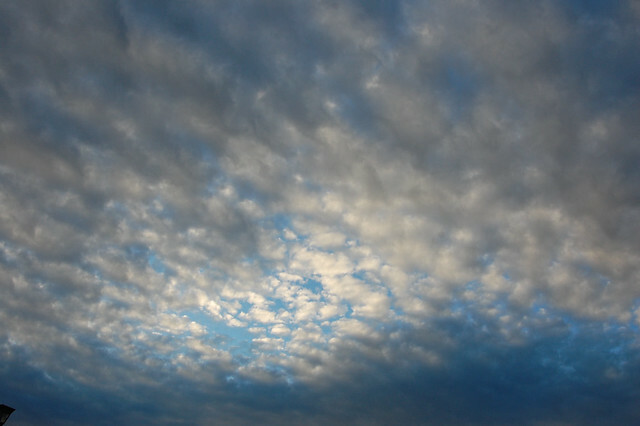 The clouds above were in beautiful formations, glowing with the last rays of the setting sun. Just earlier that afternoon, I had stared at Volcán Calbuco, now completely hidden behind a thick cloud cover. 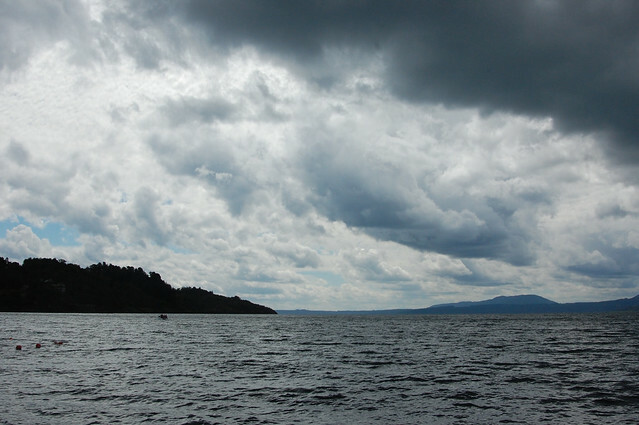 Looking back towards Puerto Varas, the clouds made the skyline look more even more intriguing. I loved the haunting quality of the blue sunset, with the lonely fishing boats floating out in the water. 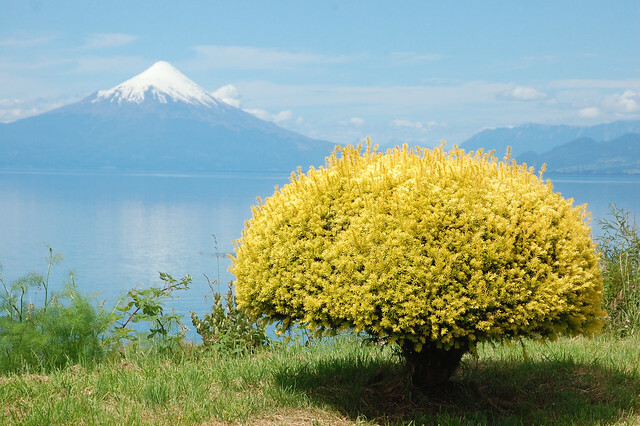 Beyond the blue sunsets, lake views, and volcanoes, many people travel to Puerto Varas to appreciate its German heritage. 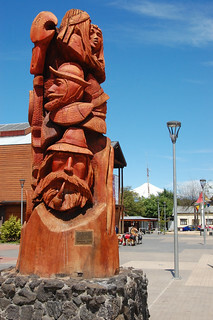 In 1852-3, German immigrants were encouraged to settle southern Chile by the Chilean government, and they brought with them their traditional architecture, as well as their food and beer. 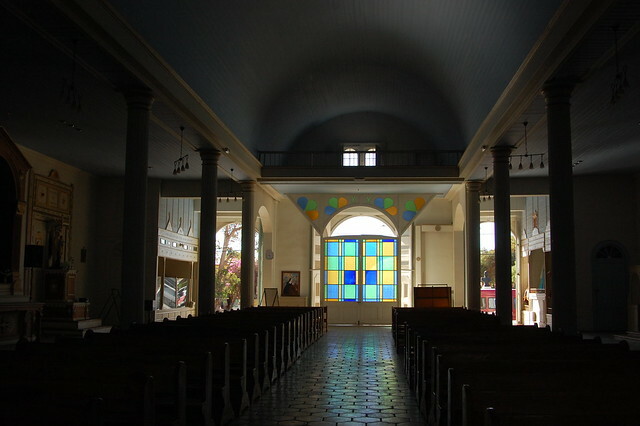 The classic landmark is the Iglesia Sagrado Corazón, which you see in the two photos above. 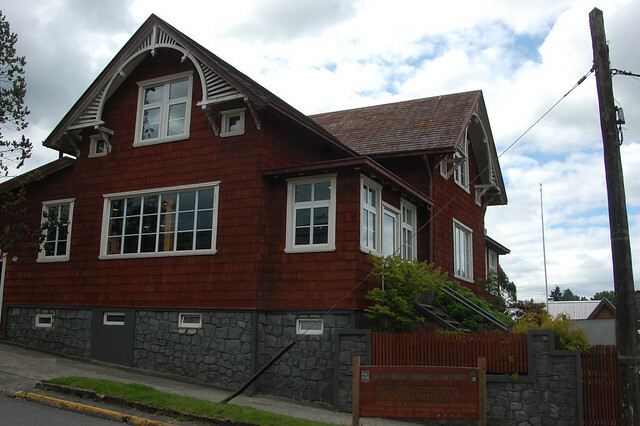 This red and white building is emblematic of Puerto Varas and easy to spot from any viewpoint as it is located up a steep hill. 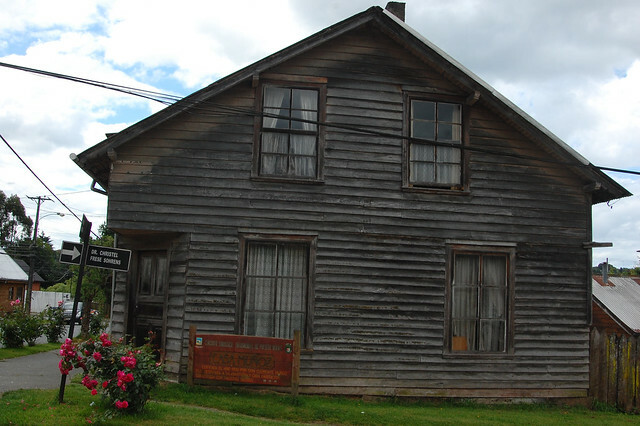 Besides the church, there are at least 18 well-preserved and clearly marked houses constructed in the German style. Some of them currently function as tourist lodging, while others are private homes. It’s surprisingly difficult to find much information on the historical houses, besides this Wikipedia entry (in Spanish). Many of its reference sites have disappeared from the internet. Interestingly, I learned from my research that only a few houses are protected as part of the local and national heritage, so only those in the “typical zone” are protected from demolition. 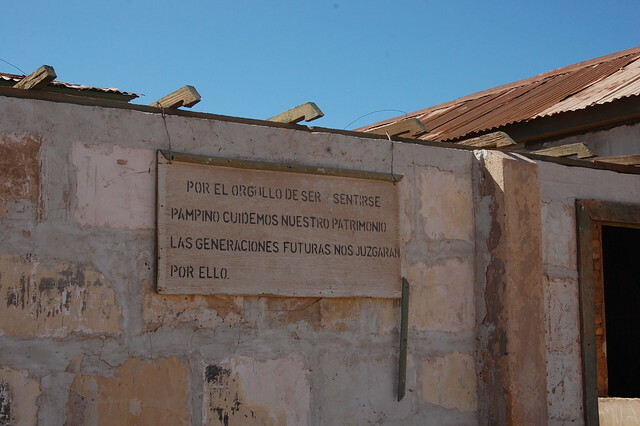 Sadly, this is a common tale in Chile; as I learned from my tour guide on the Isluga tour in northern Chile, the government just does not invest money and resources in protecting its history. 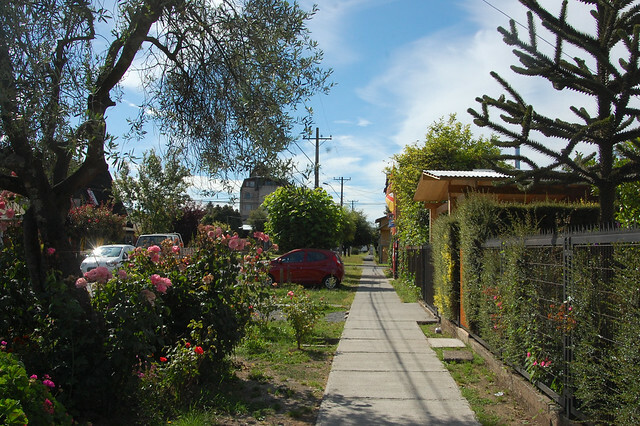 Santiago favors modern buildings, and the suburbs of the capital are filled with streets of identical-looking houses. Sadly, this means that a lot of these buildings are starting to look abandoned (or actually are abandoned), even the cultural center located in the old train station. Kind of sad, but in the end, maintaining old wooden buildings requires investment of time and money, and every town has limited resources. For this reason, it’s better that these historical houses stay in use as attractive sites for businesses. This one currently houses an orthodontist! 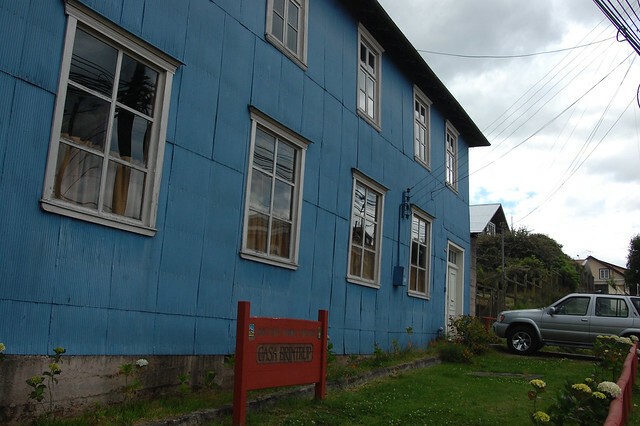 Someone I met in Puerto Varas told me that the people who constructed these houses were not expert carpenters, so the structure inside the buildings is pretty random – they made it work, somehow, but it’s not all precise cuts and perfectly fitted connections. 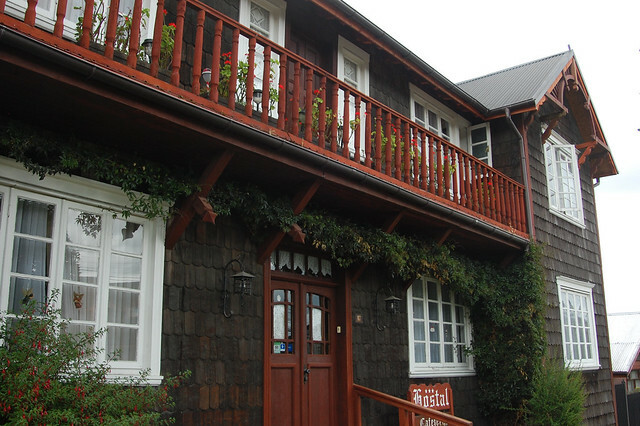 Of course, the best use of these historical buildings would have to be Hostel Margouya Patagonia, located inside Casa Horn. I stayed at this hostel, but in their sister building around the corner, also a historical monument. Sometimes it’s just better to keep using the buildings to make sure they are well looked after. 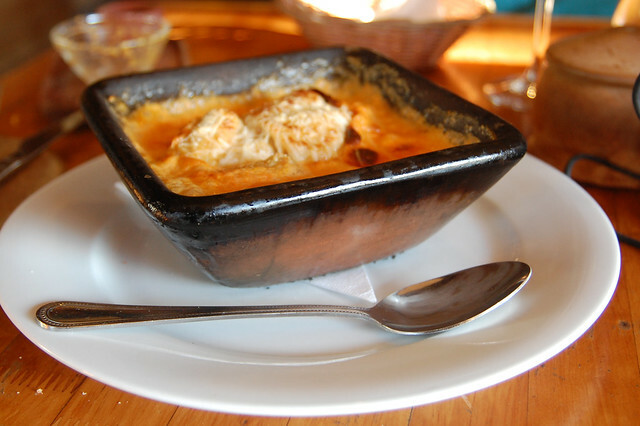 Of course, another reasons that you travel to Puerto Varas is to eat well. While the city does not court luxury travelers quite as much as Pucón, it still tends to be a little more upscale than your average Chilean town. This includes gourmet food options served out of modern food trucks. 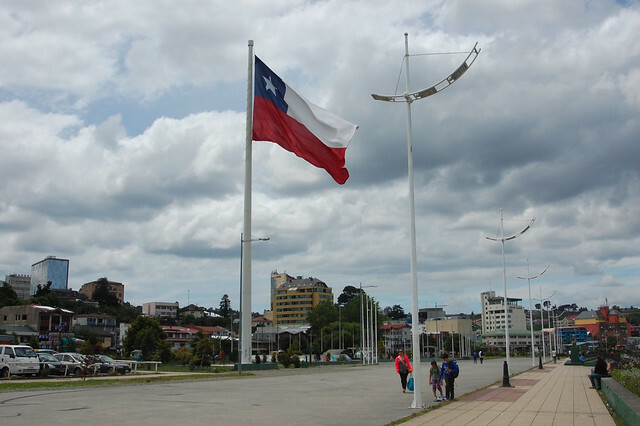 Was I in southern Chile or a major capital city? 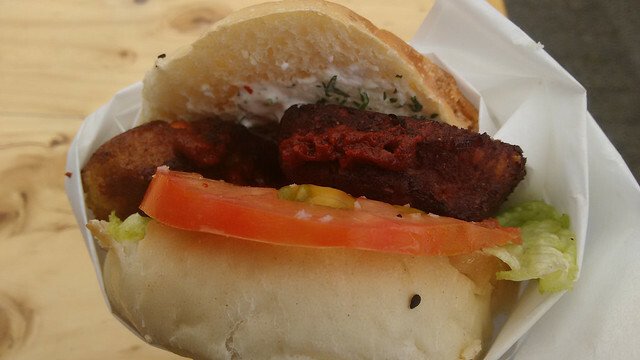 After limited options in the year I lived in the Valle de Elqui, I was excited to see falafel on the menu of the Costumbrista food truck. 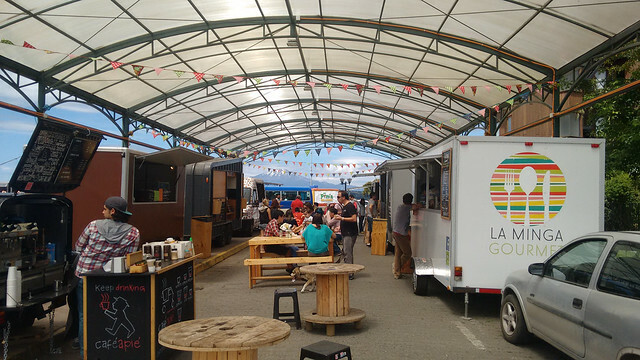 Costumbrista has a small restaurant located on Del Salvador, one of the main streets in Puerto Varas, but they offer slightly more accessible prices as their food truck. Delicious. Okay, so I didn’t actually eat there (because I was still full from the falafel! 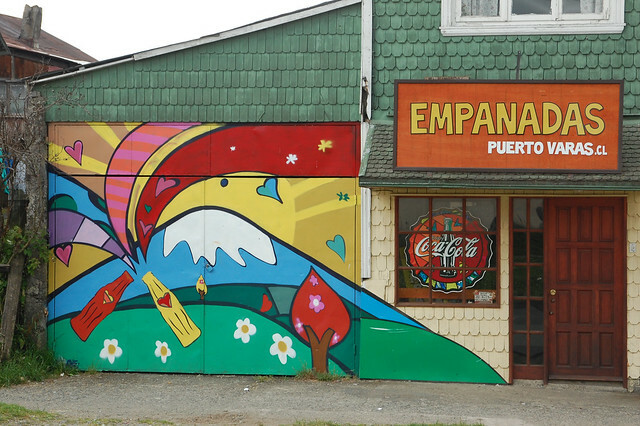 ), but this empanada shop is so cute from the outside. What a perfect advertisement for their business! To be perfectly honest, I actually ended up cooking most of my meals or eating while out traveling around the area. Instead, I chose to buy lots of fresh fruit from the vendors on the street. It was berry and stone fruit season in the south, meaning that the vendors had cups full of raspberries, blackberries, strawberries, blueberries, peaches, and apricots. So delicious – and so fresh! On New Year’s Eve, I headed into town to spend a few hours doing my annual writing exercise, and decided to go to El Barista Caffe, one of the top restaurants and bars in the area. I was not disappointed. 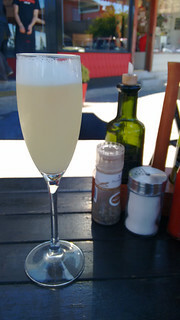 It was the first time they offered me options for pisco sour: dry, classic, or sweet. 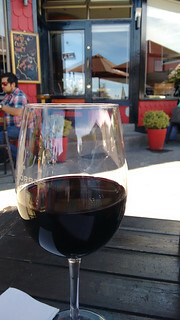 With ample outdoor seating, it was the perfect place to spend a sunny afternoon in Puerto Varas. They are also super traveler friendly; lots of solo travelers stopped by while I sat there. 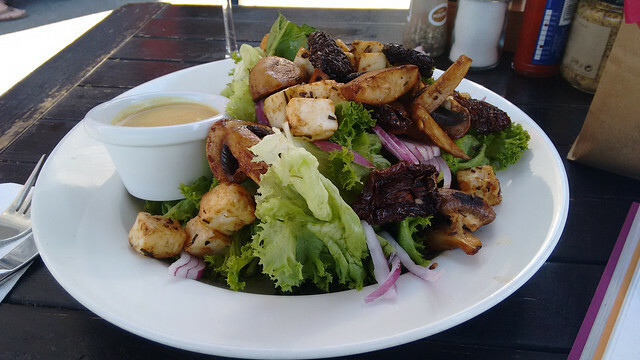 For lunch, I opted for one of the most flavorful salads I’ve had – with fried goat cheese, roasted mushrooms, sun-roasted tomatoes, and an amazing honey dijon sauce. 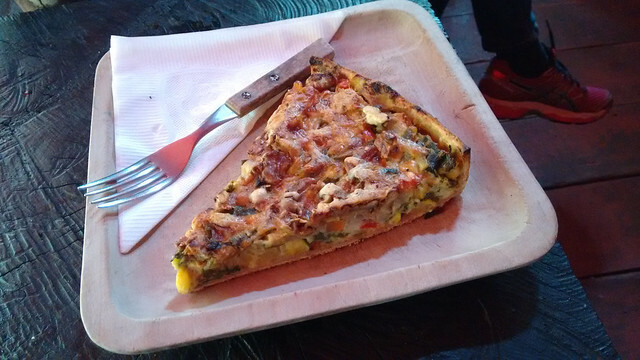 Definitely enjoyed the gourmet flavors – it had been a while. I finished up my outdoor writing session with a glass of red wine before heading back to the hostel for the big New Year’s Eve party. It was a good way to finish out the year – honoring myself and processing all the changes I went through in 2015, especially towards the end of the year. My only regret is that I didn’t try this restaurant earlier in my trip – worth revisiting a few times! 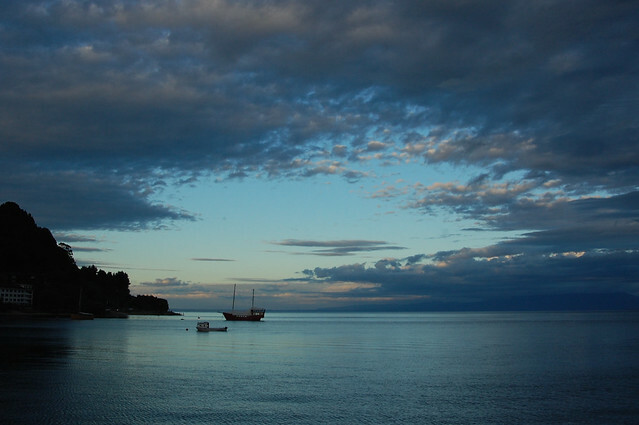 One of the reasons that I headed to Puerto Varas was that I needed somewhere awesome to spend New Year’s Eve. After a successful solo Christmas in Pucón, I knew that Puerto Varas had just the right social atmosphere for my first solo New Year’s Eve. 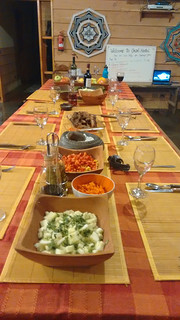 As mentioned above, I stayed at Hostel Margouya Patagonia, which had so many guests in high season that they opened a sister site in their usual English school location. The best part of their location? The giant backyard, perfect for a barbecue attended by 30+ people. And the crowds kept rolling in as night fell. 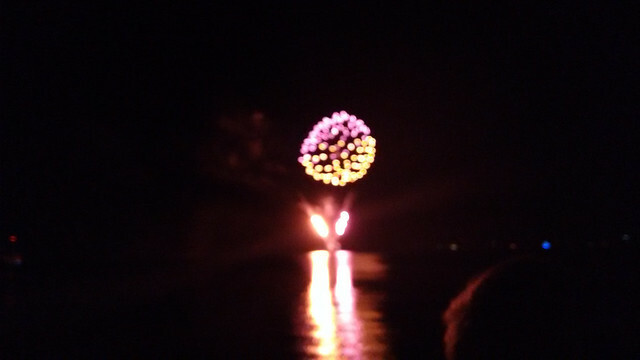 Right before midnight, the city of Puerto Varas puts on a simple, but lovely, fireworks display over Lago Llanquihue, captured in my blurry photo, above. The entire hostel headed down to the waterfront before then going out dancing to ring in the new year. 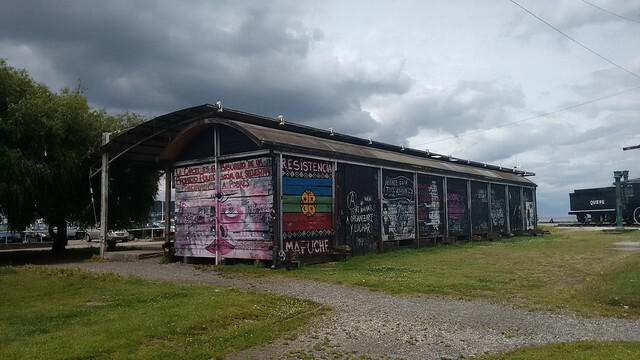 Even though I’d booked an early bus to Chiloé on January 1, I appreciated the good vibes of my fellow hostel guests and felt it was the perfect way to end my stay in Puerto Varas. 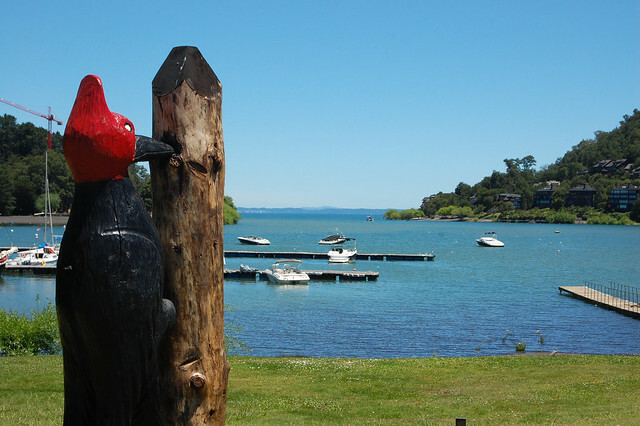 Puerto Varas is an excellent place for a longer stay, especially if you need a place to rest for a few days on an extended backpacking journey. 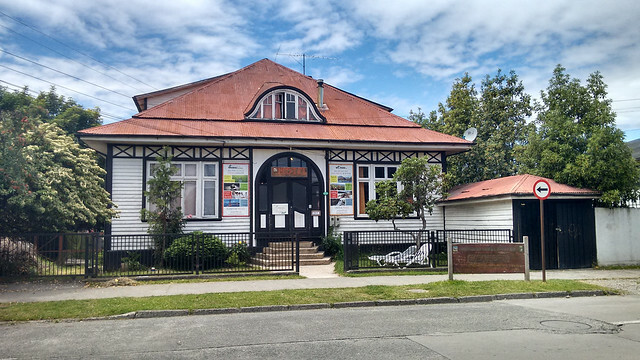 There are enough interesting restaurants and unique shops around Puerto Varas to make wandering around quite fun, and there are plenty of cultural and adventure activities around the area. 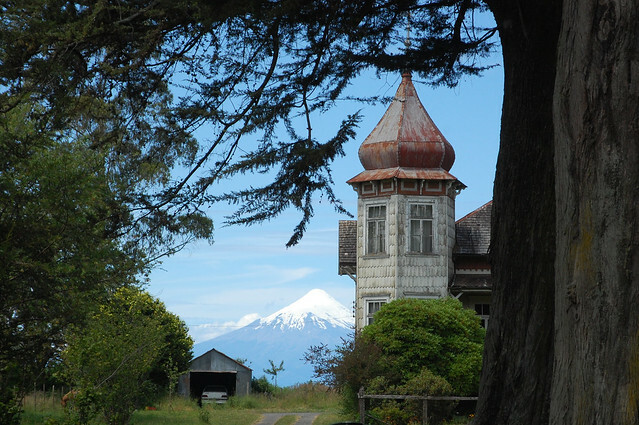 Make sure to go on the walking tour of the historical homes of Puerto Varas. Your hostel should be able to provide you with a map, or ask at the tourist information center downtown. 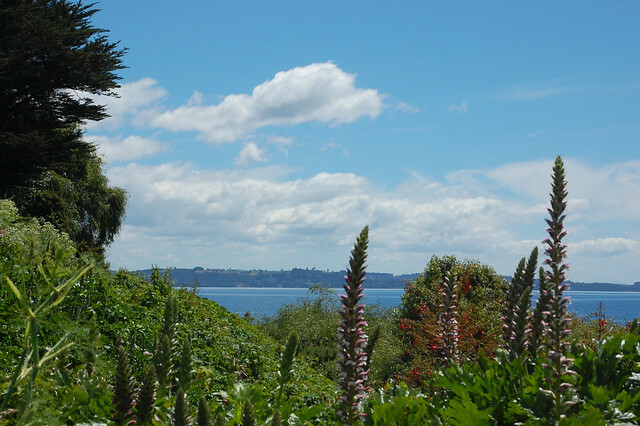 There are two scenic viewpoints above Puerto Varas, one a 30 minute trek up the hill in Parque Phillippi, and the other up Monte Calvario. I stayed at Hostel Margouya Patagonia, a highly recommended hostel run by Pierre, a Frenchman fluent in Spanish and English who takes his business very seriously. The hostel has a complete kitchen and they offer lots of tours around the surrounding area, especially in high season. They also rent bikes for the ride to Frutillar, saving you time and money. I highly suggest having a meal, coffee, or drink at El Barista Caffe! 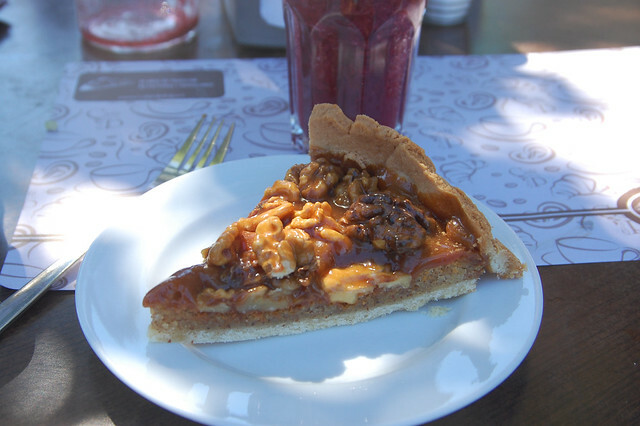 There are many, many cafes in Puerto Varas which serve the region’s famous kuchen, or German-style cakes topped with regional fruits. Cafe Danés also came highly recommended and always seemed really busy. Based on my experience at their food truck, I would also recommend Costumbrista. There are lots of good eating options – look around! Besides checking out the beaches and going on the walking tour, you should try to get out and about in the Lakes Region. There are a LOT of options. 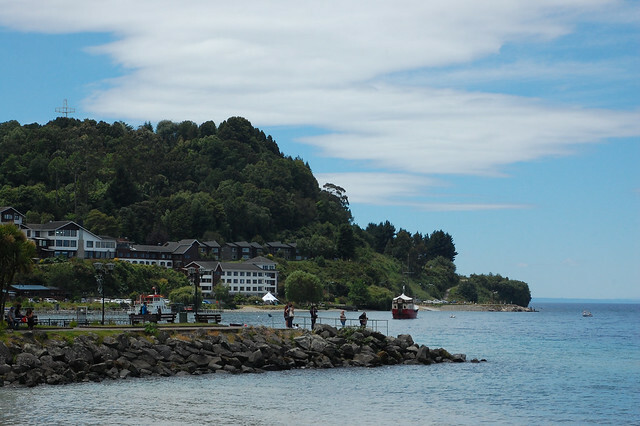 You can take a local bus to Frutillar, a cute town on the shores of Lago Llanquihue, known for having a lot of kuchen and musical performances (post forthcoming!). The more ambitious can do the 30km bike ride to Frutillar… and then head back. I opted to bike only to Llanquihue and Totoral, about 17km, avoiding the super steep hills and making my ride back much shorter! (More details in my future post.) 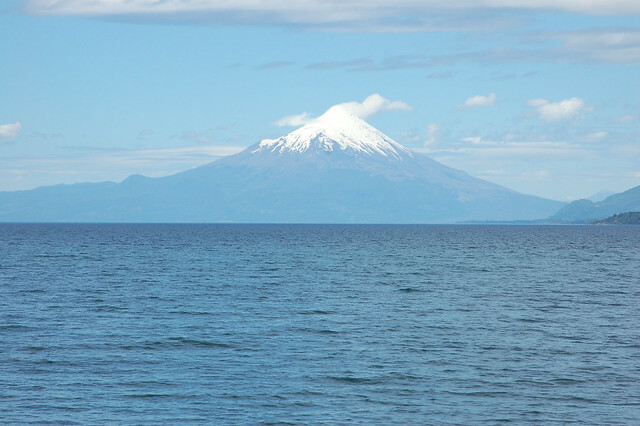 Besides Llanquihue, you can head in the opposite direction towards Ensenada. 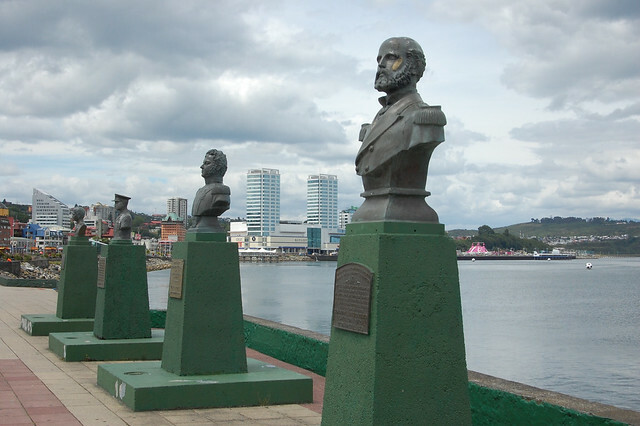 Puerto Octay is another town beyond Frutillar which is more authentically German than touristy Frutillar. 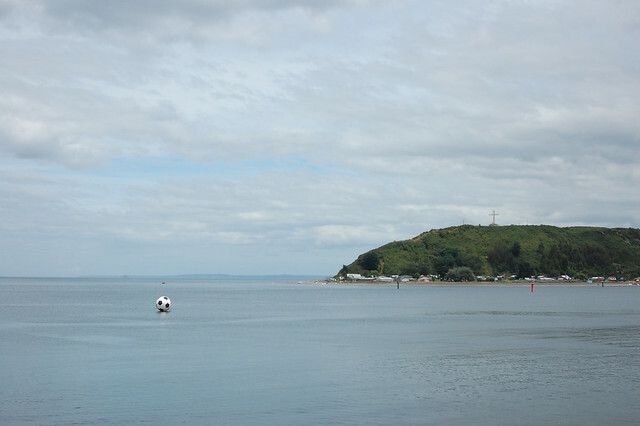 For water sports, you can rent canoes or going kayaking in the bay. My hostel offered a sunset kayaking option, taking us to a nearby lagoon and ending with us kayaking in Lago Llanquihue as the sun set behind us. This was an an amazing experience that I’ll document in a future post. 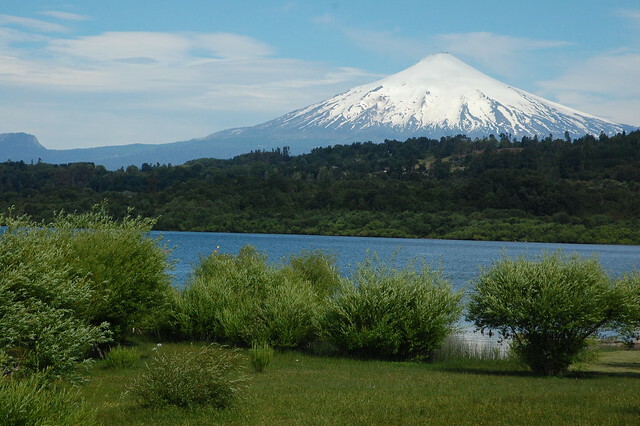 If you’re interested in trekking, there are several routes located around Volcán Osorno that are easily accessible by public transportation. The most common route is on the Sendero Desolación and the extension, the Sendero Los Alerces (information here, in Spanish). 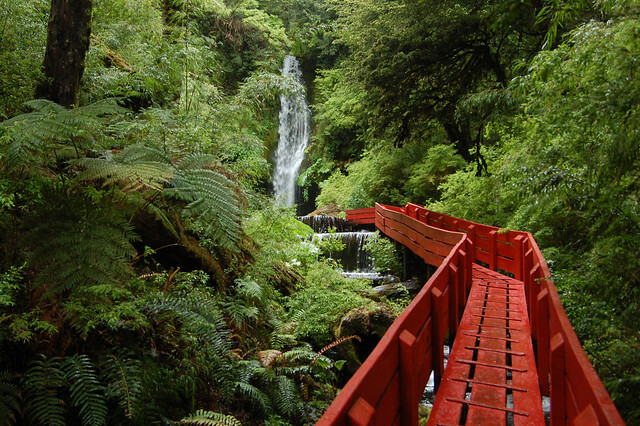 For the really ambitious, there is another extension to the Rincón del Osorno trail, which leads back to Petrohué. I opted not to do this hike because there are giant flying insects that come out in late December in January which make the hike just about swatting insects. 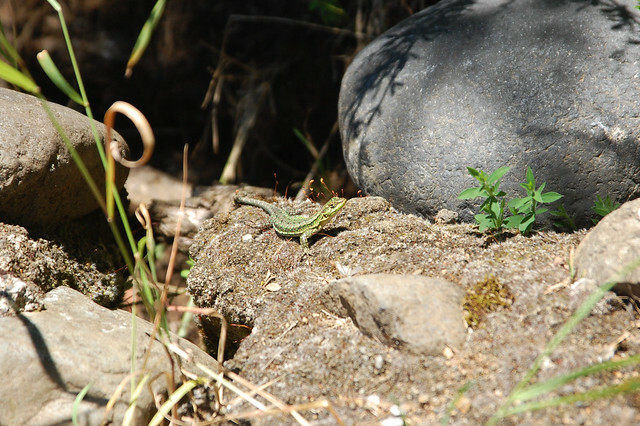 (I ran into these insects in the Valdivia area a week later!) The other trail is the Sendero Solitario, which you can read about here (in Spanish). After trekking, most people stop by the Saltos del Petrohué, pretty waterfalls located in the Parque Nacional Vicente Pérez Rosales. 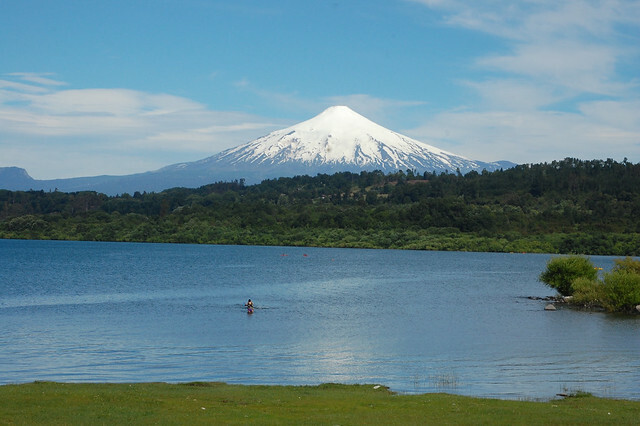 Tour agencies also offer trekking up Volcán Osorno followed by mountain biking down. 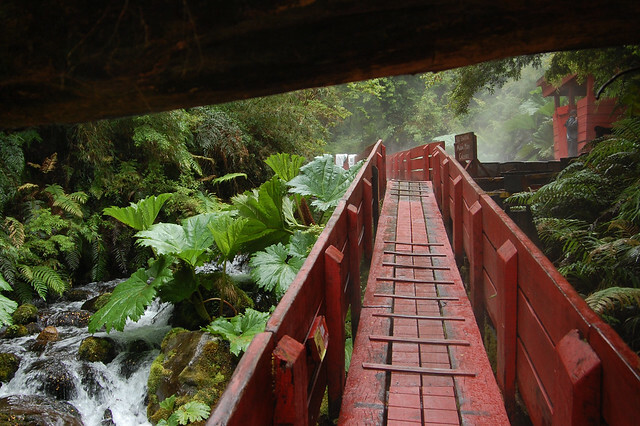 There is no entry fee at the national park, and the bus from Puerto Varas to Petrohué costs $2500 CLP each way. Entry to the Saltos de Petrohué costs $1500 CLP. 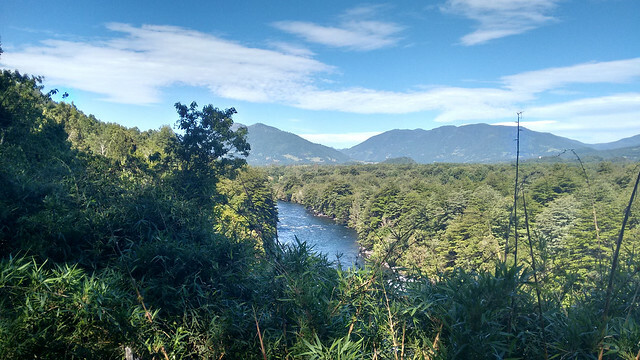 For fans of water sports, there is also the possibility of going rafting in the Río Petrohué, though the owner of the hostel where I stayed told me that it wasn’t really worth the cost (especially since the river is rather far away from Puerto Varas). 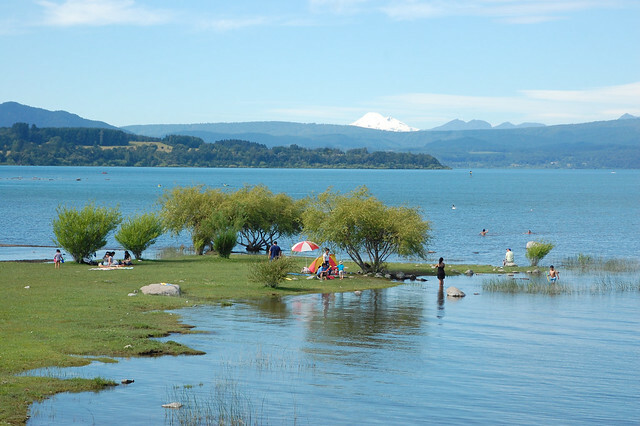 If you’re lucky, you can find a tour to Lago Todos Los Santos, a less-visited but beautiful lake located on the other side of Volcán Osorno. This description in the New York Times is magical. The one thing I really wish I had done was spend some time in the Valle Cochamó, a beautiful valley located near Puerto Varas. There are multiple day horseback riding trips that I definitely want to do on a future visit. 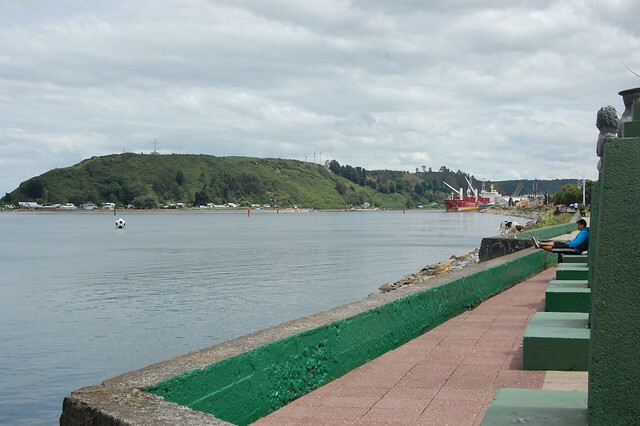 Unforutately, I was short on time and really wanted to visit Chiloé. When I head back to Chile to visit Patagonia and hopefully the Carretera Austral, I will definitely spend some time in Cochamó! 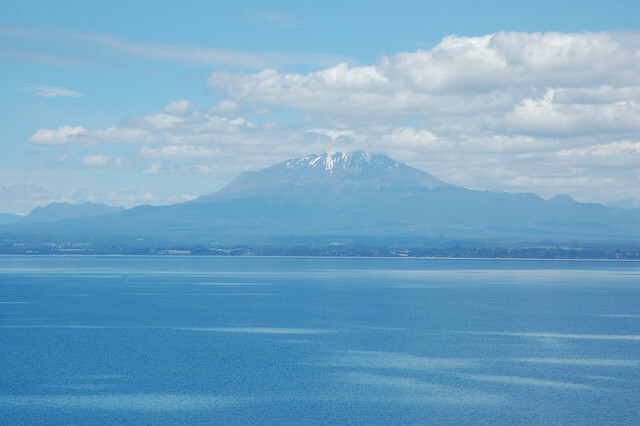 Lest you’re sick of photos of gorgeous blue lakes and volcanoes, this is my last post on the region of Araucanía in southern Chile – and probably my favorite place in the area. On my last day in Pucón, I thought I’d go horseback riding, but with all available spots booked up due to high season, I opted for a low-budget trip to nearby Villarica instead. 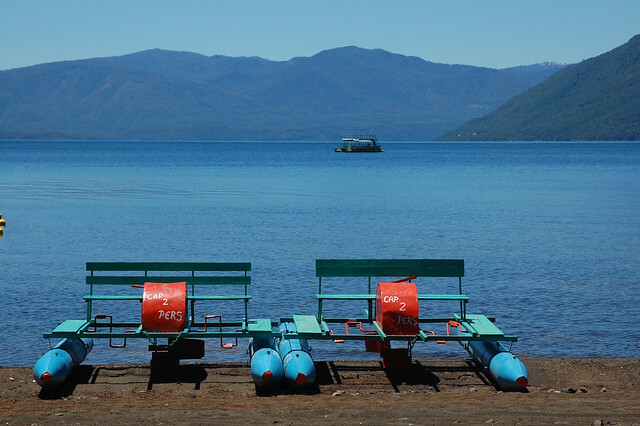 Villarica is a small city on the other side of Lago Villarica, which maintains closer ties to its Mapuche heritage and promised to have a little more character than tourist-catering Pucón. I was not disappointed. I hopped a bus in Pucón for the 30 minute ride to its neighboring city, and before I knew it, I was in downtown Villarica. 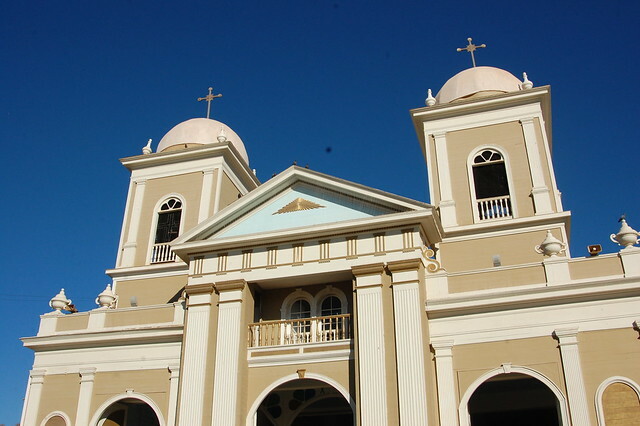 From the moment of arrival, Villarica feels different – like a place where normal people live and work, with lots of businesses lining the main streets, shopping complexes, and actual houses with lawns in front of them. With wide sidewalks and a relatively compact downtown area, it’s a pleasant place to wander around aimlessly, just seeing what you come across. I started off my tour in front the municipality building, where I was impressed by the attractive wooden buildings, such a difference from the adobe in the north. I appreciated seeing Villarica decked out for the holidays, with strings of lights dangling from its main buildings. 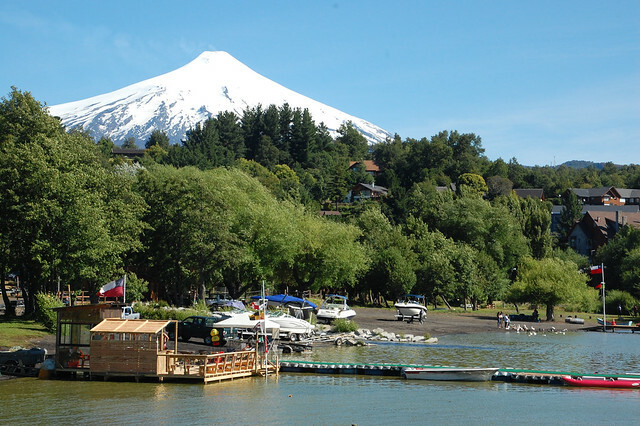 As the map shows, there are only a few tourist attractions in Villarica, making it an easy place to get to know in an afternoon – but well worth the visit! As it was a holiday weekend, the library was closed, but I managed to check out the ruka located inside the Mapuche cultural center. 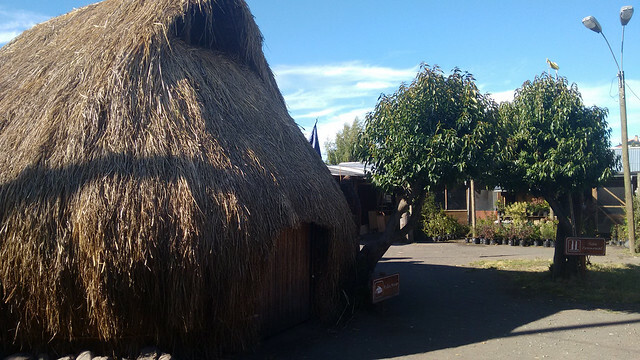 The ruka (sometimes written ruca), is the traditional housing structure made of straw and mud, used by the Mapuche people who still live in southern Chile (more info in Spanish here). For those who don’t know, the Mapuches are the indigenous group that still have a large, powerful presence in southern Chile (and Santiago, for that matter) and are known for resisting the invasion of both the Incas and the Spanish conquistadores. I appreciated the brief but interesting opportunity to get to know a little more about Mapuche culture both by checking out the ruka and the stands filled with traditional foods and crafts around the cultural center. 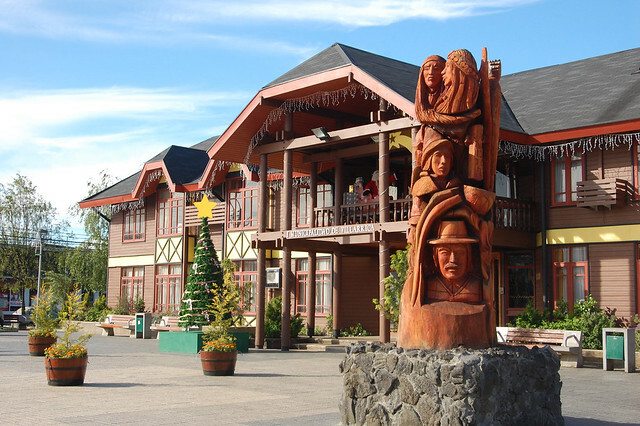 The other aspect of Villarica that was fascinating to me were the multiple artisan markets located near the Municipality, down several main streets, and near the Mapuche cultural center and library. This region is especially known for its woodwork, evident from the prevalence of wood buildings all the way to wooden kitchenware. You can also find pottery and knitted goods – I was particularly impressed by a stand run by a collective of women artisans boasting high quality knitware, located near the municipality buildings. 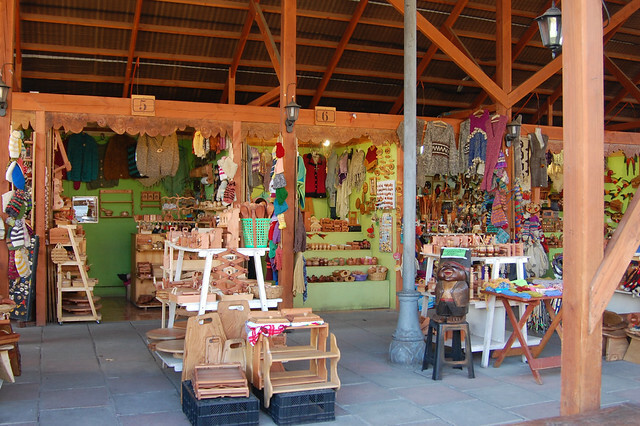 Beyond handicrafts, there are several interesting stores all around Villarica. I found myself wandering around, taking my time, and window shopping. This gave me a chance to fully appreciate the different vibe of Villarica. It seems like a pleasant residential city – and it is actually growing in popularity among expats exactly for this reason. With lots of nearby services (read: giant shopping centers) and a compact downtown area, it’s also appealing to Chilean families. And let’s not forget the food and nightlife. 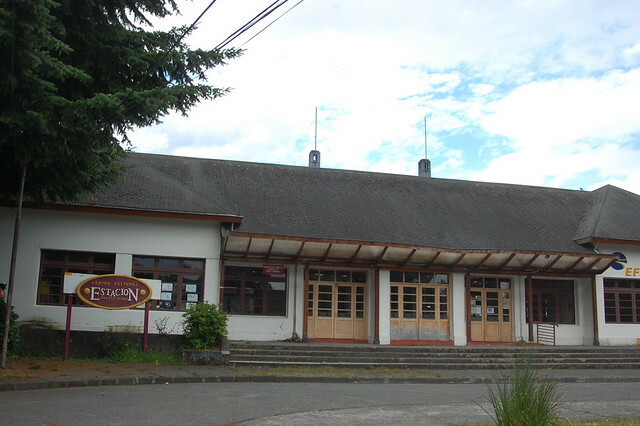 There are tons of spacious restaurants and bars scattered around Villarica. I think this would be a fun place to go out, if that’s what you’re into, and probably a little more affordable than Pucón. By this point in the afternoon, I was sufficiently charmed by the city of Villarica, so I decided to continue my explorations and headed to the lakefront to enjoy the rest of the sunny day. 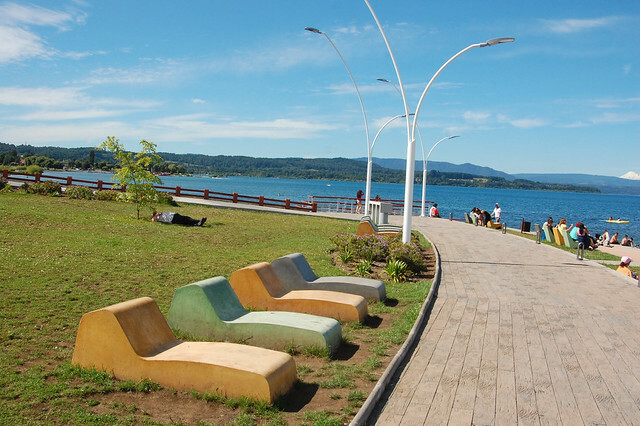 When I mentioned that I was curious about the fairly new costanera (promenade) along the shores of Lago Villarica, a resident of Pucón told me that the views from his city were better. WRONG. 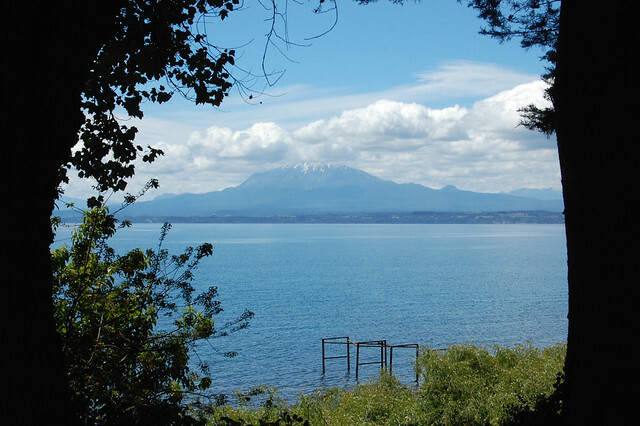 Villarica’s costanera provides gorgeous views of the blue, blue lake and the mountains in the distance. 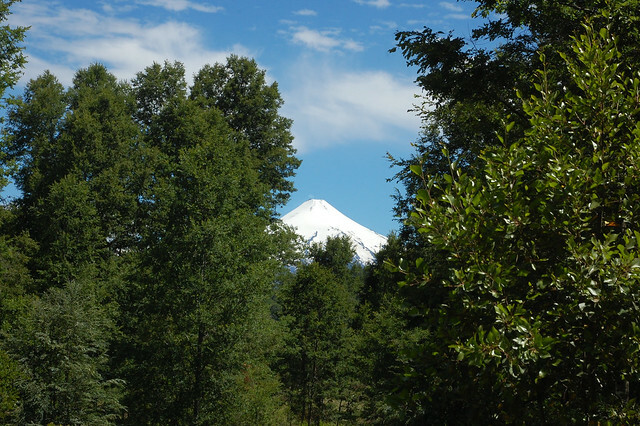 Even better, the views of Volcán Villarica are unobstructed by hotels and new luxury buildings in construction – for the most part. I was captivated by the views of the volcano in all its glory! I think the most charming part of the costanera is the fact that there are so many little lakeside parks, or rather, grassy areas with trees, right on the shores of the lake. This is a perfect place for a picnic with friends or family, or a place to sit down with a book and spend a couple of hours in the sunshine. Because the costanera is so long, it’s pretty easy to find a quiet corner to relax – you don’t have to go all the way to the beach. 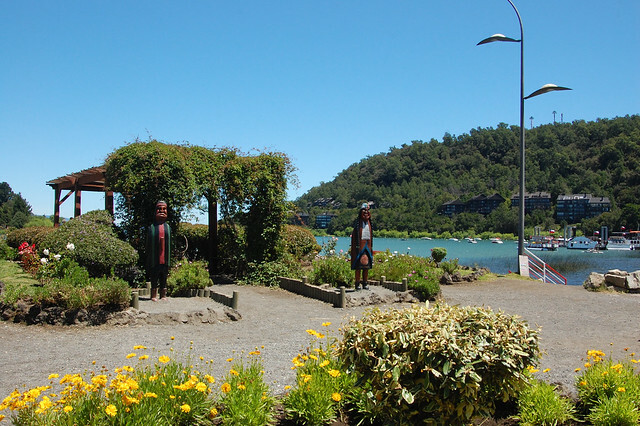 As far as I’m concerned, the decision to construct the costanera for Chile’s bicentennial celebration in 2010 was an excellent one – and for some reason, Villarica’s gorgeous lakefront views still seem like a well-preserved secret, perhaps because most foreign tourists base themselves out of Pucón. 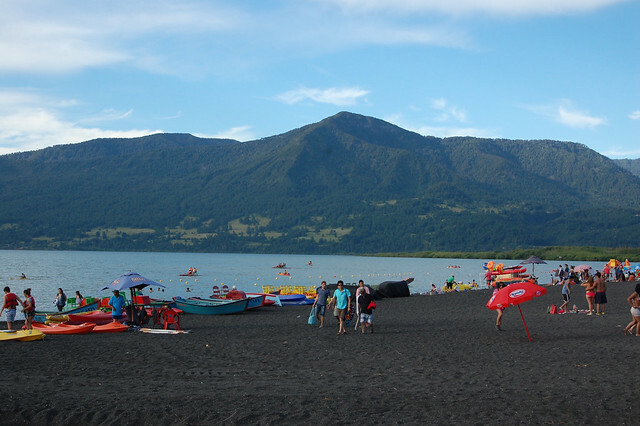 After wandering the length of Villarica’s costanera from the center of town, you end up at Playa Pucara, a black sand beach popular among vacationing Chilean families. Obviously, this beach is not at all a secret, nor does it want to be! 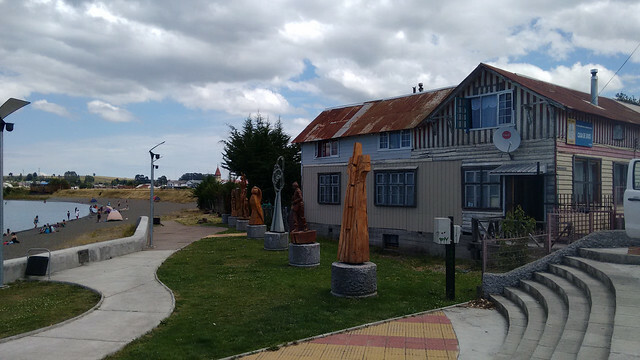 There are plenty of services located by the beach, including basic cafés, public restrooms, and several little food stands with Chilean favorites like mote con huesillo. Due to the open spaces, the beach never feels crowded; there’s room for everyone. With the strong sun and hot temperatures of summer, it’s a good place to go for a swim. Besides swimming, entrepreneurial Chileans offer rides in their paddleboats and fishing boats – lots of little stands line the shores near the beach. Although it was much too hot to consider lying for long on these concrete beach chairs, they are a nice touch to the beautiful boardwalk park. The urban planners definitely knew their audience and came up with everything. 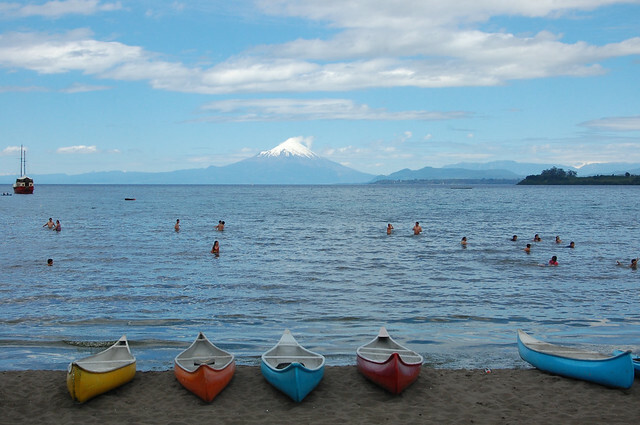 Of course, the best part of Playa Pucara is its views of Volcán Villarica. Like many others, I rested for a while on the concrete stairs just to contemplate the views. 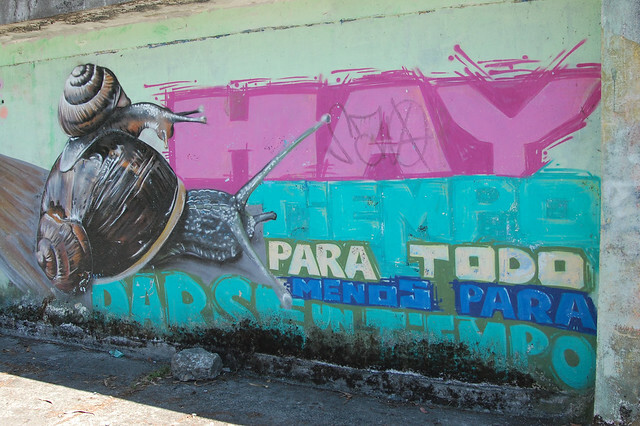 I have to admit – I was off my street art game during my visit to Villarica and only snapped a couple of pictures. 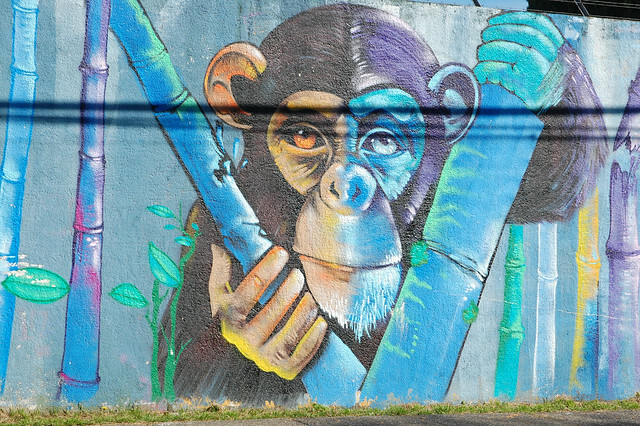 While Pucón is fairly sterile, Villarica has more character and there are lots of murals to discover while walking through the streets. I wish I’d taken more pictures, but at least I started paying more attention as I kept traveling! 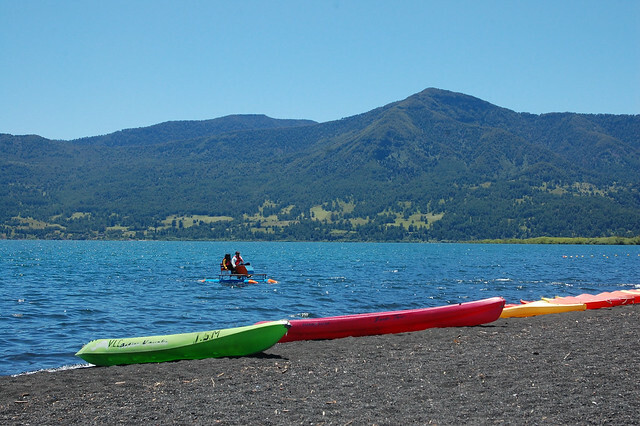 As you can see, Villarica is well-worth at least an afternoon during a visit to Araucanía and Pucón. 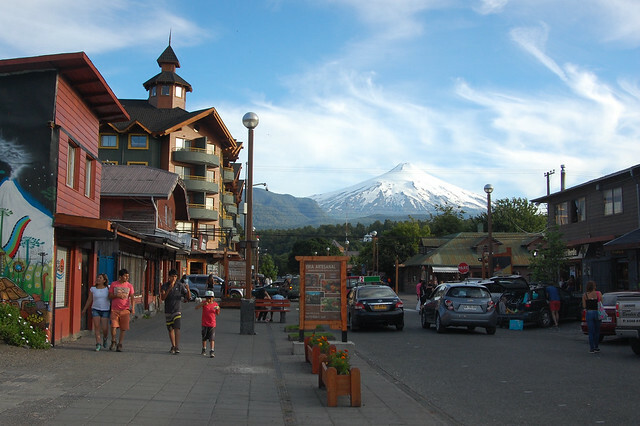 Many guidebooks suggest staying in Villarica as a more relaxed alternative to Pucón, and I agree; Villarica caters towards Chilean tourists and it’s easy to walk around without feeling like someone is trying to sell you a tour or invite you into a pricey restaurant. Villarica definitely captivated my imagination with its laidback character and authentic charm, and hopefully someday I’ll be back! First of all – GO! 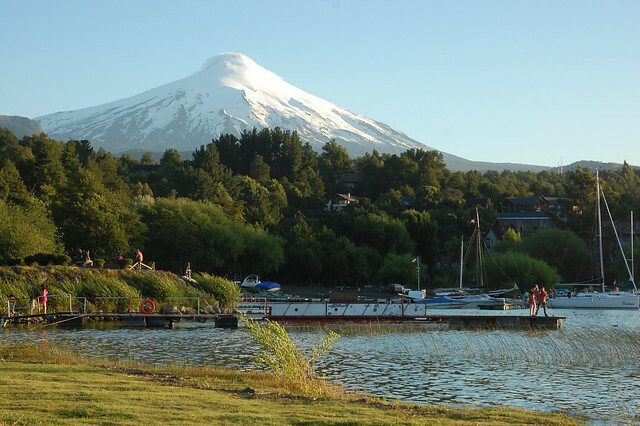 Most foreign tourists end up staying in nearby Pucón, whereas Chilean families gravitate towards Villarica. 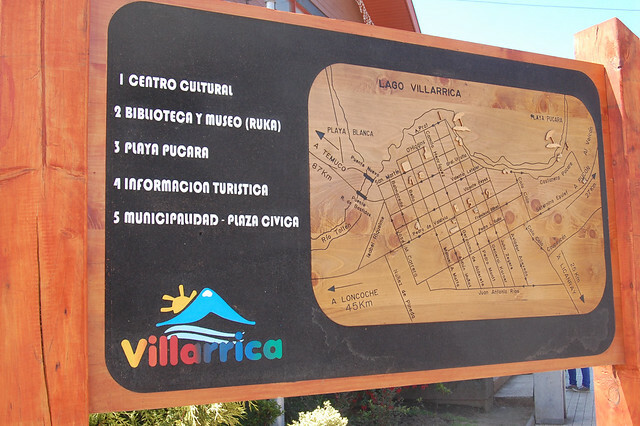 Because Villarica is a larger, more residential city, it does not give off that overwhelming tourist vibe, even though there are plenty of shops for artisan goods as well as museums. Buses from Pucón to Villarica leave from Calle Palguín, across from the JAC bus terminal (if I remember correctly – double-check with a local!). 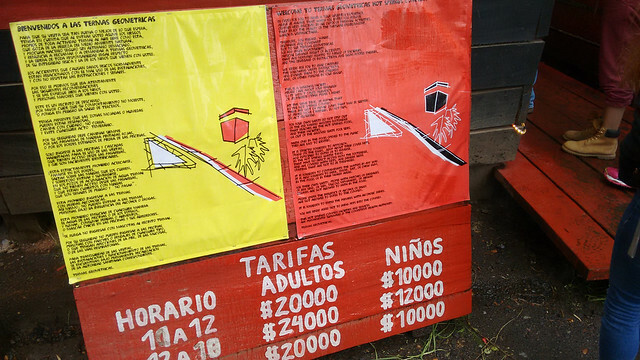 Rides each way cost $1200 and buses leave every 10-15 minutes or so, making stops along the way to Villarica. 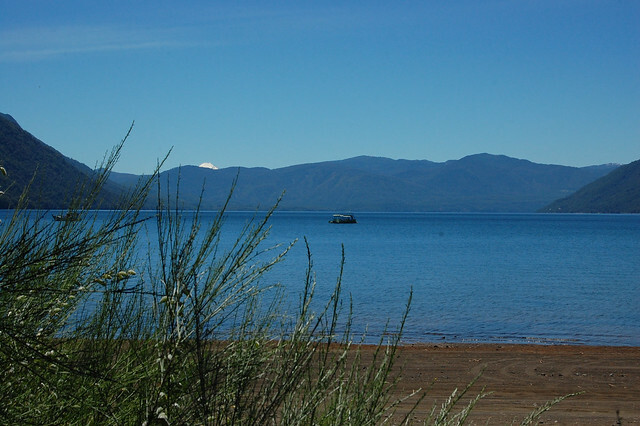 The trip takes about 30 minutes and drops you off at the terminal in Villarica, located on Pedro de Valdivia between Anfión Muñoz and Gerónimo de Alderete. Make sure to walk down to the costanera all the way to Playa Pucara, as the views are truly stunning. I had a tough time narrowing down the photos for this post. Bring a beach towel or blanket and a book and be prepared to spend an afternoon enjoying the views. Don’t forget sunscreen – the sun is super strong reflected off the water. Though I did not stay there nor check out the accommodations, Mapu Hostel probably would have been my lodging of choice if I had stayed in Villarica. 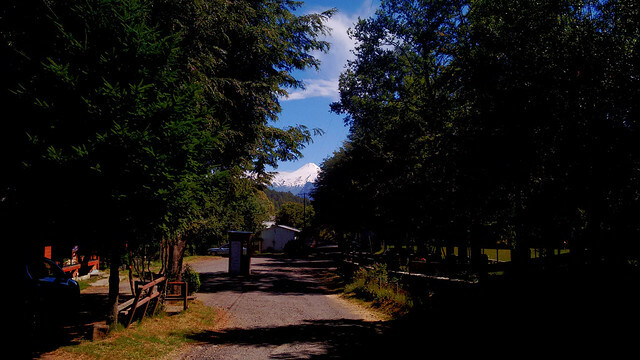 If I go back, I will definitely stay in Villarica over Pucón! 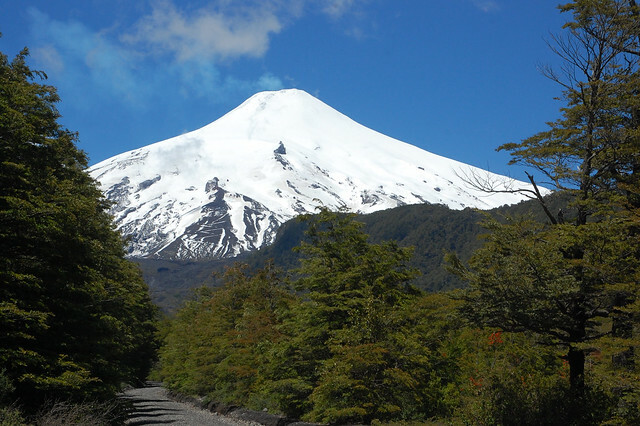 All of the buses that leave Pucón and head north towards Santiago and south towards Patagonia pass through Villarica, so you could spend an afternoon there before taking a night bus. While Pucón is an attractive city worth a couple of days of relaxation, the real appeal of the region is the multitude of opportunities to participate in high-adrenaline adventure sports. Mountain climbing? Volcán Villarica is right there. Trekking? Several national parks are within your reach. Rafting? 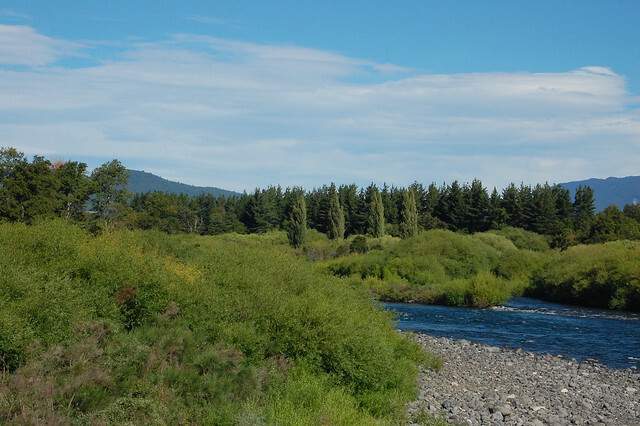 Some of the best rivers in Chile are a short drive away. Horseback riding? 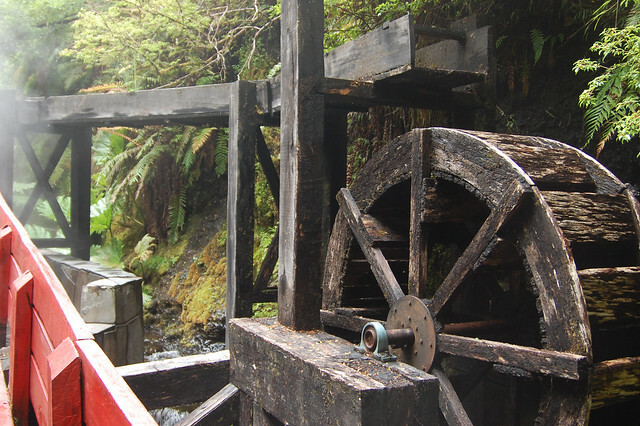 You can even go on a ride through Mapuche villages with a local guide. 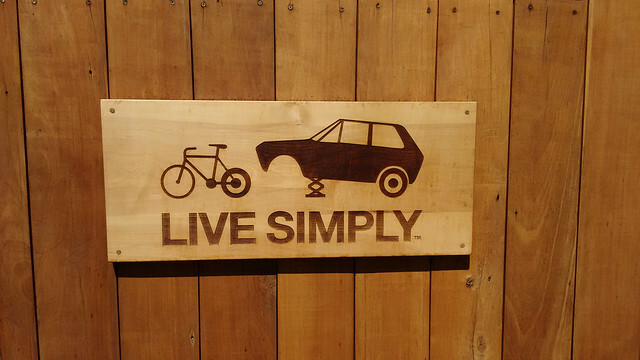 With all of these options, the one that most appealed to me was biking. Back in Boston, I had become a serious urban biker, going on weekly adventures, but after moving to the Valle de Elqui, I had not managed to get my hands on a functional bike, except when traveling. For Christmas, I decided to take myself on a long bike ride to Lago Caburgua and the Ojos de Caburgua, beautiful waterfalls that cascade into aquamarine pools, the so-called ojos, or eyes. As I’ve mentioned, Pucón and the surrounding area are very bike friendly. There are protected bike lanes along the main highway, assuring a safe beginning to any long distance bike journey and enabling you to build up confidence for the roads ahead. After renting a gorgeous new mountain bike from Freeride Pucón, I happily set off on my solo adventure in the gorgeous summer sun. The guys in the bike shop suggested heading to Lago Caburgua first and taking the route along the paved highway, Ruta S-905. Although it involves a climb up a steep hill, the road is paved and that way you don’t spend all of your energy early in the day navigating dirt roads. 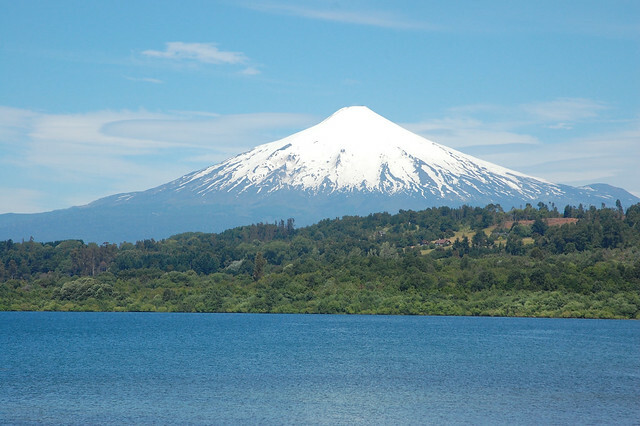 I knew I wasn’t in top biking shape, so I was prepared to rest and walk as need be – which gave me a chance to take in the views of Volcán Villarica from a distance. After an hour or so of biking, I reached my first destination: Lago Caburgua. This incredibly blue lake is surrounded by low, rolling hills covered in green trees. Coupled with blue skies, basically everything takes on a tinge of blue. I LOVE BLUE! Because it was around lunchtime on Christmas Day, the beach was fairly empty, making it a peaceful place to have a picnic lunch and just take in the views. While eating my lunch, I spotted this lizard darting around and couldn’t resist taking a picture. 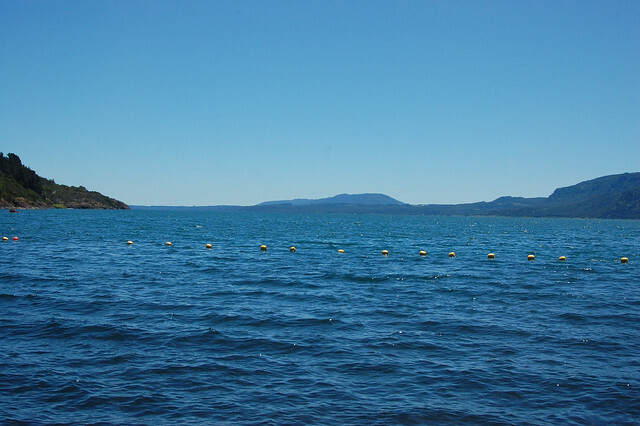 Playa Negra is the most accessible public beach on the shores of giant Lago Caburgua. At the time of my visit, a sizeable portion of the beachfront was under construction, ostensibly to install a malecón and visitor services (are we sensing a trend?). The small street passing by the beach was congested with vehicles, but it was easy to walk or bike in. 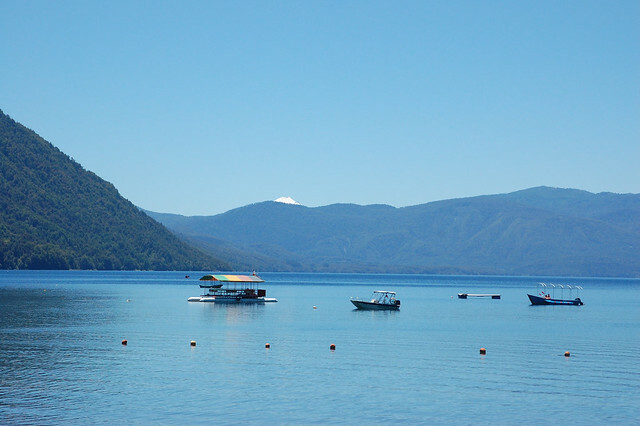 As at Playa Grande in Pucón, there are plenty of opportunities to take a spin out on the calm waters of Lago Caburgua. Paddle boats are pretty much my favorite way to explore lakes – looking at these photos makes me realize that I missed an opportunity! Near Playa Negra, there is also the more exclusive Playa Blanca with its white sand beaches. The beach is only accessible by car and requires you to pay for parking in order to gain entrance. This makes it popular with Chilean families and a little bit quieter than the larger Playa Negra, but not worth including on my itinerary. 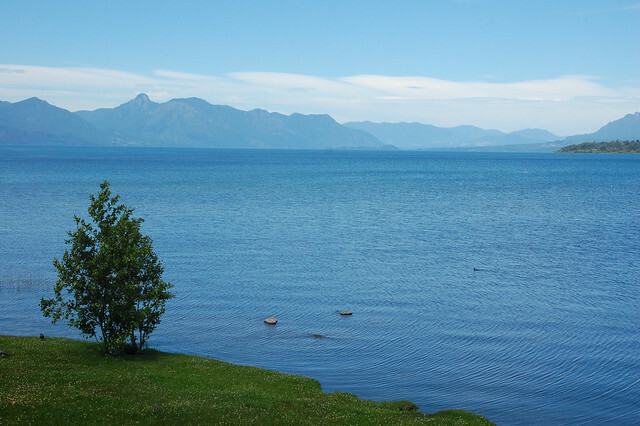 The town of Caburgua is relatively small and the tourist services are mostly located on the main highway as you enter the town and reach the lake. There are several restaurants for tourists located on the road that leads to the lake and a couple basic kiosks just off the beach. 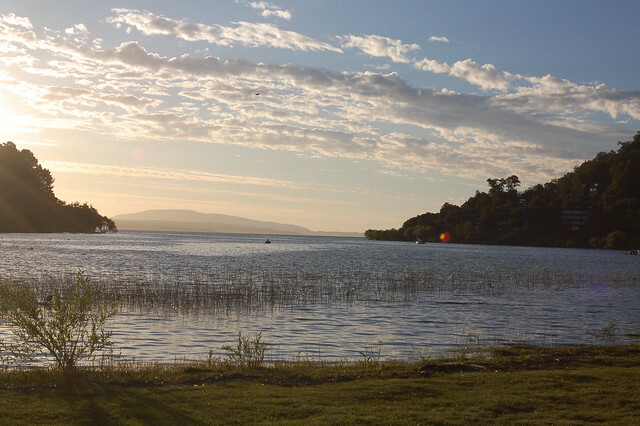 All in all, visiting Lago Caburgua enables you to spend a simple, pleasant day relaxing by the water. After a couple of hours enjoying the beachside views of Lago Caburgua, I decided it was time to head to my next destination, Ojos de Caburgua. 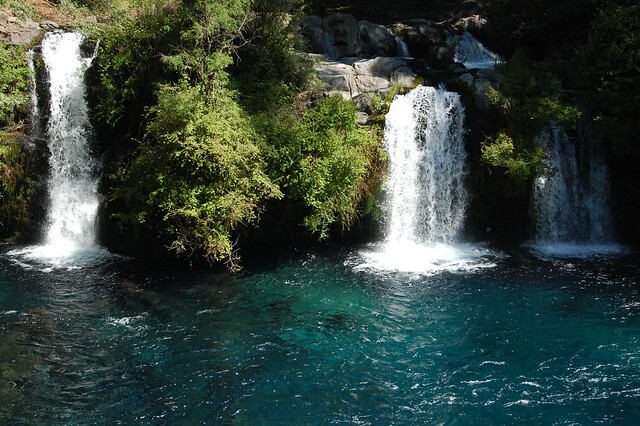 The entrance to the series of waterfalls called Ojos de Caburgua is located off a dirt road detour between Pucón and Caburgua. To get there from Caburgua, I first had to retrace my steps along Ruta S-905, this time heading downhill. I ended up stopping to capture the lovely green fields along the way – did I mention I had been living in the desert for the past year? So much green was fascinating. The detour is by “El Cristo” and is easy to spot as it’s the only major road marked by a number of advertisements for lodging options. 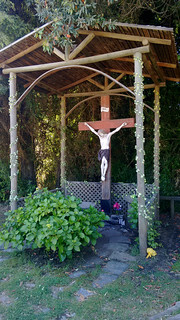 As you turn off the road, you see the little garden chapel with Christ on the cross. I thought it was quite lovely. As you in the below photo, the detour is marked, but it’s hard to spot amongst all the foliage! After turning off the main highway, the road continues along a very bumpy dirt road which only allows one car to pass at a time (and that basically means one bike as well!). As I’ve primarily biked in urban areas, I found the dirt road challenging, but not impossible. I definitely understood why the bike rental shop had suggested going by highway first; I might have gotten discouraged otherwise. 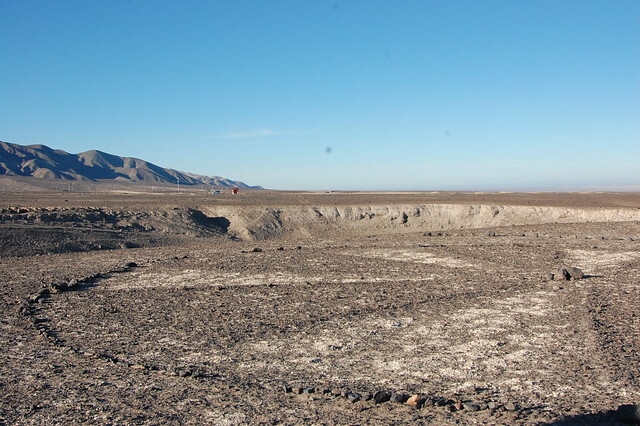 The entrance to Ojos de Caburgua is well-signposted from the road, even giving an estimation of how many kilometers remain. To enter, you have to pay a modest entrance fee, and luckily they have bike racks for securing your bike. Since this is a high transit area, it’s better to leave the bike in a highly visible location than take it to the waterfalls, where it could get snatched. 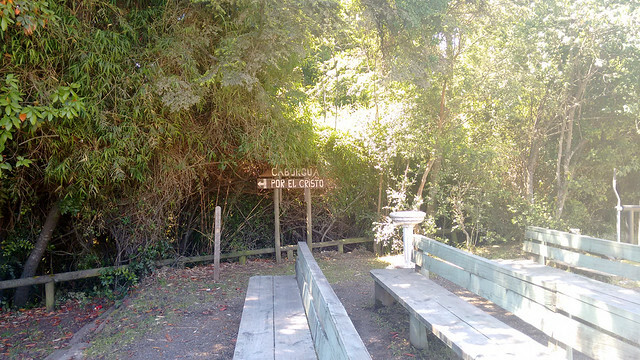 This entrance to Ojos de Caburgua also has a campground, as seen above. 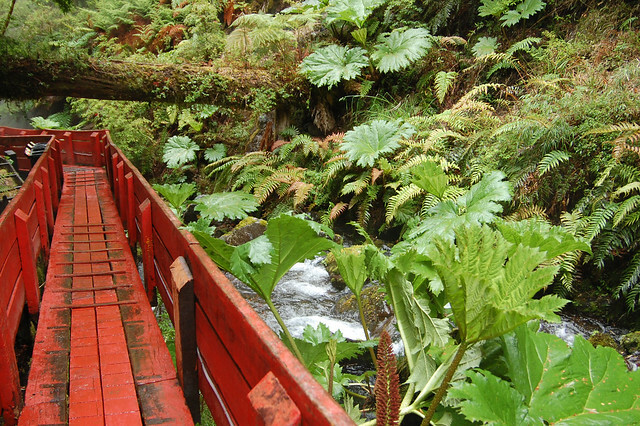 The Ojos de Caburgua are located about 2 kilometers from the main entrance on private property, and the landscape is lovely, even affording views of the majestic Volcán Villarica. 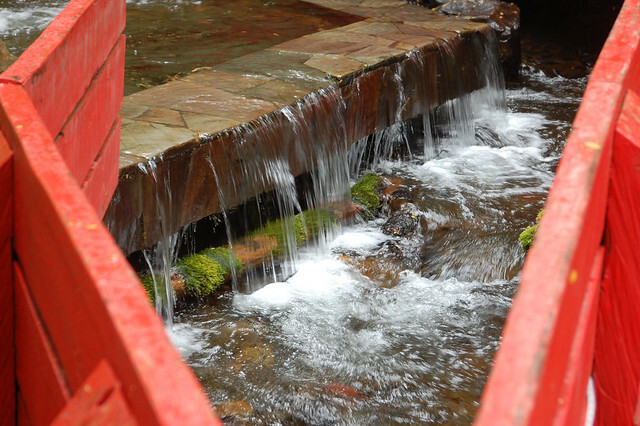 Access to Ojos de Caburgua is by a series of trails and stairs, all leading towards the falls and the gorgeous aquamarine pools. 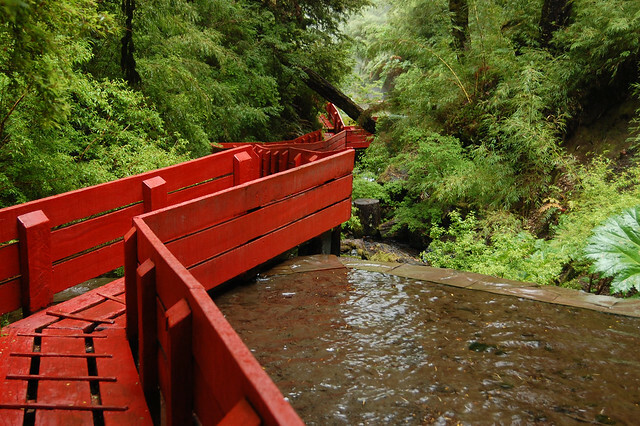 The Ojos de Caburgua are set among Valdivia temperate rainforest, giving a completely different sense of the area than you get from the road. 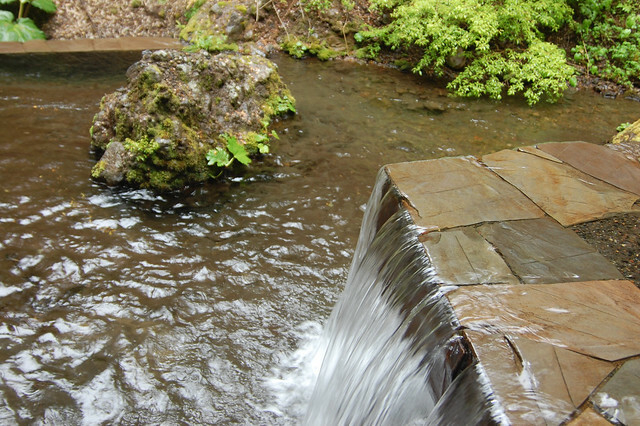 There are several vantage points affording a closer look at the system of waterfalls. I spent about an hour appreciating the sound of the cascading water, climbing around the different trails to see other views of the waterfalls, and just taking in the cool shade of the tall trees. Because there are so many visitors to the Ojos de Caburgua, it isn’t really a place to rest with a book and enjoy the landscape. After a while, I was ready to get back on my bike and keep experiencing the landscape of the hills, forests, and mountains around the area. Of course, I couldn’t leave without taking a selfie! 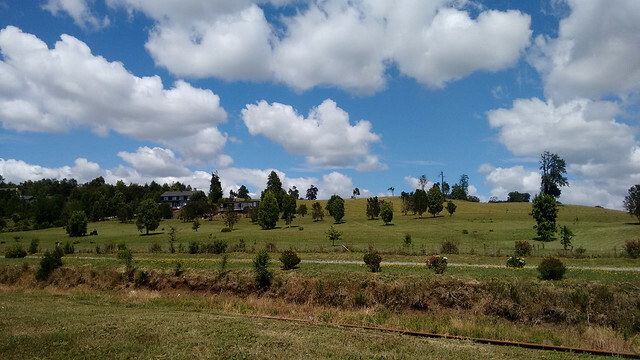 Along Ruta S-919, the gravel road between Pucón and Caburgua, there are lots of beautiful farmlands. 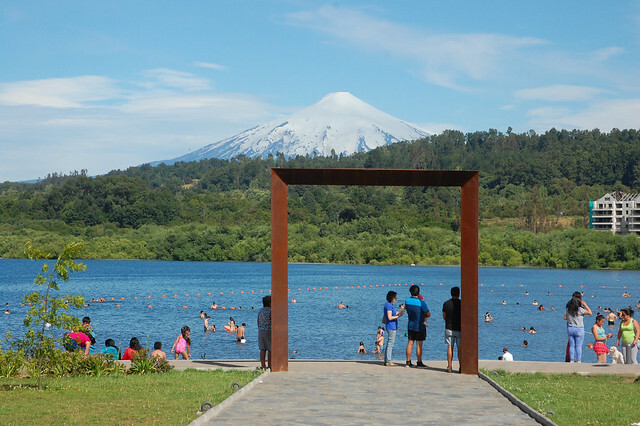 While the urban area around Pucón is increasingly more popular with tourists, leading to more development, the region still maintains its laid-back vibe. 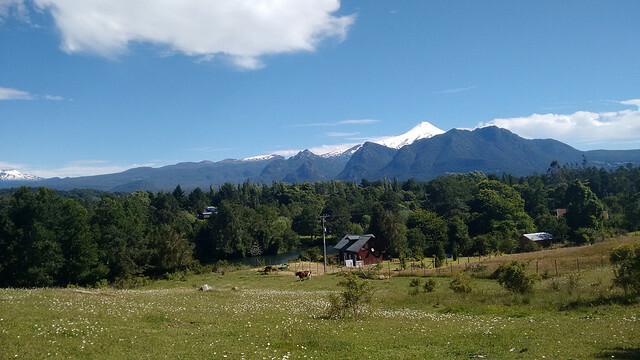 This is just the ambiance of Araucanía – forests, fields, farming. That’s why it’s so popular among people just wanting to get away from their normal routine. Life moves a little more slowly here. At this point in the late afternoon, I was getting tired, and the hilly gravel road was more challenging than I expected – though not impossible. At the same time, it was hard for me to gain momentum because I kept stopping to take pictures of the mountains and fields. Haha! Naturally, these photos show the beautiful landscape, but they do not capture the feeling of biking through the forests and mountains, wind in my hair, just feeling dwarfed by the wonders of nature all around me. 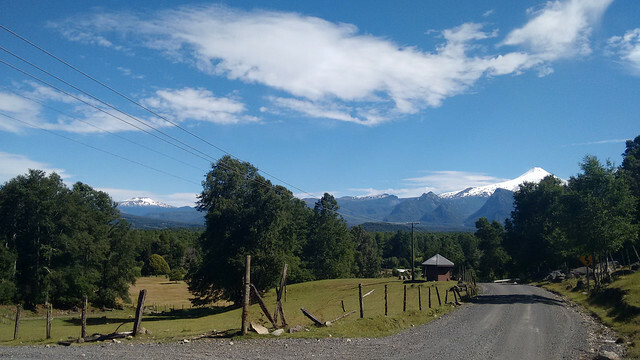 For some reason, in Araucanía, I felt like the mountains enveloped me. As I biked, the views were just always so beautiful, forcing me to be really present, to really take it in, to really appreciate this moment of my life. As I’ve mentioned about my trip to Rapa Nui, and the sense of luck and love that accompanied me on my backpacking trip in 2013, travel can force you into these moments of clarity. You realize that the decisions you have made in your life have led you here. You realize how lucky you are to be able to experience something so different than your reality – whether talking about my life in Boston or in the Valle de Elqui. 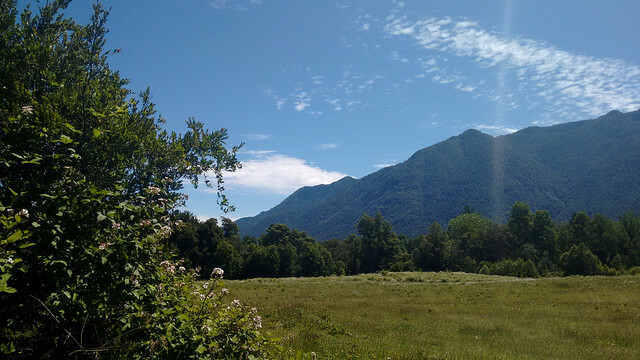 As I biked through the countryside of Araucanía on Christmas Day, these were the thoughts that floated through my mind. I have mentioned that I needed to clear my head, and I certainly did. There is nothing like appreciation and gratitude to remind you what’s important. I was where I needed to be – on a bike, surrounded by incredibly scenery, and feeling thankful. Despite these feelings of appreciation, the hilly, rocky road was bringing me to my physical limit. I was starting to be concerned that I wouldn’t make it back to Pucón without getting a ride, when suddenly I came out to a flat, even road. 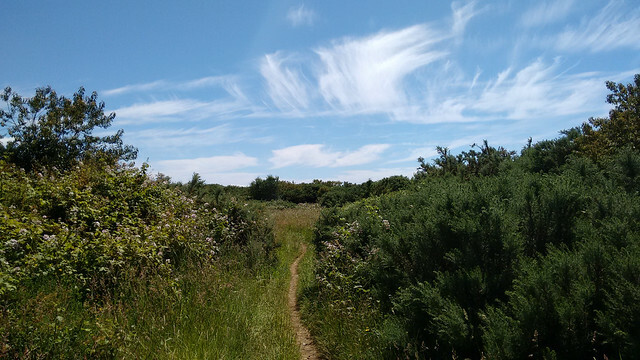 And it kept going – I had left the hills behind me! Before long, I made it back on to paved road and headed into the more populated urban landscape. 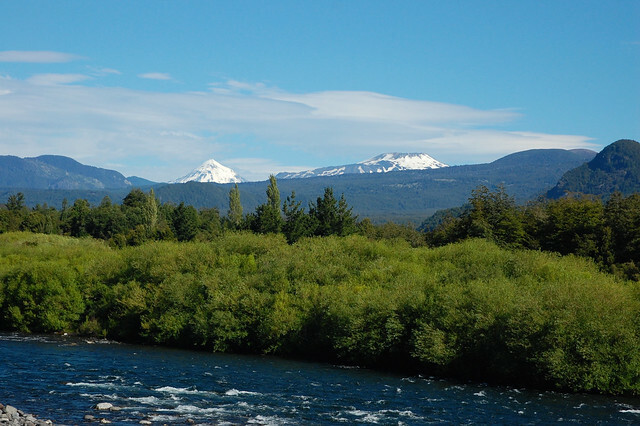 As I crossed over the bridge between Quelhue and Pucón, I noticed the amazing views – snow-capped mountains in the distance, lush green forests surrounding the river. I hopped off my bike and started snapping pictures of the views. Again, it’s difficult to convey the sense of awe, of being surrounded by the mountains that towered above me. The Mapuche village of Quelhue is located right by these hills, and I’m sure that’s no accident. The energy of these green mountains is powerful, even passing through. 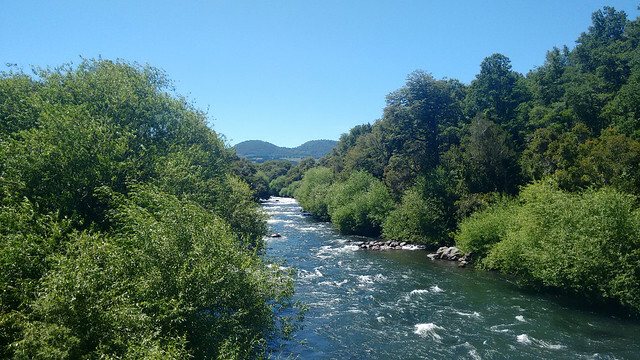 After taking in my last views of the river, mountains, and forests just outside Quelhue and Pucón, I headed back to the city to return my bike and eat a well-deserved (and much-needed!) Christmas dinner. All in all, it had been a perfect solo Christmas Day: I spent the whole day cleansing my body with intense physical exercise, I got a chance to take in the blues of Lago Caburgua and listen to the powerful cascades at Ojos de Caburgua, and I reconnected with my sense of awe and gratitude while biking through the landscapes of rural Araucanía. Upon my return to Pucón, I treated myself to a generous Christmas dinner at Trawen and headed back to the hostel to call my family. 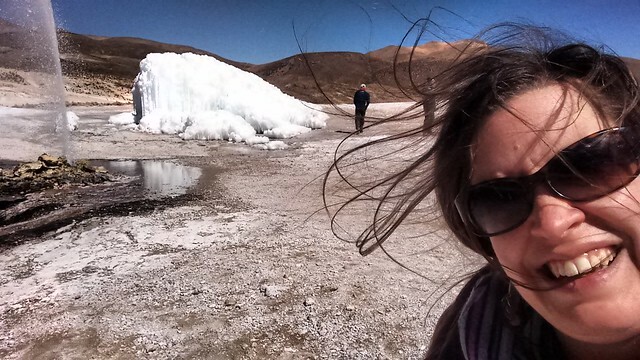 I had been nervous about spending the holiday alone – but it ended up being amazing. 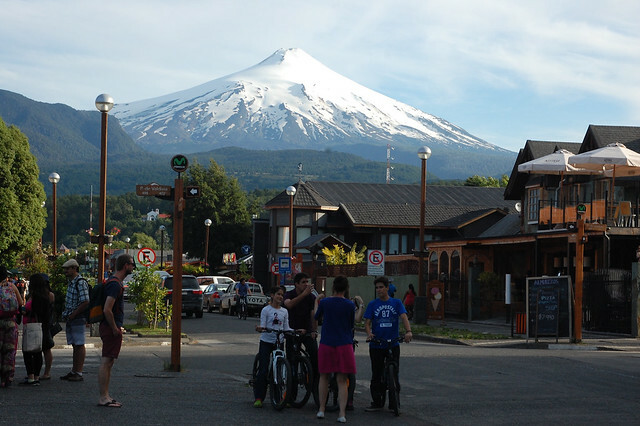 The best bike rental shop in Pucón is Freeride Pucón – they have the latest bikes, keep them well-maintained, and provide everything you need for a safe bike ride. Make sure to bring snacks and water – the sun is strong in this area and the hills can be challenging. You need fuel! While more experienced or aggressive mountain bikers may want to head to Ojos de Caburgua directly via the long, hilly dirt road, I suggest doing what the bike rental shop told me and heading to Lago Caburgua first. 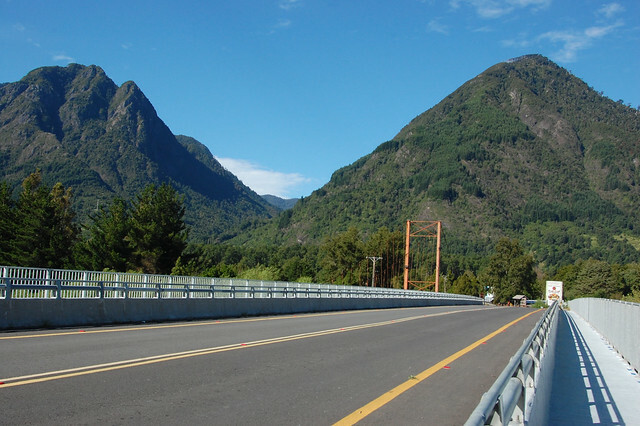 After leaving Pucón, you follow Ruta Internacional along the bike path until reaching Ruta S-905, heading towards Caburgua. The road is steep at times, but even with a few stints of walking I made good time. 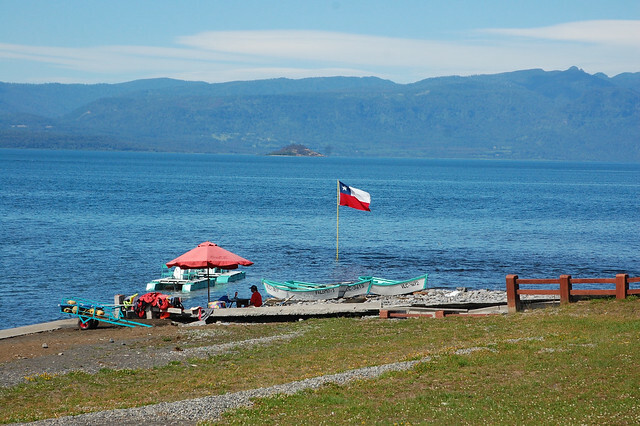 In Caburgua, you can eat typical Chilean food like empanadas at tourist restaurants, buy snacks at the lakefront kiosks, or enjoy a picnic lunch as I did. 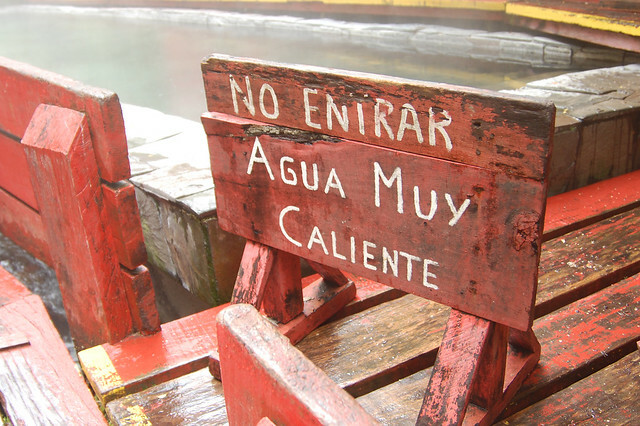 Make sure to buy more water if you need it – there’s nowhere else to get some besides Ojos de Caburgua. To get to Ojos de Caburgua, you head downhill towards the turnoff to El Cristo, very clearly signposted. If you’re nervous about missing it, use Google Maps – these roads are all clearly marked and it’s hard to get lost. 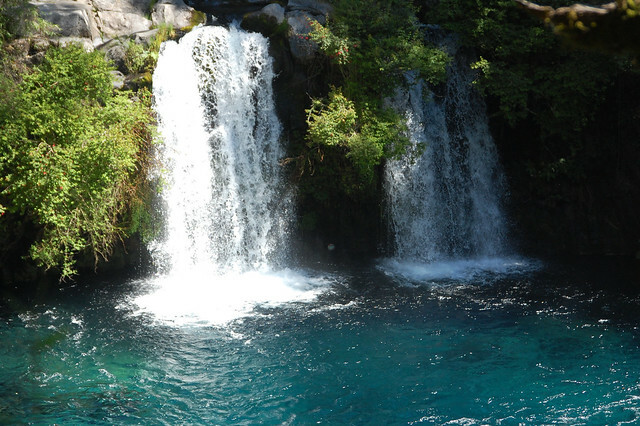 Entry to Ojos de Caburgua costs $1000CLP and is worth it – the falls are beautiful and the trails are well-maintained. 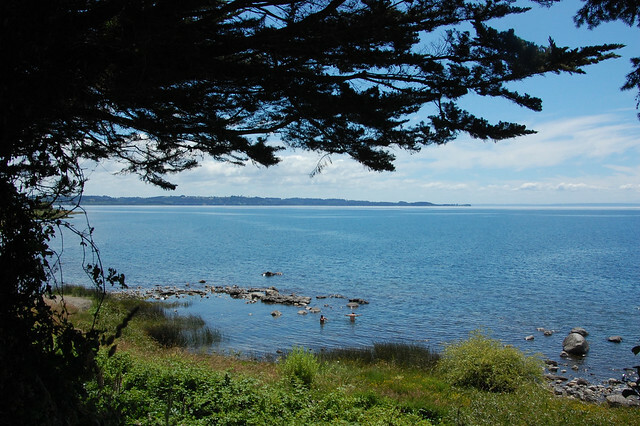 Don’t forget to pay attention as you get closer to Quelhue – the surrounding landscape is beautiful. If you visit in the summer, make sure to save time to visit the Feria Costumbrista Kui Kui, showcasing Mapuche foods in Quelhue. I didn’t go but it looks like it was amazing! After spending a year living in the dry, desert mountains in the Valle de Elqui, I was ready for a change of scenery, or as they say in Spanish, un cambio de aire. Literally. My work as the field director for a volunteer English program had been, shall we say, eventful, and I recently gone through some major shifts and emotional endings in my life abroad. I needed to clear my head and connect with nature. I needed to get some space to consider my next steps. I needed to head south. 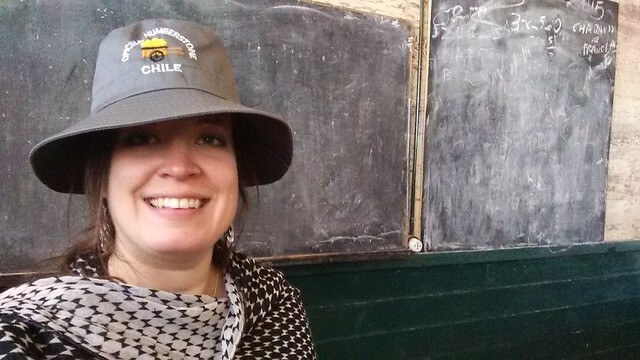 Until December, my knowledge of Chile was confined to the wide expanses of the north: I loved my time in the beach cities of Arica and Iquique, was fascinated by the crazy landscapes of the region around San Pedro de Atacama, and fell in love with the high Andes scenery of Parque Nacional Lauca and Parque Nacional Isluga. Every time a Chilean asked me about the places I’d visited, they asked, “Have you been to the south? Tienes que ir.” You have to go. I had never been further south than Rancagua, an hour or two outside of Santiago. 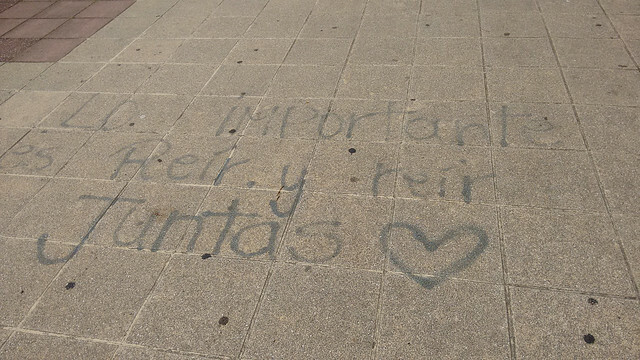 My destination in December was obvious. This past year, I spent my first Christmas outside of the United States and away from my family. When I lived in Buenos Aires and Lima, I had returned to the U.S. for the holidays, and it had always been a bit jarring to step out of the airport dressed in summer clothes into winter temperatures. It made no sense to go back: December and January are prime months for visiting South America, especially Chilean Patagonia. This time around, I knew I was going to travel, the only question was where? Naturally, it’s a little unnerving to think about spending Christmas completely alone, so I decided to head to Pucón, one of Chile’s “adventure capitals.” With so many hostels and a traveler’s atmosphere, I knew I would find company for a holiday celebration and also enjoy getting back into the travel groove. 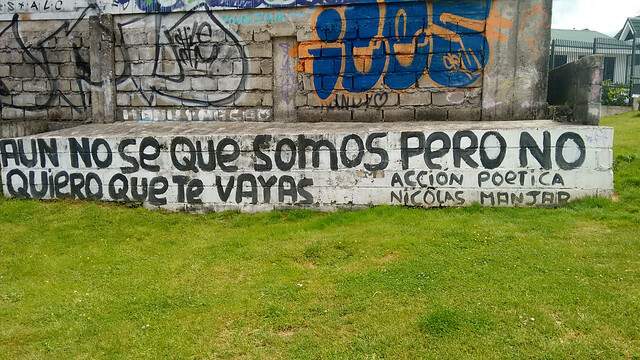 Y así fue – that’s how it was. 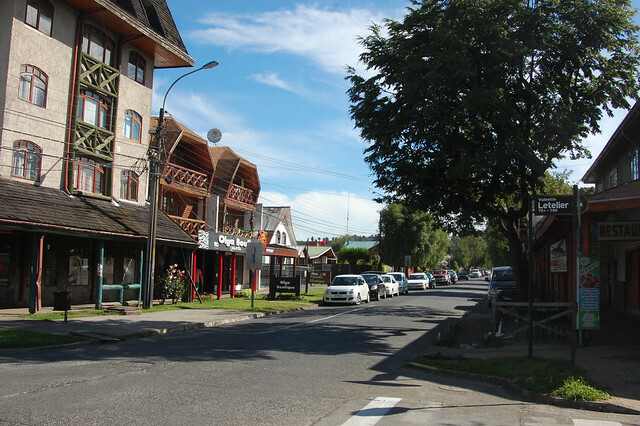 Pucón itself is rather small, with the majority of its activity concentrated on the busy commercial streets whose buildings are predominately wood in a pseudo-alpine style, just like nearby Bariloche, Argentina. Because Pucón’s main industry is tourism, a number of excellent restaurants call Pucón home, and there is plenty of shopping geared towards non-budget travelers. On a sunny day, it’s a pleasant place to wander around, and with ample public transportation and excellent bike paths, it’s easy to navigate. 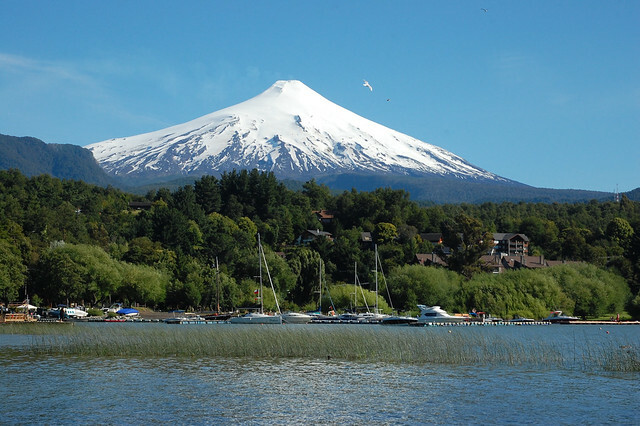 Realistically, most people head to Pucón in order to get out of the city; you can hike through Parque Nacional Villarica, climb Volcán Villarica, go kayaking on Lago Villarica, go rafting on the rivers, mountain biking, horseback riding, basically any adreneline-inducing sport that you’re into. 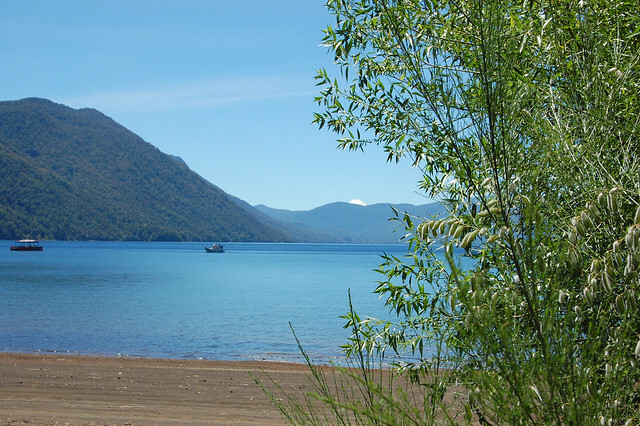 But if you feel like relaxing, as I very much did, it’s definitely worth spending a day or two taking it easy on the shores of Lago Villarica or exploring the shops and cafés that line Pucón’s streets. Here’s what I saw in between my more adventurous trips around the region. 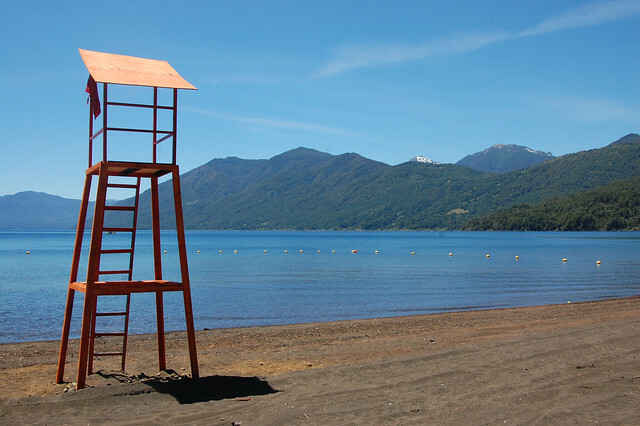 La Poza is the most accessible lakefront beach in Pucón. Located at the end of Av. 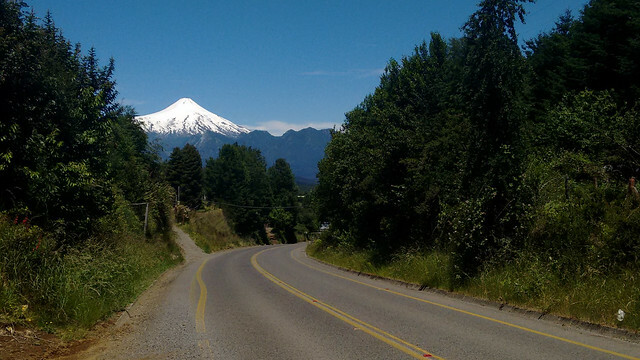 O’Higgins, the main road in Pucón, it provides great views of Lago Villarica and, on a sunny day, Volcán Villarica. There are several boats waiting to take you out for a scenic tour, but it’s also a nice place to enjoy a sunny day. On the pedestrian walkway, there are a few benches, some of them with some shade to get out of the summer sun. I saw families and couples relaxing and chatting together, and solo travelers enjoying a book or some time to journal. 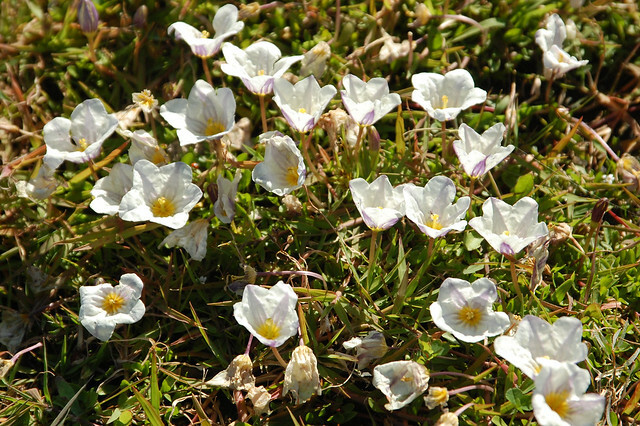 The lawns are well-taken care of and there are lots of cheerful flowers all along the pathway. Coming from the desert, seeing so much green and blue was a bit of a culture shock! 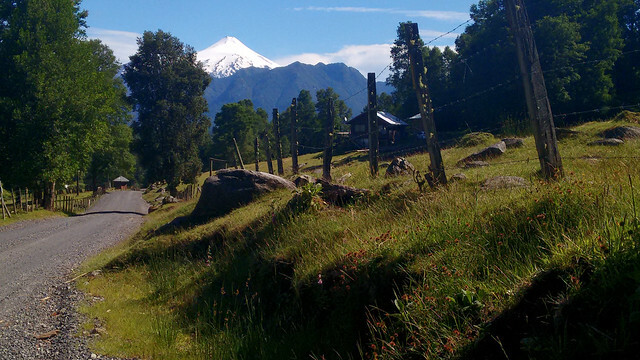 Of course, the real reason anyone goes to La Poza is to take in the amazing views of Volcán Villarica. On my first few days in Pucón, the skies were cloudy so I didn’t get a chance to see the volcano, but once I finally did on Christmas Eve, I knew had come to the right place. 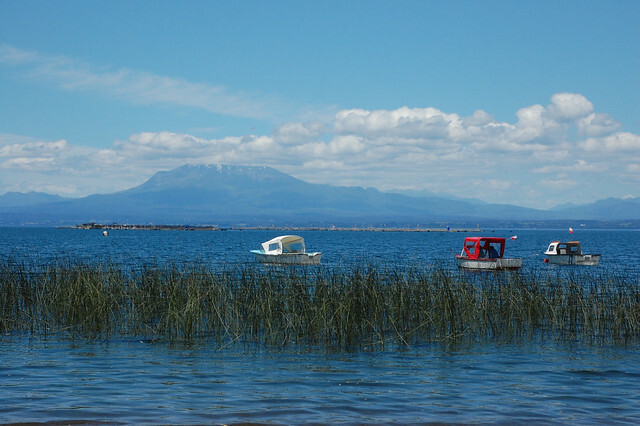 In any case, I loved the views from La Poza and spent quite a few afternoons here, appreciating how the light reflects off the deep blue water and hills surrounding Lago Villarica. …but most importantly, how the late afternoon light would enable the volcano to become even more beautiful. Watching the sunset from La Poza is a wonderful way to spend an evening. While La Poza is a good place to enjoy a relaxing afternoon any time of the year, Playa Grande is the place to be in summer. 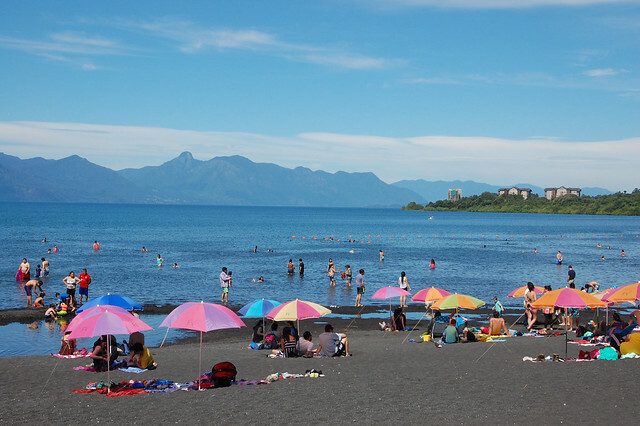 This black sand beachfront on Lago Villarica provides wide expanses of water for swimming and plenty of space for sunbathers. Of course, when I first arrived, the sun was not to be seen, but after one more rainstorm, summer burst in with clear blue skies. The difference between a cloudy day in Pucón and a sunny one is striking, and once the sun comes out, so do all the locals and tourists. Beyond sunbathing and swimming, there are several operators renting kayaks and paddleboats, and a handful of restaurants, bars, and kiosks catering towards the summer crowds. As you can see from this photo, the most exclusive lakefront homes are located in the gorgeous green forests of the nearby peninsulas. 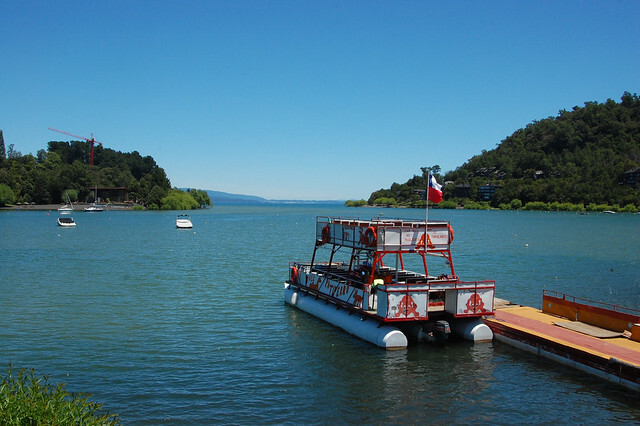 While there are exclusive hotels right on the beach and lots of construction around town, Pucón still has yet to be overdeveloped and maintains that small-town, “retreat” vibe, probably one of the reasons it’s so popular among Chilean and foreign tourists alike. As I keep saying, seeing water this blue after a year in the desert was UNREAL. 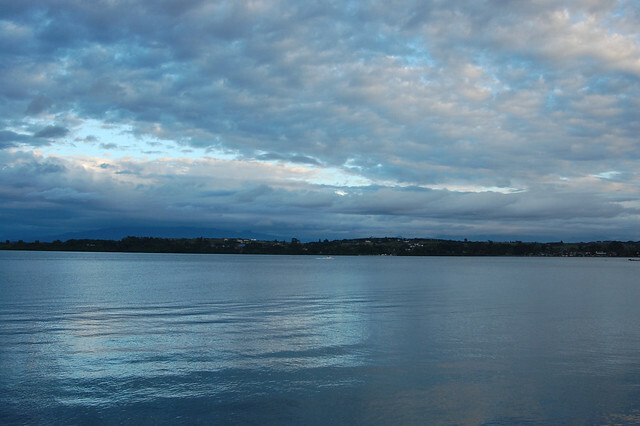 It’s not for nothing that my site is called blueskylimit – I’m obsessed with blue skies and blue lakes. So much blue! These green hills are completely different from the barren browns of the Valle de Elqui. The fresh air and new scenery was definitely doing me some good. You could do much worse than spending a day lounging on the black sand, reading a book. I have to admit that I was too eager to explore the surrounding area, but if I ever make it back here, I’m going to have a beach day. 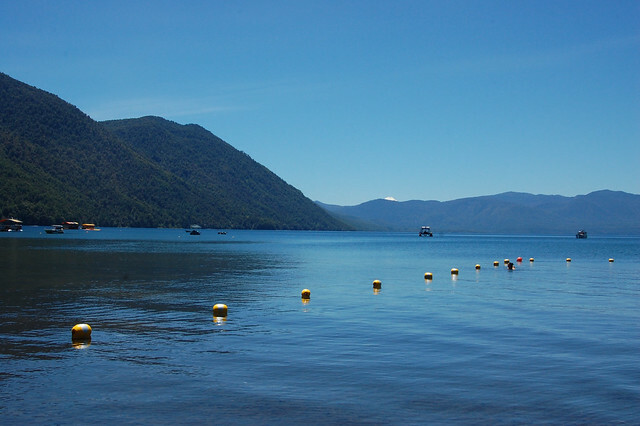 Beyond exploring the lakefront beaches, Pucón is worth wandering around. 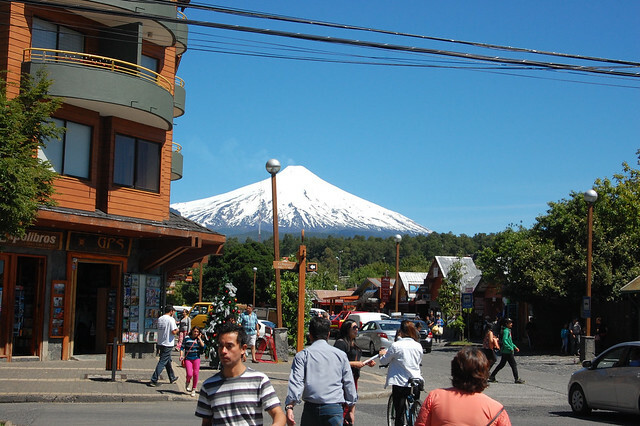 I couldn’t get enough of seeing Volcán Villarica towering above Pucón as I took my time checking out the stores and restaurants on every block. Pucón has basically everything a traveler could need, with tons of outdoor equipment stores, travel bookstores, and even department stores. I enjoyed window shopping and just transitioning my brain into a less rural vibe. So. Many. Options! After having read this blog post mentioning some of the most delicious cafés in Pucón, I was tempted to have my Christmas Eve lunch at Café de la P. I had a delicious sandwich accompanied by a berry juice (fresh berries grow all over the Lakes Region and Araucanía), and then followed by a slice of pecan torte. There were so many insanely rich looking cakes, I just couldn’t decide! After my long bike ride to and from Caburgua (post forthcoming!) on Christmas Day, I returned to Pucón ravenously hungry. As Christmas Day is the more important holiday in the United States, I decided to treat myself to a delicious full dinner at Trawen, a restaurant noted for its healthy food options, fresh juices, and baked goods. I had passed by several times and always found it packed. 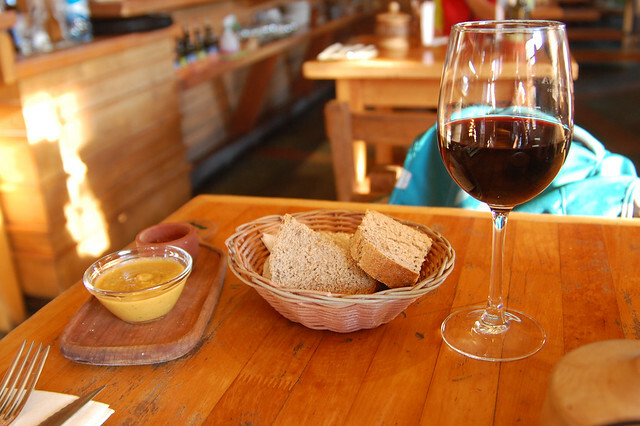 Luckily for me, they are friendly to solo travelers and I found a bright table to enjoy my wine, soup, and the best meal I had eaten in Chile until that date: garbanzo gnocchi with a savory sauce. Amazing. I want to go back and eat there again just looking at these pictures! 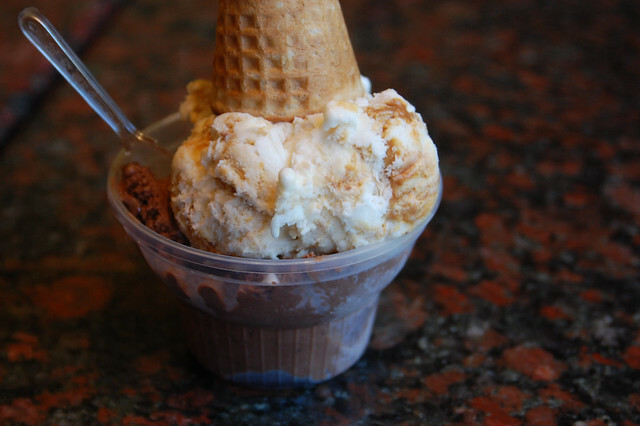 Having passed Friatto, yet another artisanal ice cream shop in Pucón, I knew I had to go back with an empty stomach. After not being a huge fan of the fruit ice cream, I went for chocolate and manjar, and the deep chocolate flavor was amazing. 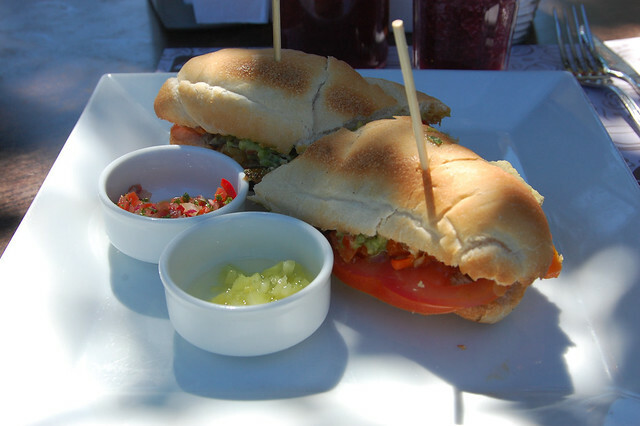 Yes, I ate very well in Pucón, and it was well worth it to splurge! 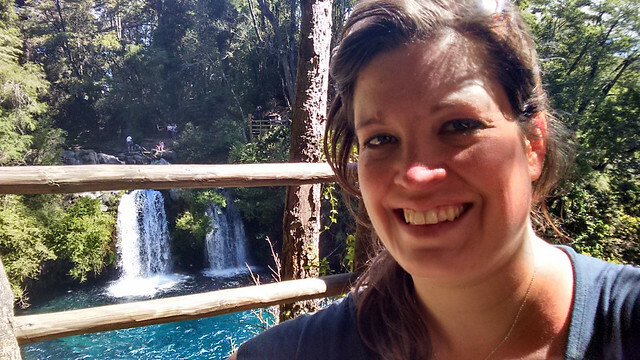 As mentioned above, I spent my first Christmas away from the U.S. and my family in Pucón. While Christmas for me usually means cold temperatures and snow, I have always appreciated seeing decorated trees and sparkling lights around town, no matter where I happen to be during Christmas season. 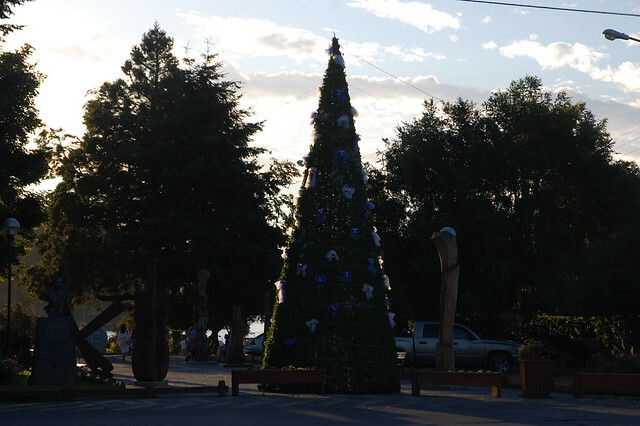 Pucón’s little plaza was quite festive. 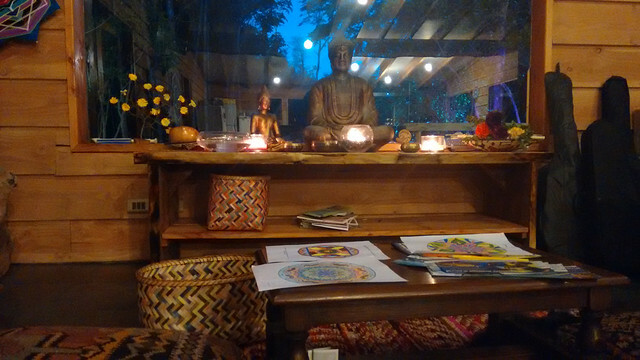 When researching the many hostels in Pucón, I stumbled across Okori Hostel, a brand new hostel located near the airport on the outskirts of town, surround by the ever-more-rare native forests. While the hostel was not as busy as those downtown, I spent Christmas Eve with the owners, their mother, and a group of Brazilian friends who were also curious about this brand new place. Karin, one of the owners, loves coloring mandalas and helped me understand how to use them as meditation and read the colors to get insight into what is going on inside me. 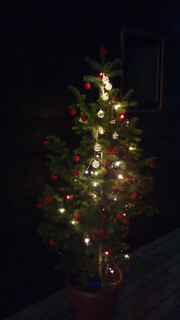 There were adorable decorated trees and Christmas lights strung up on actual trees all around the properties, making it a suitably festive place to spend Christmas. Until this night, I didn’t realize that Christmas Eve was actually the main holiday for people in many countries around the world. It helped me understand why the server at Café de la P was worried about whether or not I was going to be alone that night. Luckily, I was well accompanied by friendly, open-minded people! As you may recall, this was also the night of the Christmas supermoon, which was beautiful to observe but very hard to capture. 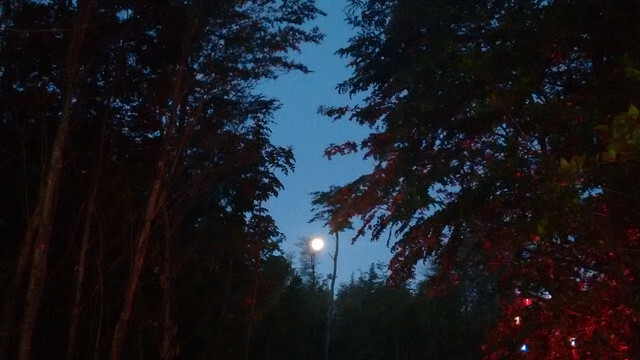 I woke up in the middle of the night and saw the giant moon right outside my window, unforgettable. We spent Christmas Eve together as a big happy international family, with the Brazilians doing the majority of the food preparation and me helping out with the salads as much as I could. Over a few bottles of wine and lots of good conversation, we welcomed the holiday. All in all, it was a perfect way to spend Christmas Eve. For Christmas Day, I planned to head on a solo bike ride to Caburgua, a gift to myself after so many months without the opportunity to ride a bike. 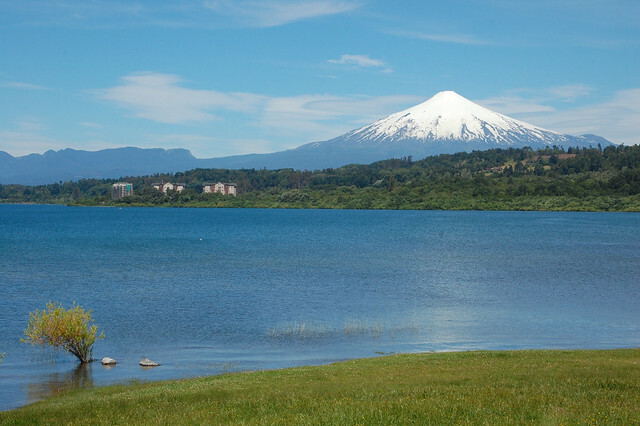 Pucón was the perfect place to spend the holidays, and the region of Araucanía proved to be the ideal gateway into the Chilean lakes region and northern Patagonia. 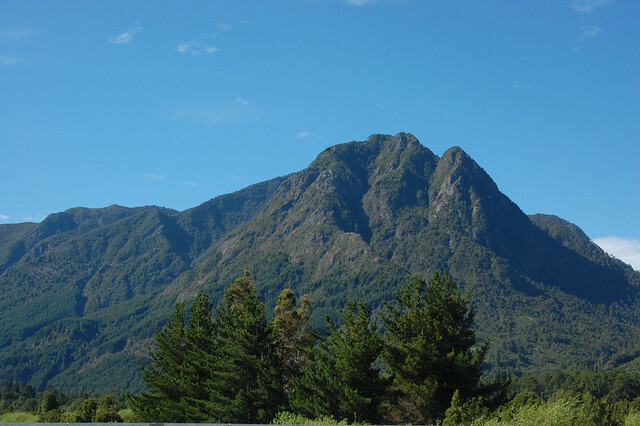 There is so much to see in Araucanía, the area around Pucón, Parque Nacional Villarica, and beyond. My adventure was about to begin! 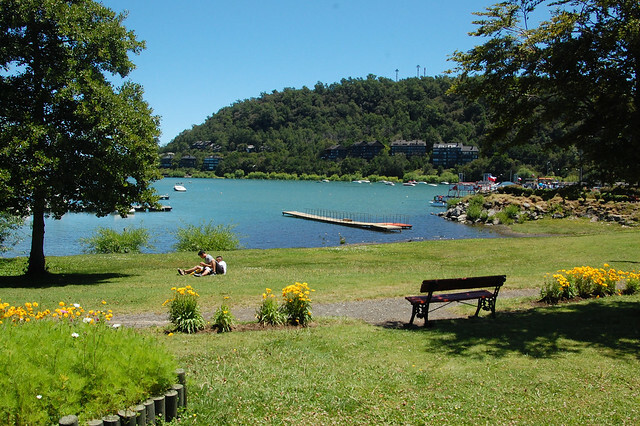 There is a LOT to do in the area surrounding Pucón. I’ll talk about some of the activities I did in future posts, but in the meantime, the Globetrotter Girls list a number of excellent options, weather permitting. Similarly, there are so many tour operators that it can be overwhelming, and each different company has its specialty. You should definitely ask around and check with fellow travelers. Aguaventura comes highly recommended – I ended up not taking a tour with them but found them to be honest and professional. The best, best, best place to rent bikes in Pucón is Freeride Pucón – the staff is friendly, the bikes are well-maintained, and the prices are competitive. There are several protected bike paths around town, making biking in the region a nice option. I stayed at Okori Hostel, which is a brand new, beautifully constructed hostel just outside downtown Pucón, across from the airport. I also heard wonderful things about Chili Kiwi Hostel, located right at La Poza. I was curious about Hostal French Andes, run by the owner of Aguaventura, as it is has Japanese-style capsule dorm beds. 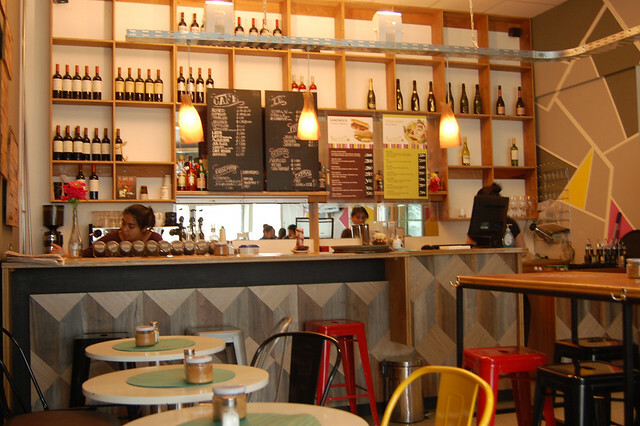 There are so many amazing places to eat in Pucón – definitely check out Trawen and Café de la P, as pictured above. I also heard that the café at École was amazing. 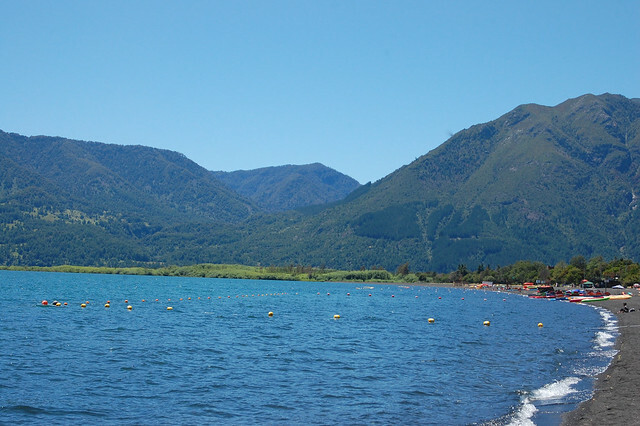 The Wikitravel entry on Pucón is thorough, if you want to see all your options at a glance. If you are traveling by TurBus, be aware that the bus terminal is located just outside town, which means you may need a transfer to get downtown unless you’ve packed relatively light. 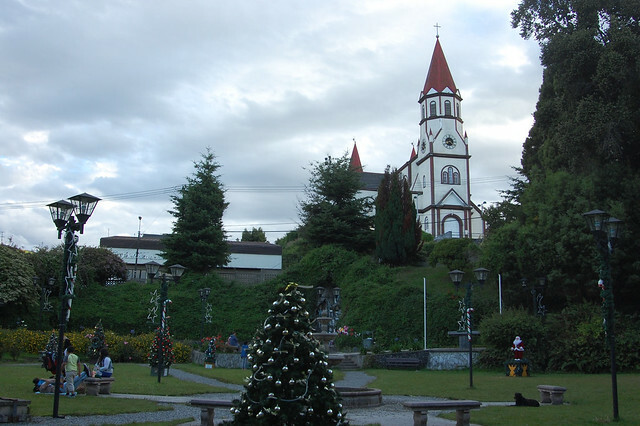 Do not listen to the guidebooks and ignore Villarica, which is actually a charming city located on the other side of Lago Villarica. 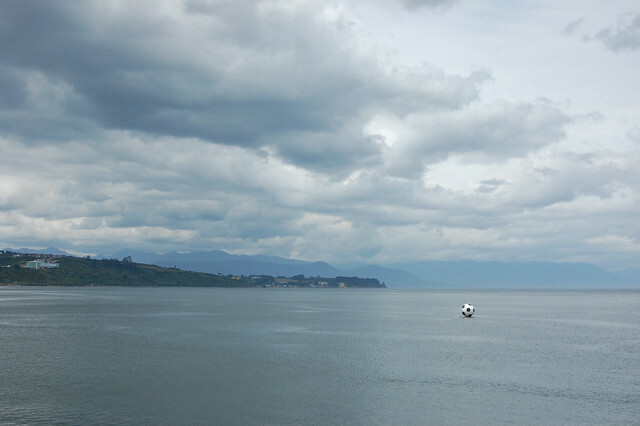 I actually enjoyed Villarica more than Pucón! 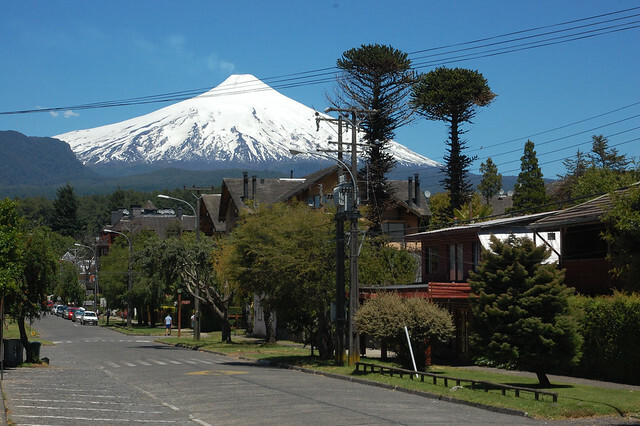 Make sure to take a bus ride over to Villarica – they leave from the center of town. More to come in my post on Villarica. There are times when an independent traveler wants to take local buses and explore ruins or beautiful landscapes at a relaxed pace. And then there are times when taking an organized tour is the more economical and convenient option, due to massive distances or the need for an off-road vehicle. But then there are other times when your tour guide shows a passion for promoting and protecting the rich regional heritage that is often missed by tourists quickly passing through en route to somewhere more famous, when this knowledgable person serves as a gateway into the history and culture of a fascinating region. This was the case on my tour to Parque Nacional Isluga. On my last full day in Iquique, I signed up for the Parque Nacional Isluga tour for two reasons: I was curious about the weavings from Isluga that were on display at the Museo Regional de Iquique, and I wanted to see the high altitude Andean landscape in this part of the country. 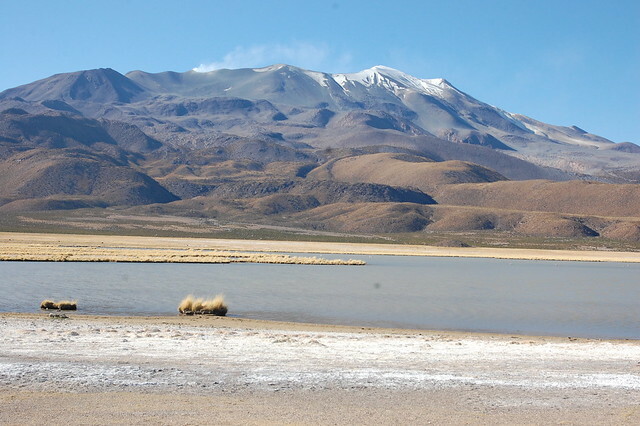 I had already visited the gorgeous lagoons in Parque Nacional Lauca, near Arica, and the wonders of the Atacama Desert, near San Pedro, and I was curious how the scenery changed over here. In the end, beyond the scenery and textiles, this tour ended up illuminating so many aspects of life in the northern desert over the past few centuries, and inspired me to keep on traveling and exploring Chile. Fair warning: this post is very long and picture-heavy, but I want to encourage other travelers to take the time to visit this area on their way through Chile! The tour left Iquique very early in the morning for one good reason: we wanted to make it to the Gigante de Atacama before the sun came up over the mountain. 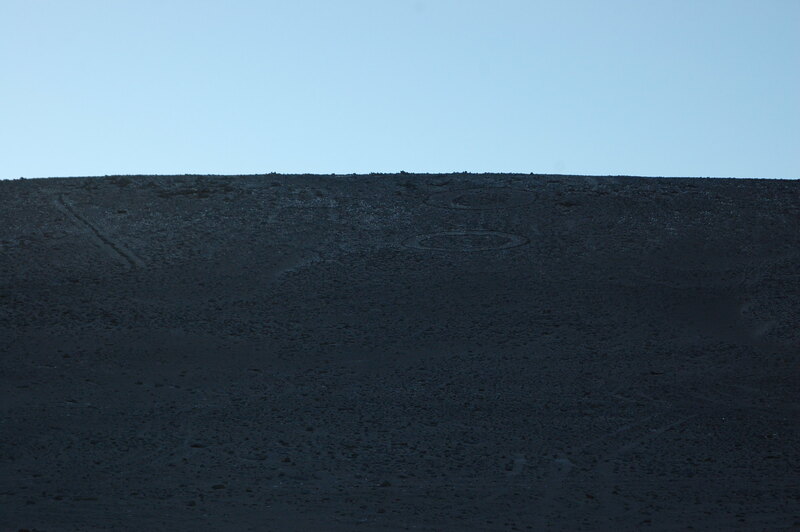 The Gigante de Atacama, or the Giant of the Atacama Desert, is a huge geoglyph carved into the side one of the hills found in the middle of the expanses of sand. 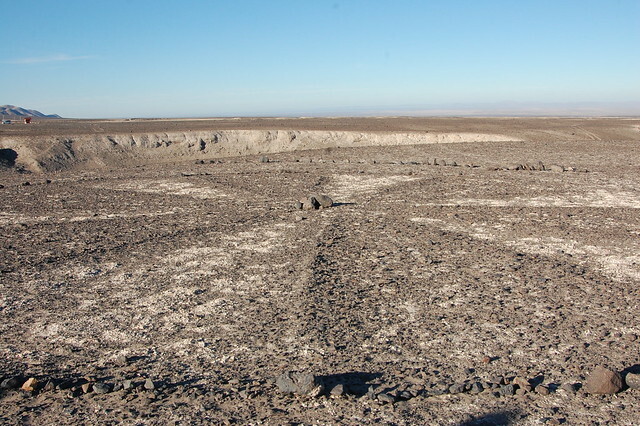 These geoglyphs are found throughout northern Chile, and for the most part, archeologists are still studying and debating the meaning of the figures. 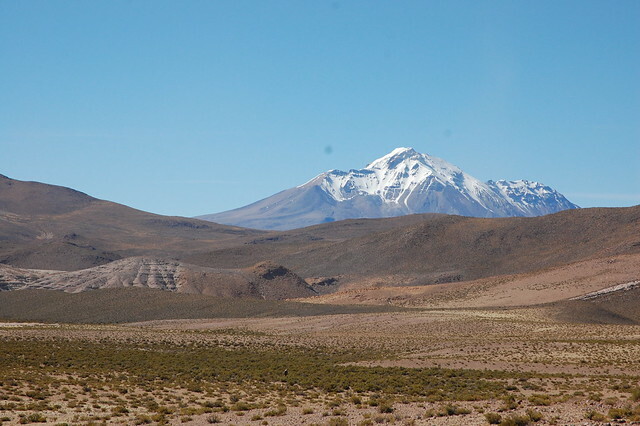 The Gigante de Atacama is well-known because of its massive size and its very clearly humanoid shape. As in many of the rock carvings I saw in Yerbas Buenas, near San Pedro de Atacama, the figure looks like a shaman. This shape could represent an important meeting or could be a signpost signaling a particular travel route (speculation found here). 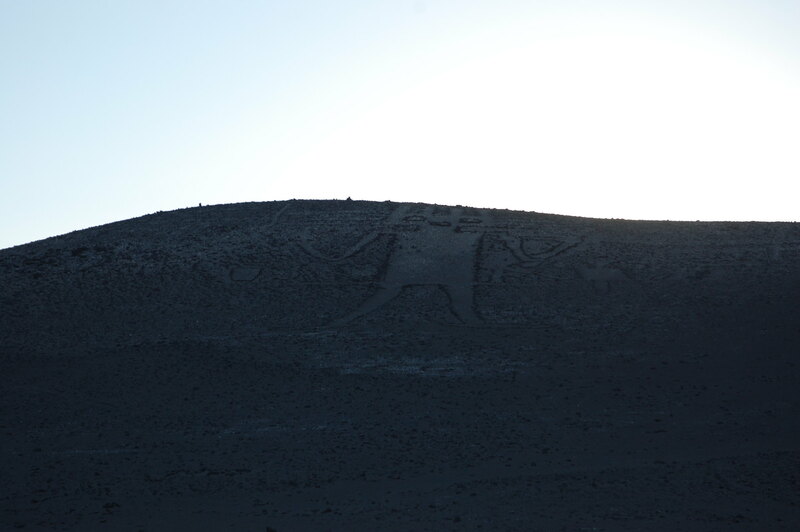 In any case, I was struck by the fact that the sun rises directly over the top of the head of the Gigante de Atacama; like many ancient Andean cultures, whoever carved this figure into the mountain was well aware of the path of the sun. 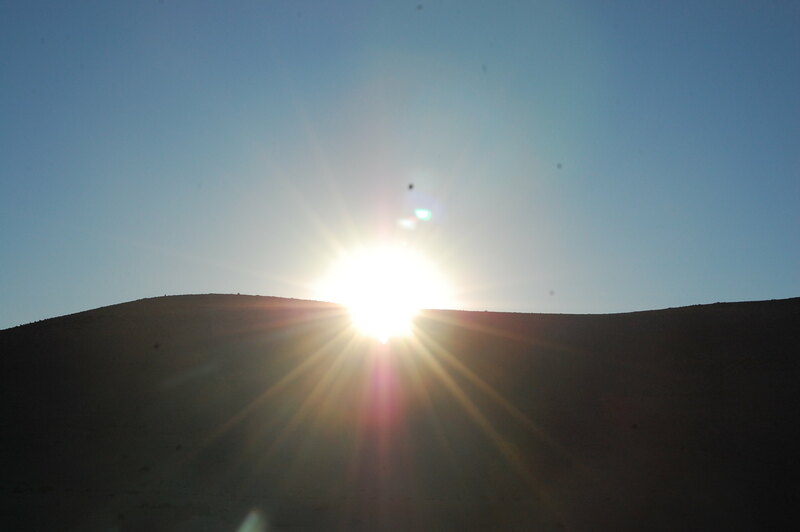 It is no accident that the sun rises directly over his head; the visual impact of illumination appearing slowly and strongly above this giant figure could represent spiritual or intellectual insight. 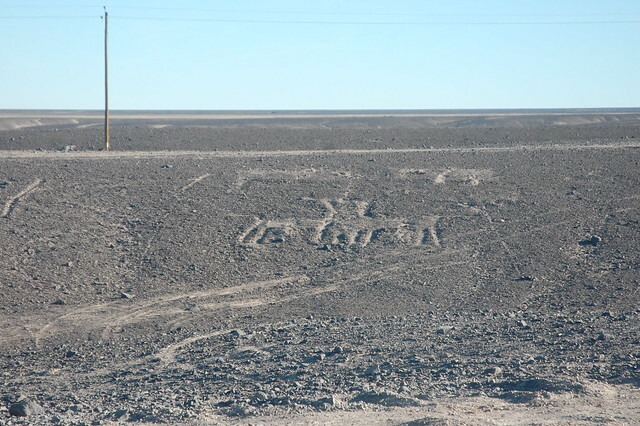 According to our guide, other geoglyphs in this same “family” also appear to have been designed in connection with the sun, coordinated with the sunset and movements of this and other celestial bodies over the course of the year. Fascinating stuff. 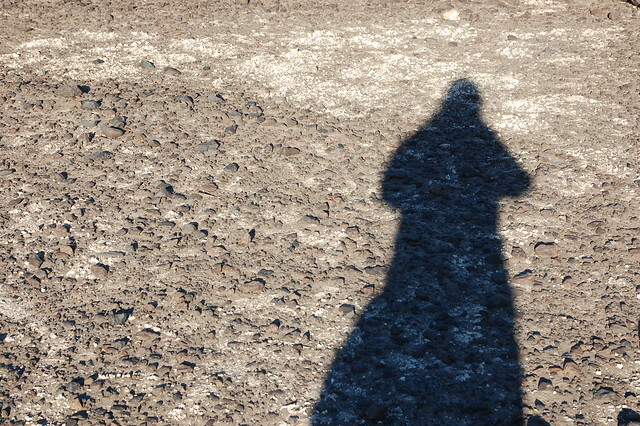 Near the Gigante de Atacama, there are other intriguing shapes and figures, as you see above. 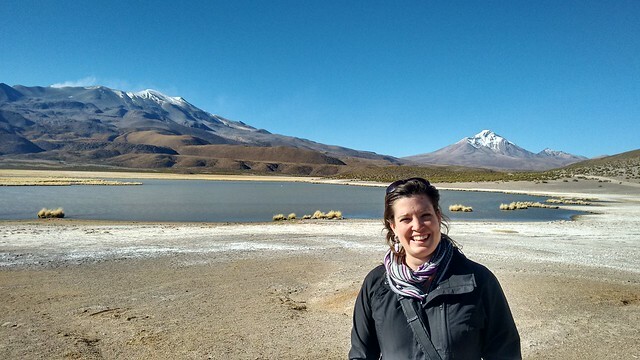 At this point in my tour, our guide was encouraged because a number of us showed serious interest in the ancient cultures of the Atacama and the speculations about the origins and reasons behind these figures. As a reward, he decided to take us somewhere not usually included on the tour. 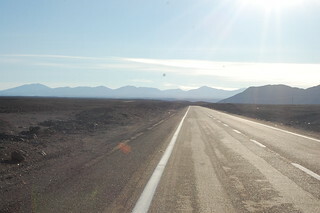 As we returned to Ruta 15, we passed a road very clearly carved into the desert, just a faded outline, but very distinct. This was the Camino del Inca, the Inca Trail, passing through the desert. Less impressive than the stonework found in the Andes, it rarely catches the attention of people passing by, but there it remains, cut through by modern roads, passed over by off-road vehicles, but still there. 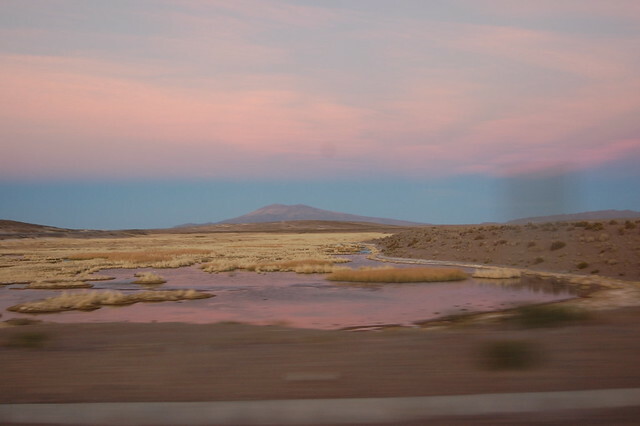 Ruta 15 continues up into the high Andes all the way to the Bolivian border. 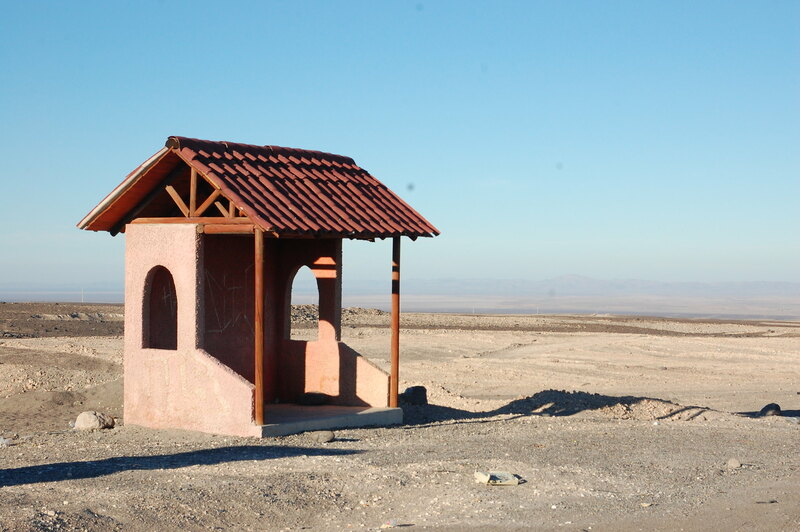 I was surprised to see this isolated bus stop in the middle of the desert, but with all the mining in the area and transit to and from Bolivia, this shelter provides some shade from the sun for whoever ends up waiting. We parked near the bus shelter (hence the photos) and got out to walk through the desert to our special destination. As we walked through the sand, we glanced down our feet and saw shards of pottery just about everywhere, preserved by the relentless sun. 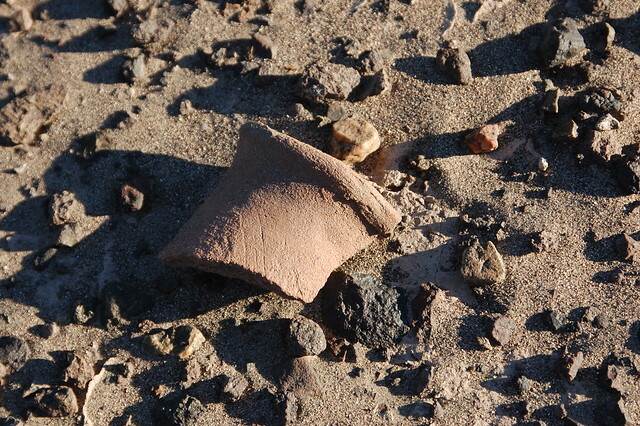 This simple pottery was not painted in any way, which our guide said suggested that it was used for ceremonial purposes, and these were likely pieces that fell off the loads being carried along the way. After a short walk, we arrived at this incredibly curious geoglyph: a giant asterisk carved into the desert. Like the geoglyphs and the desert section of the Inca Trail, this asterisk was created by digging into the earth and turning up the lighter layers of sand, and using the darker rocks to create a contrast visible in the desert. Similar to the Nasca Lines of Peru, this desert asterisk is more visible from above, and this is exactly how they found it. According to our guide, Google Earth led those curious about the mysteries of the Atacama to discover this intriguing shape. There is a section that was run over by an off-road motorcycle, whose rider probably had no idea he was passing through what seems to be a ceremonial site. In this photo, you can see the textures and colors of the rocks used to mark out the desert asterisk. This is inhospitable landscape, and at some point in the past, there was a reason to mark this location or record this shape. 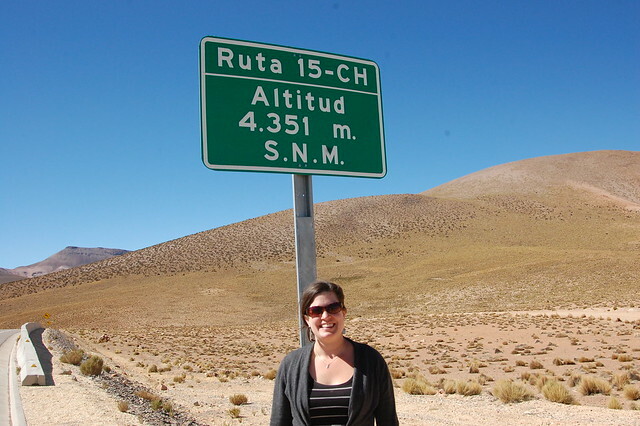 After sufficiently appreciating the asterisk, we headed back to the tour van and continued along Ruta 15. Of course, we spotted many other geoglyphs along the way. These appeared to be a little more traditional, shapes relating to animals and other figures of daily life. 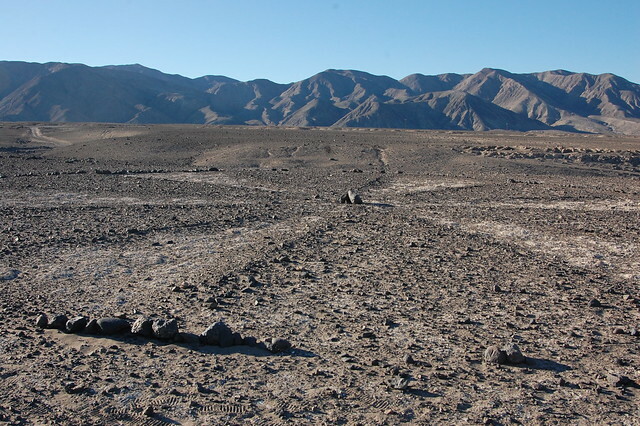 As you can see from the photo, unregulated offroad vehicles have damaged the desert around the geoglyphs, turning up the rocks surrounding them. 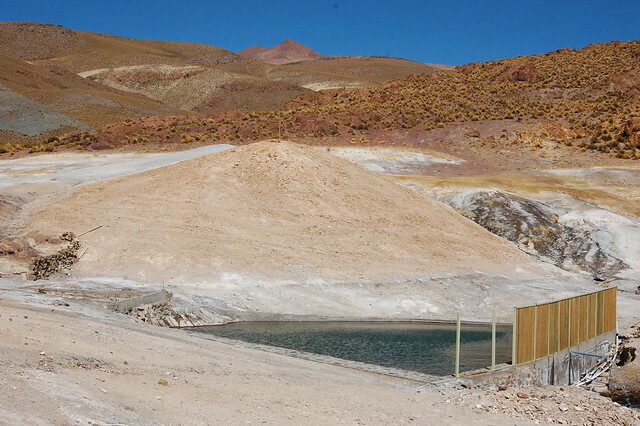 It’s hard to convince people that rocks and sand are part of Chile’s national heritage and need to be protected. Personally, I was most fascinated by the views of Inca terracing. Ever since my trip to Peru back in 2007, I have been intrigued by how the Incas (and their predecessors) carved out ways to grow crops in seemingly impossible locations. Our guide explained that engineers have studied the way water was moved from one place to another in this valley and still don’t fully understand how the ancient system worked. Of course, this kind of view requires posing for pictures. Our guide took lots of photos of us from the best vantage point, and promised to send them along. Unfortunately, this never happened, but I have this shot of me posing for the pictures taken by one of my fellow tourists. 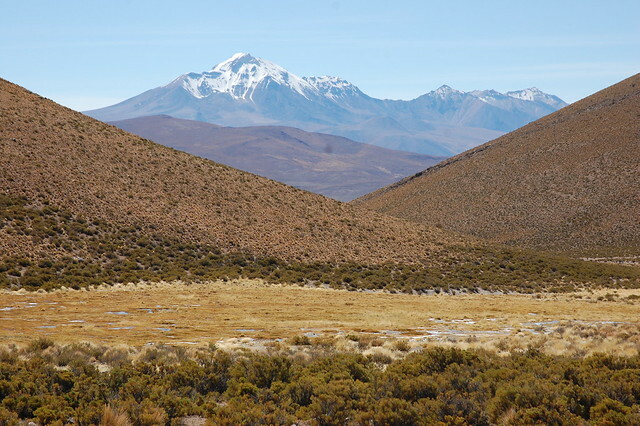 We continued our climb into the higher altitude of the Andes, watching the landscape change from brown and beige to the rich reds and oranges from the mineral-rich mountains. One glance at these colors makes it unsurprising that mining is big business in the area! Finally, we reached the highest point in our climb, 4351 meters above sea level. This is quite the climb in altitude in one day, and can be tough on your body, but at this point we were all feeling good and ready to continue the journey. 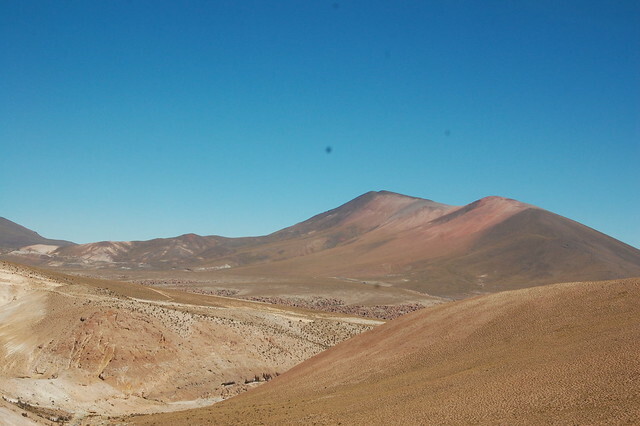 At this point, we were high in the Chilean altiplano (highlands), and it was time to go off-roading. While Ruta 15 continues towards the Bolivian border, the interesting sites lie on the dirt roads running parallel. 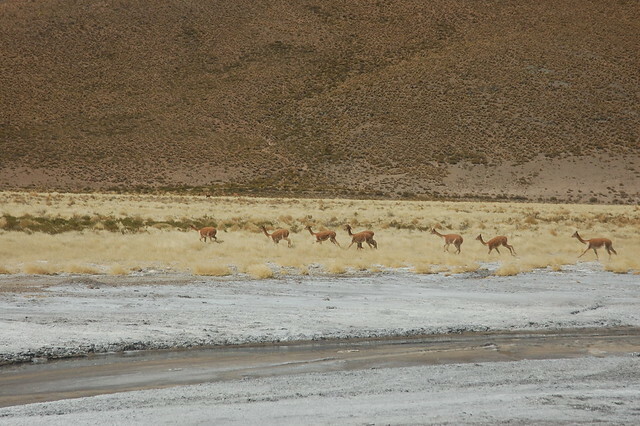 You start to see another type of traffic, animals like llamas, vicuña, and other cameloids making their way across the high altitude vegetation. And then there were the views. 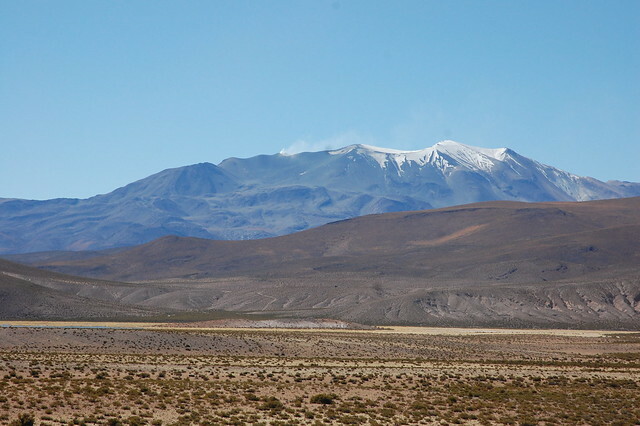 I loved seeing the volcanos and snow-covered mountains appearing and disappearing as we rounded corners and headed deeper into the altiplano. Without any lakes around, the landscape was colored in sun-toasted earth tones. 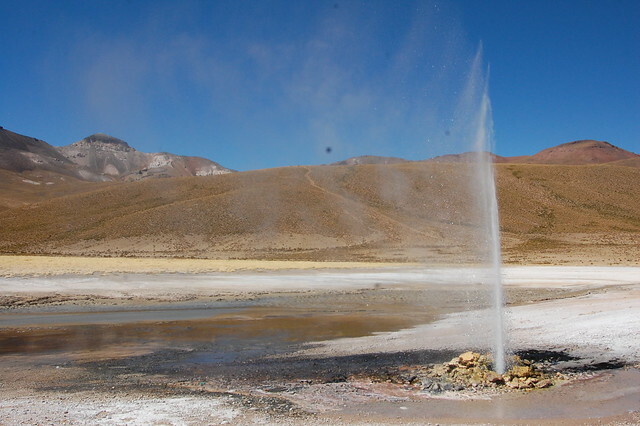 Our next stop after admiring the landscape and wildlife was the Geisers de Puchuldiza. 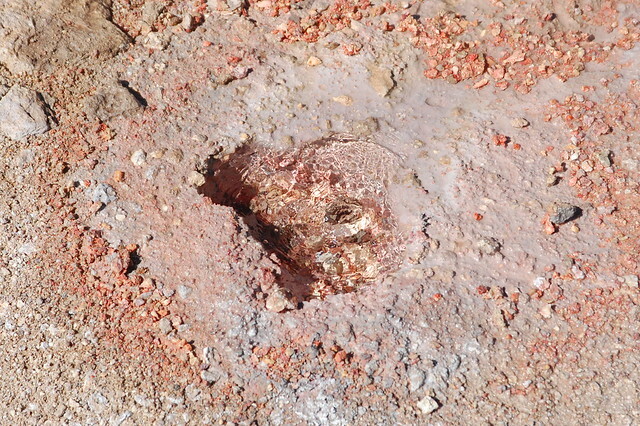 These geysers are not naturally occurring; the holes in the earth were left open after some sort of mining activity and the water forces itself out due to the pressure beneath the earth’s surface. 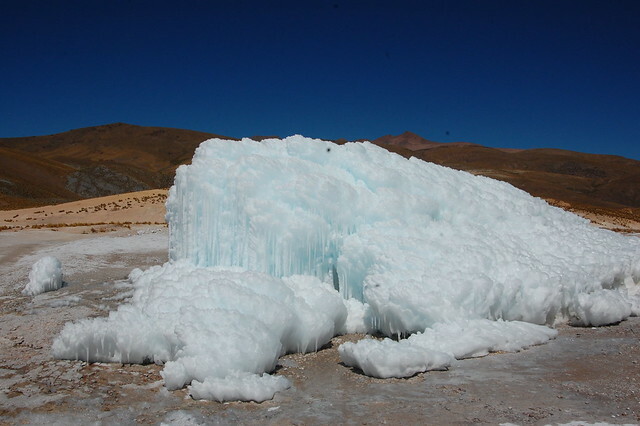 There are several spots where the boiling hot water rises to the surface, and the most interesting is where the water comes out with such force and heat, but freezes into this large ice formation in the winter cold of the high Andes. The ice surface glows bright white in the sun, and if you stand close to it you might think you are in Antartica. Watching the steaming water spring out of the ground is entertaining for a little while, appreciating nature’s force and reminding you that there is more going on beneath us than we usually consider. 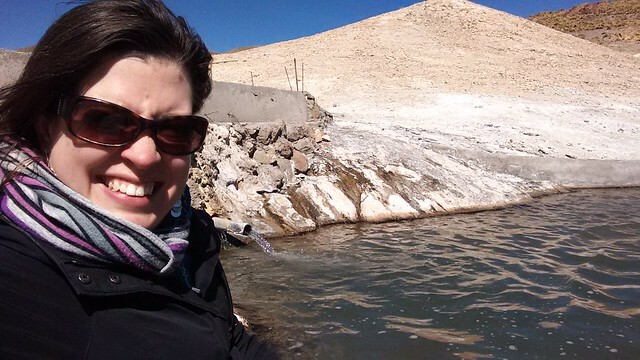 From there, we walked over to the Termas de Puchuldiza, a very basic thermal bath built in the middle of nowhere in the Chilean altiplano. At this altitude, the air is cold, but even still I was convinced to change into a bathing suit and get into the healing waters. I have to say, after this trip, I am now a big fan of thermal baths, whereas before I didn’t quite understand their appeal. While I’m not sure if the stories about the healing properties of the mineral waters are true, it is relaxing to hang out in a hot pool in the middle of winter. I was especially appreciative to spend some time talking with the other people on my tour and learning their stories. After leaving the thermal baths, we got back in our car, and before long, we hit a road bump – other trucks passing by signaled at our tires, and it turns out that we had a flat. Good news is that our guides were prepared and were able to change the tire quickly. In the meantime, I wandered into the landscape a bit to take the pressure off them and snap some shots of the beautiful scenery from another angle. Tire replaced, we continued our route to Mauque, one of the traditional Aymara towns located near Parque Nacional Isluga. 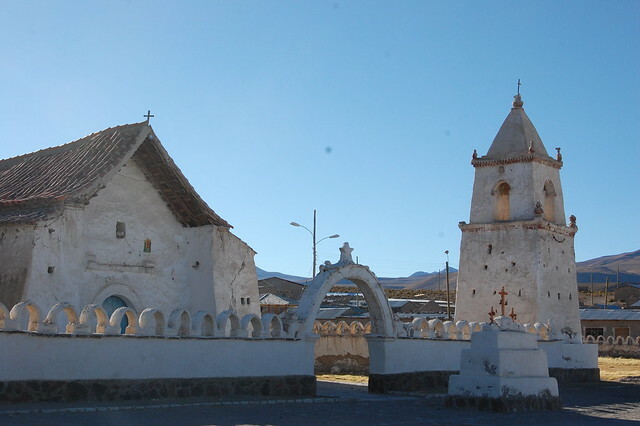 Mauque is notable for its very old, traditional church and the old-fashioned construction of its houses. Unfortunately, for some reason, the local government decided that the old-fashioned plaza of Mauque needed to be modernized. Take a look at the tire marks on the ground. 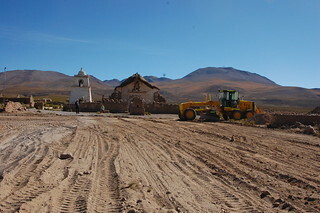 On the morning of our visit, the Chilean authorities bulldozed the plaza to make room for a new one. The town already has a steel monstrosity of a soccer field in the middle of town. 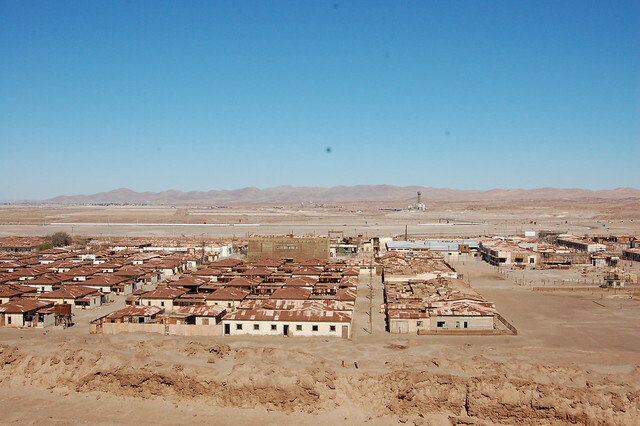 Imagine that – a traditional Aymara town being forced into modern buildings and structures. When we arrived, two of the older townspeople were sitting in the plaza, shocked by the destruction of their plaza. As our guide said, a modern plaza would completely throw off the feeling of the town, and even reduces its appeal to tourists. Unfortunately, this kind of “development” is fairly common throughout Chile. Character and history give way to uniformity. 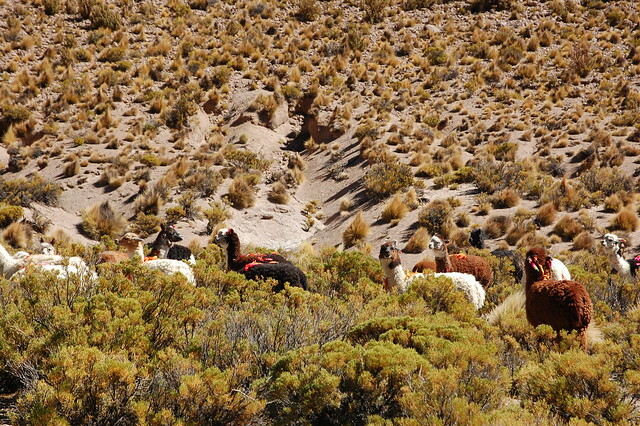 In any case, there are artisans in Mauque who offer their hand-knit and woven alpaca products to tourists, if you’re interested in purchasing directly from the makers. After Mauque, we also made a stop in Enquelga, where we saw one of the artisans at work, spinning alpaca yarn. She offered a number of beautiful shawls at low prices; you can see what I ended up purchasing in one of the photos below. Finally, in late afternoon, we arrived to Isluga. Isluga is a ceremonial village, which means that its houses are only inhabited during religious events (more information in Spanish here). It’s a little strange to see so many streets filled without houses, but no people. Hanging from the crosses are pieces of fruit which appear to have dried in the sun and cold. 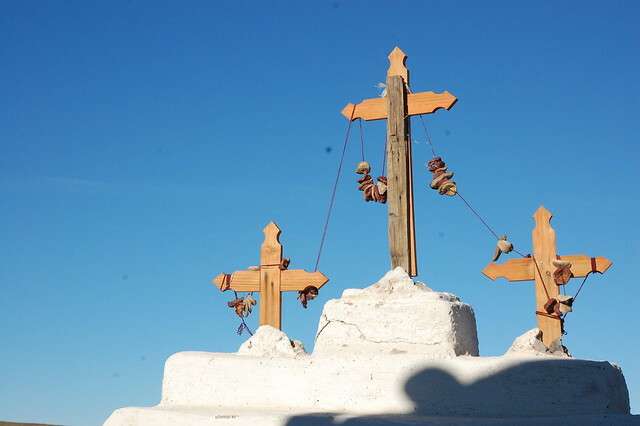 These types of offerings are commonly seen throughout the Andes, although I am not exactly sure what they represent. 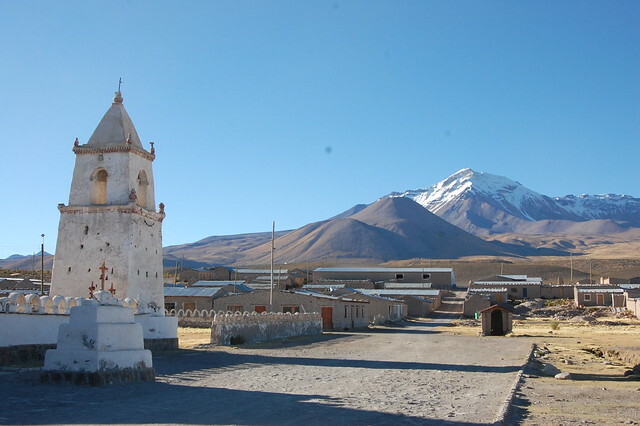 It was quite peaceful to take in the picturesque location of the town, so close to the mountain which plays an important role in Andean philosophy (cosmovisión). Our final scenic stop was the one that originally drew me in: the promise of high altitude lagoons. I was not disappointed. 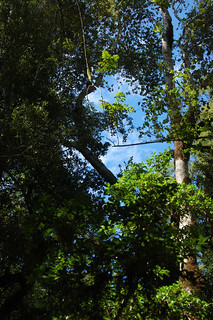 This is the sector protected by Parque Nacional Isluga. Because these lagoons are the habitats of flamingoes and other native species, the Chilean national park service has constructed an educational walk around the lagoon, restricting you to the path in order to protect the ecosystem. 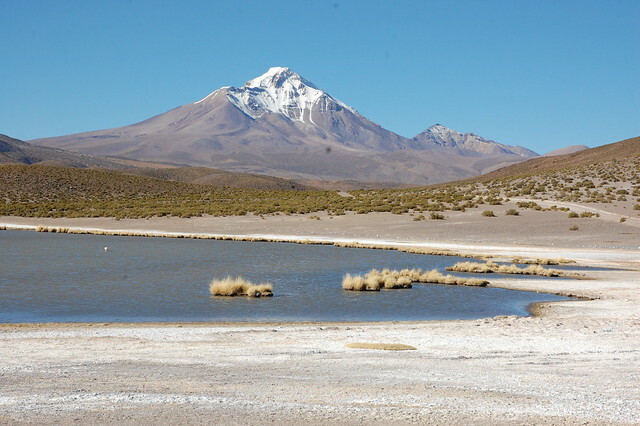 Due to the late hour, we didn’t have much time at Laguna Arabilla, but it was quite lovely. Coming from the desert mountains of the Valle de Elqui and a week spent on the coast, this landscape was a big change and I had more appreciation for its beauty than I may have if I had come directly from a tour of the Salar de Uyuni or San Pedro de Atacama. In any case, I enjoyed the drastic change from the desert and expanding my knowledge and understanding of the geography of Chile. The Andes are amazing. After covering so much territory in one day, it was time for an extremely late lunch at Colchane, the last Chilean town before the Bolivian border. 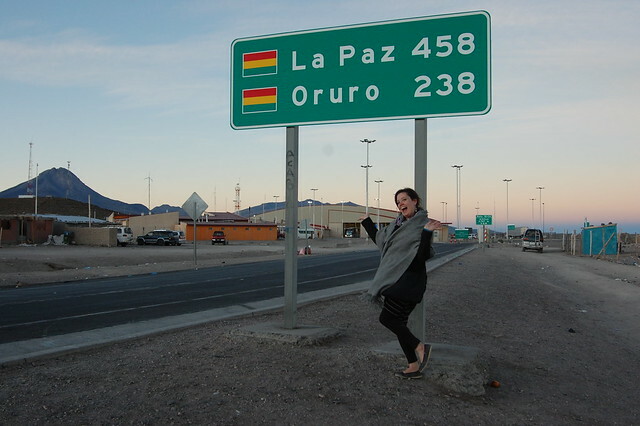 Of course, we couldn’t resist taking pictures of the distances to the nearest Bolivian cities! After finally eating a real meal, we piled back into the van for the long trip back to Iquique. As night fell, our guide began to tell us about his experiences with the supernatural at oficinas salitreras like Humberstone. It was almost like being around a campfire, swapping stories, where everything seems a little more possible at night than you would believe by the light of day. I arrived back in Iquique feeling inspired by my visit to the highlands, intrigued by all the history I know so little about, and motivated to keep on exploring and keep on sharing what I learn. I am very thankful to our tour guide for having so much passion for his home region and sharing it with us! As you can see, I highly recommend heading out on this tour, not just for the beautiful landscapes, but for the opportunity to get a glance into ancient history encoded in the desert, the lives of Aymara villagers, and to just appreciate how different life is at this altitude. Take the tour! This tour is absolutely worth the money, especially if you are visiting from other parts of Chile where the landscape is really different. 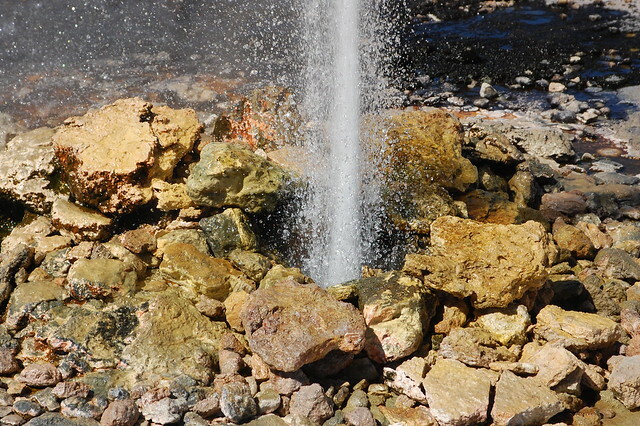 The tour uses an off-road readyh vehicle that allows you to visit the more out of the way sites, like the geysers. I booked my tour through the hostel I stayed at in Iquique, who work with Show Travel. I really appreciated the insight of my guide, but he was working on starting his own agency and may no longer work there. Fair warning: most tour guides do not speak much English in this region, and you will get the most out of the tour if you make an effort with your Spanish. The tour cost $45000 CLP in July 2015. Keep in mind that you go from sea level to over 4000 meters above sea level in a very short period of time, which can be hard on your body. To avoid altitude sickness, the tours serve only cookies and crackers on the tour until about 6PM, when you reach Colchane and have a real meal. You may want to bring some fruit if you want some healthy sugar rather than the processed cookies, but I was advised several times not to eat too much as altitude sickness in this particular region can be especially brutal. Make sure to bring some extra cash to buy any of the woven goods sold in Mauque and Enquelga. I bought a hand spun and woven alpaca shawl for $25000 CLP, which is incredibly inexpensive for the quality of the weaving and the material. You can see the shawl in the border photo above. It is one of my favorite souvenirs ever and is incredibly warm due to the alpaca wool and the tiny, tight woven stitches. 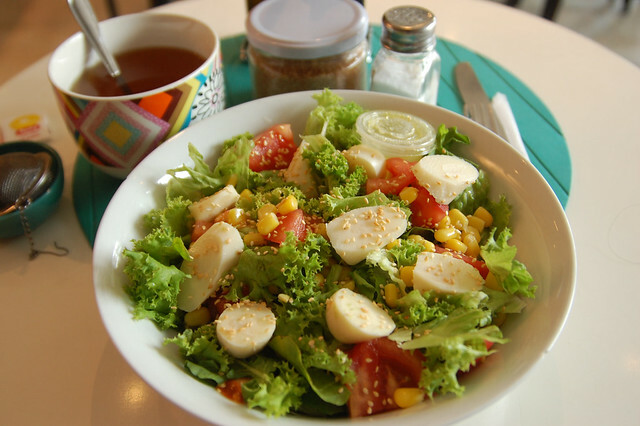 If you are a vegetarian, the hotel/restaurant in Colchane can serve you a vegetarian option but make sure to tell your travel agency and guide that you need a special meal. 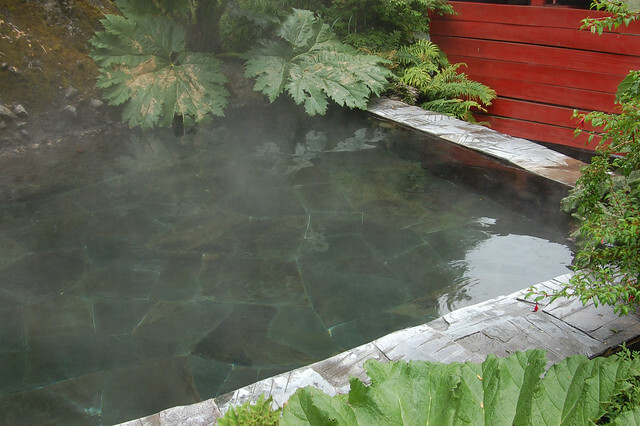 Be sure to bring your bathing suit for the Termas de Puchuldiza. Having just visited Mamiña, I chose not to and immediately regretted it. Luckily, one of my fellow tourists had an extra outfit that they lent me. Be prepared to spend the entire day in the tour van – I was picked up at 6:45AM and returned to my hostel at 10:00PM. This video, made using Google Earth, gives a really interesting view on the Gigante del Atacama. In my year living in the Valle de Elqui, one of my favorite activities was heading out into the orchard to see what fruit was coming into season and to pick a few figs, avocados, grapes, whatever was ready. One of the best things in the garden was the lime tree, filled with the kind known as limón de pica in Chile. (These small, round, green key limes are just called limones in Peru because they are basically the only type of limes or lemons you can find. Chile’s limones are oval and usually mostly yellow – what Americans know as lemons.) After the heavy rains last summer, I gathered up several kilos of limones de pica that had fallen off the tree and enjoyed them for the next couple of months. Suffice it to say, I’m a fan. In any case, in Chile, the limón de pica was given its name because it grows extensively in and around the town of Pica, located in the region of Tarapacá, in northern Chile. Only a couple of hours away from the busy city of Iquique, easily accessible by public bus or car, it is a popular destination for Chilean tourists. 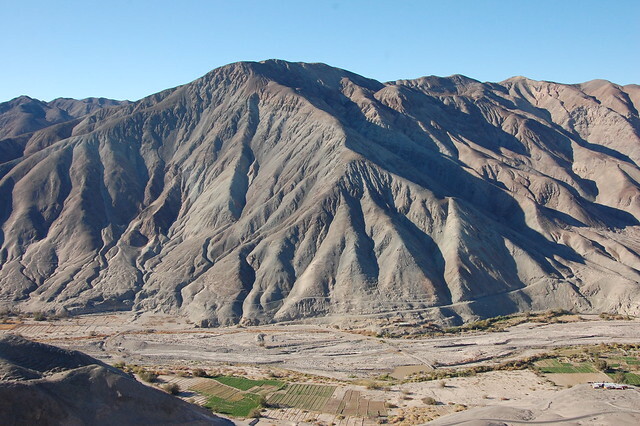 The route from Iquique to Pica climbs up the cliffs to Alto Hospicio (where I snapped this picture), and continues along Ruta 16 towards the Panamerican Highway, about an hour inland. 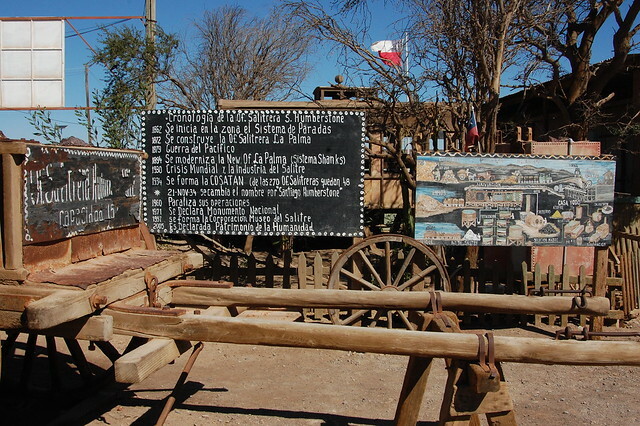 On the way, the highway passes Humberstone before arriving to the crossroads town of Pozo Almonte, right on Ruta 5 (the Panamerican). Every bus stops in this transit center, where you can transfer to another if necessary. 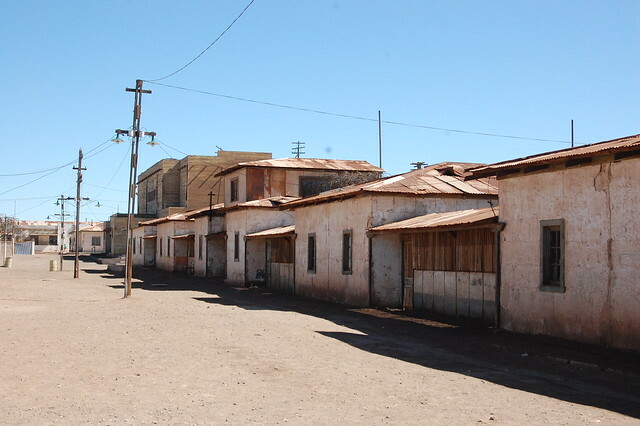 Leaving Humberstone, I flagged down a bus heading to Pica and was able to snag a seat once half the passengers descended in Pozo. From there, it’s about an hour to Pica, an easy ride through the desert. On the way, you pass through La Tirana, a small town known for its famous religious festival celebrating the Virgen de Carmen. The festival is celebrated from July 12-18 and is attended by thousands of people every year. This celebration is particularly famous in Chile because it is the most traditionally Andean of any in the entire country; the dances are extravagant, fascinating, and entertaining. While I visited the area in July, I arrived just after the festival had ended, so had to settle for watching videos in the Museo Regional de Iquique. That said, on my way through, the small town was still doing a brisk business selling religious trinkets and welcoming quite a number of tourists. 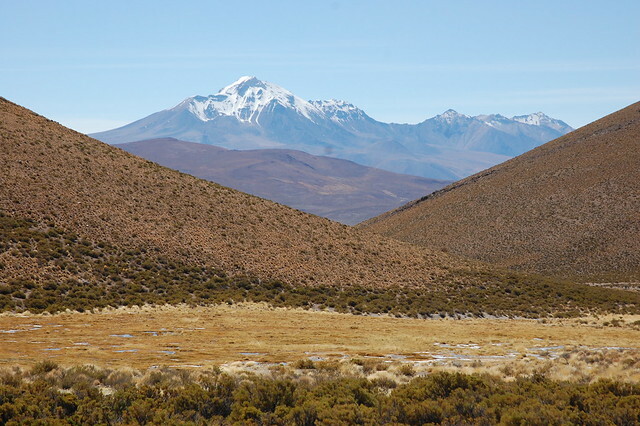 After passing through La Tirana, we continued heading through the desert, but as we approached Pica I started noticing the various patches of bright green foliage. 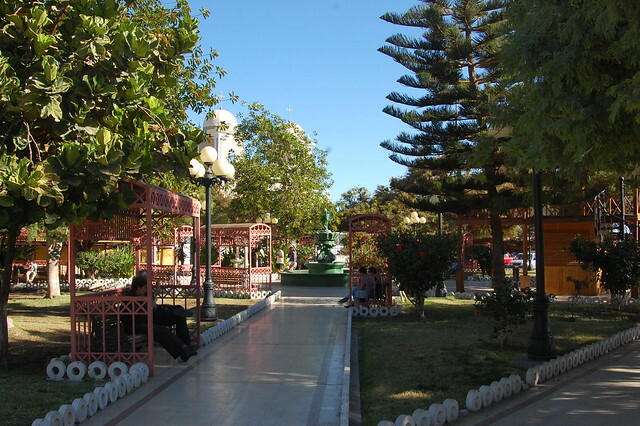 Pica is famous because it is a pleasant oasis in the middle of the large northern desert, which makes it a great place to grow hot climate fruit like mango and citrus. And that was basically the reason I went there – to eat delicious fruit. What can I say, I’m a simple person. The bus route ends at the central plaza of Pica, where the first thing to catch your eye is the gorgeous Iglesia de San Andrés, as you see in the photos above. 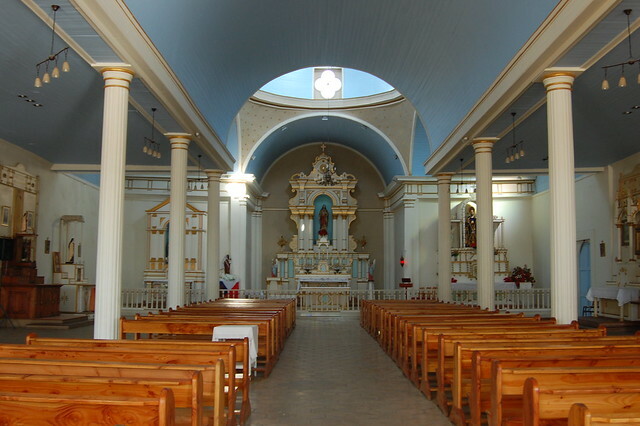 This church is prized in northern Chile for its traditional construction and attractive interior. 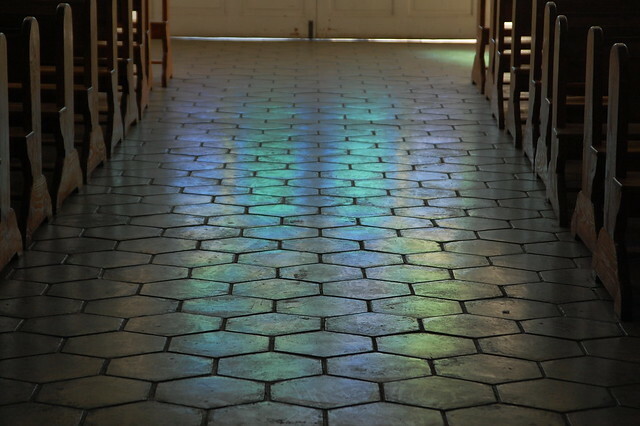 I was particularly fascinated by the rainbow reflections of the stained glass windows, as you can see from the photos. After checking out the cathedral, I walked around Pica’s main plaza. As mentioned, Pica is an oasis, which means it has a much more agreeable climate than the relentless sun of the open desert. 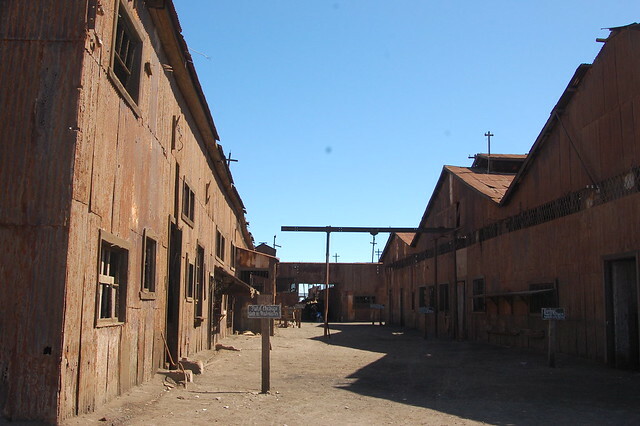 After spending the morning exploring Humberstone, I was more than ready to cool off in the plaza. And to be honest, that is basically all there is to do in Pica: sit in the pleasant plaza to while away an afternoon. Pica has a number of old, traditional houses painted in bright colors, inviting you to admire them. The main road hosts a library, several hotels, and a couple of stores offering Pica’s other specialty, alfajores de Pica. The town is small, so it’s easy to wander around without getting lost. 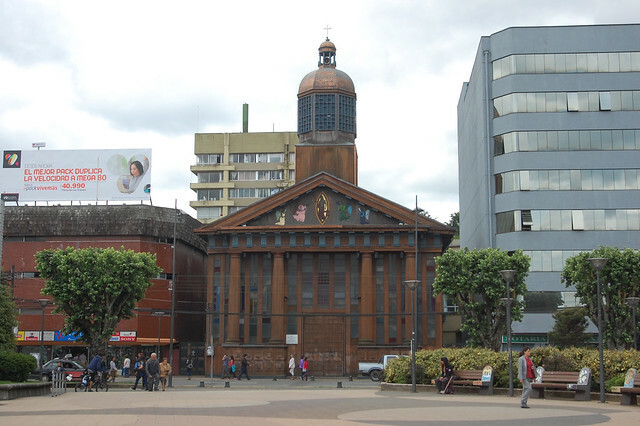 If you continue along Calle Esmeralda, the main thoroughfare heads to Cocha Resbaldero, Pica’s other main tourist attraction besides the church and the fruit. 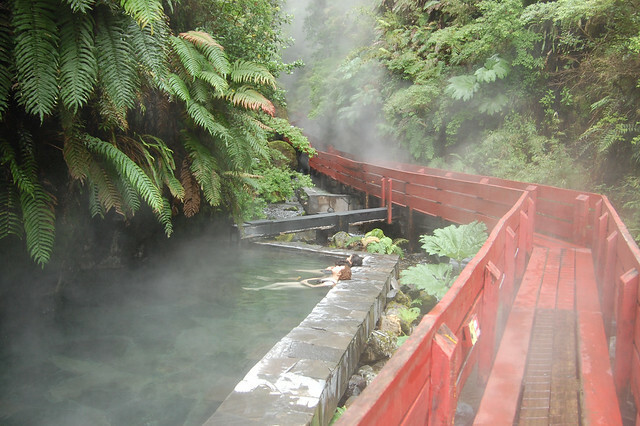 Cocha Resbaldero is a natural pool or thermal bath formed out of volcanic rock, popular with tourists interested in taking a nice relaxing dip. As I was heading to Mamiña for its healing mineral waters the next day, I opted to skip the crowds (which you see here!). After sufficiently ascertaining that there was not much to do in Pica (and finding that there was not fruit on every corner as I expected), I headed back towards the main plaza. After poking around some more, I found a pleasant restaurant offering fresh juices and fruit by the kilo. 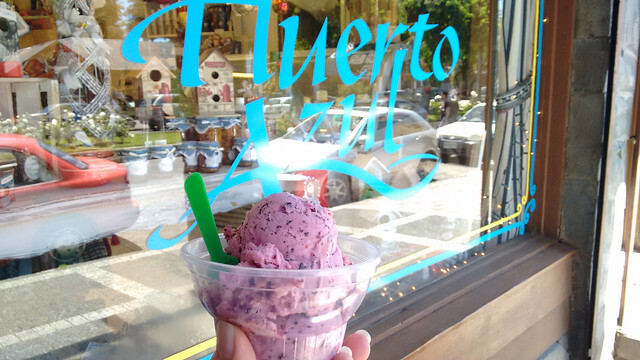 I bought some early-season mangos and toronjas (grapefruit) and then headed back to a little storefront offering homemade ice cream. 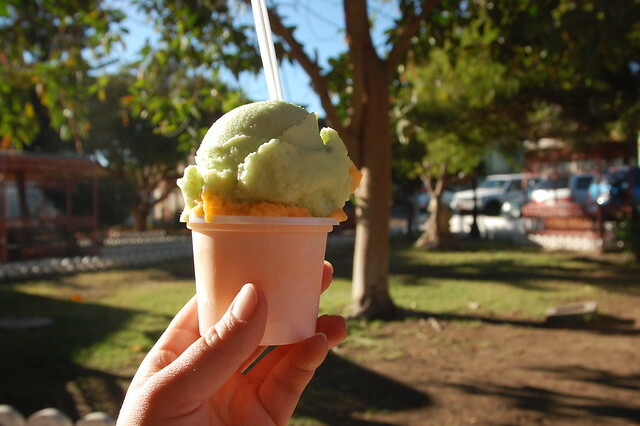 As I am on a mission to try artesanal ice cream in every small town where I find myself, I couldn’t resist and tried out mango and guayaba (guaba). Before leaving Pica, I bought a couple of packages of alfajores de Pica, which differ from the usual alfajores due to the slightly different technique used to make them. 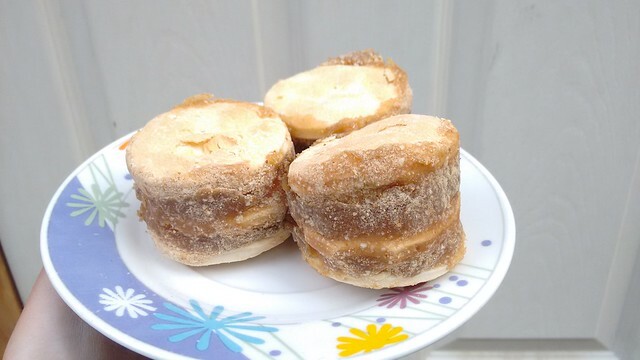 Alfajores de Pica have crispy cookie layers and are usually filled with mango jam rather than the traditional manjar. They may also be rolled in coconut, completing the tropical flavor. If you decide that it’s not worth trekking all the way out to Pica just to buy some alfajores, they are often sold by vendors at the transit hub of Pozo Almonte and can be found in supermarkets in Iquique. Similarly, there are juices made with fruits from the region at the Mercado Centenario. 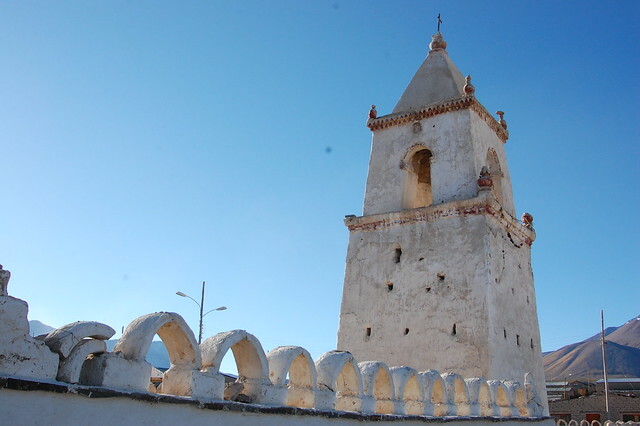 Either way, visiting Pica makes for a pleasant day trip when combined the nearby attractions of Humberstone and La Tirana; visiting the oasis provides a nice break from the surrounding desert. Buses to Pica leave from the 700 block of Barros Araña near the Mercado Centenario in the center of Iquique. 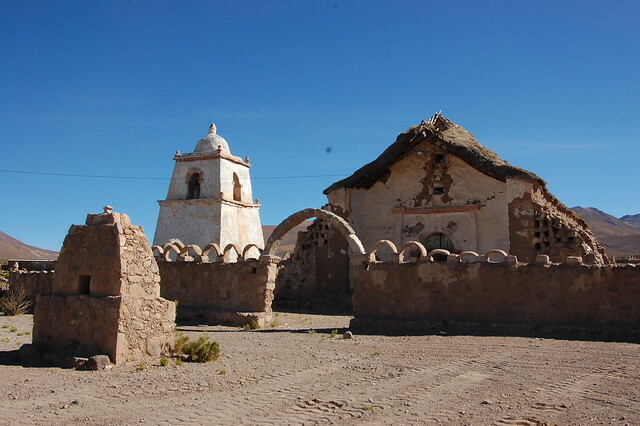 Before arriving in Pica, they pass by Humberstone and through Pozo Almonte and La Tirana. You can get on and off the buses at any of those stops (or anywhere else on the route). A bus to or from Iquique costs $3000 CLP. From Humberstone, the bus costs $2000 CLP. You can buy your return ticket at the bus stand next to the main plaza, where you see all the buses parked. If you are interested in swimming in Cocha Resbaldero, make sure you arrive earlier in the day to give yourself enough time to walk over there and enjoy a relaxing dip. The pool is really popular with Chilean tourists so it may be better to visit on a weekday. The pool costs $2000 CLP. There are a number of restaurants in Pica but as it is a small town, they only appear to be open during the lunch hour. I found one restaurant serving juices in late afternoon but there were no other customers inside. You can buy alfajores de Pica at the factory on the corner of the plaza, across from the church. 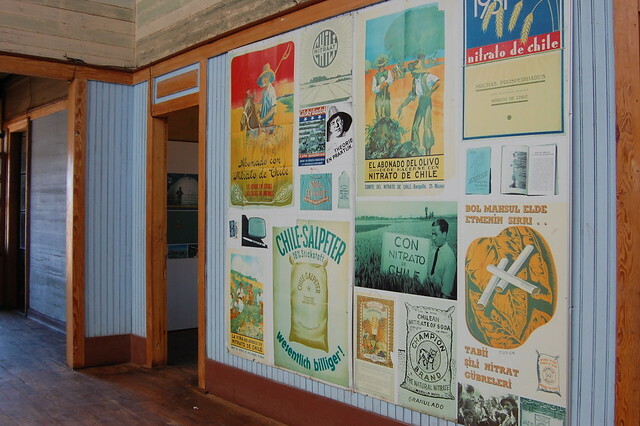 The older gentleman who sits outside the factory is a local celebrity and the walls are covered with articles describing the alfajores and other aspects of town life. There is another factory selling alfajores a block or two from the plaza. 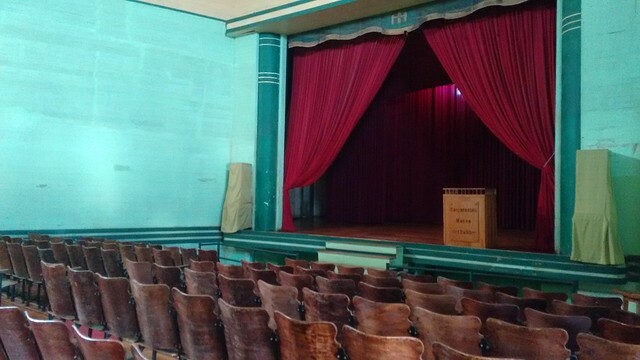 Although Pica was a pleasant place to visit for an hour or two, I would definitely suggest combining it with a stop in Humberstone and La Tirana to make the most out of your day. Now that I’ve had a chance to end my time in the Valle de Elqui, travel around southern Chile, and decide to move back to Peru, it’s time to rewind to where it all began last year: my inspirational trip to the region of Tarapacá and the sites around the amazing city of Iquique. For anyone truly interested in understanding the history of northern Chile and the role that mining has played in generations of families, you have to educate yourself on what the life of a Chilean miner has been and currently is like. 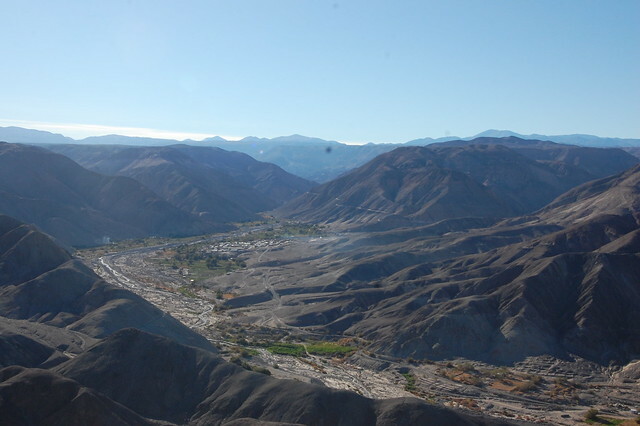 In the Valle de Elqui, almost every family I knew was touched by mining, where a father or son or partner or cousin heads north to Antofogasta or Tarapacá on a regular basis. Miners generally work in cycles where they will spend 10, 12, or 14 days working in the mines and an equal number on descanso (rest) back at home. While Los 33 is a dramatized Hollywood version of a particularly challenging episode in Chilean mining history, it can serve as an easily accesible visual introduction to life underground. 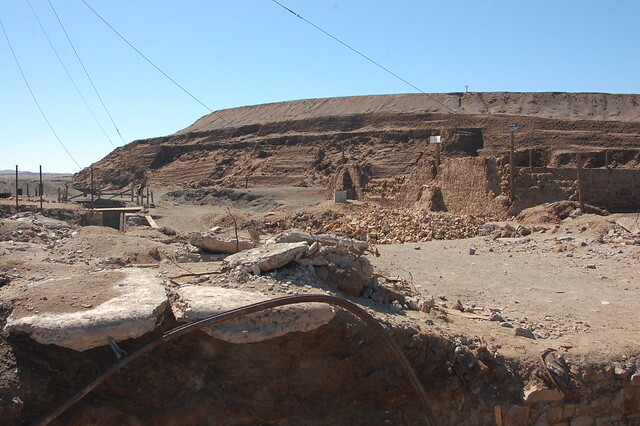 In the heights of the saltpeter industry, entire complexes grew up around the mines, located in the most inhospitable parts of the north, baking under the desert sun. 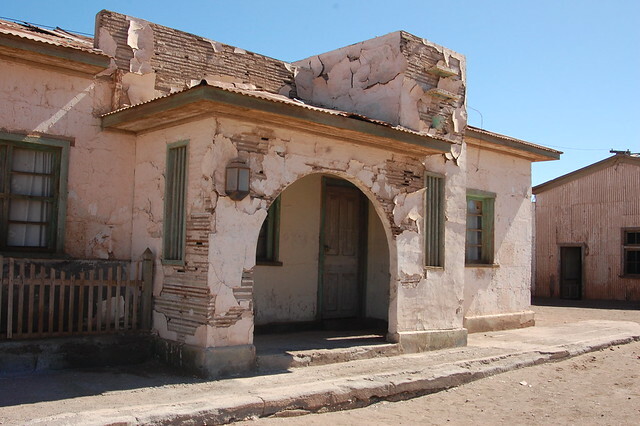 Some of the salitreras were small and consisted of little more than the industrial operations and basic housing, but others, like Oficina Salitrera Humberstone, evolved to have extensive living complexes, a hotel and bar, swimming pools and basketball courts, schools, and even a theatre. 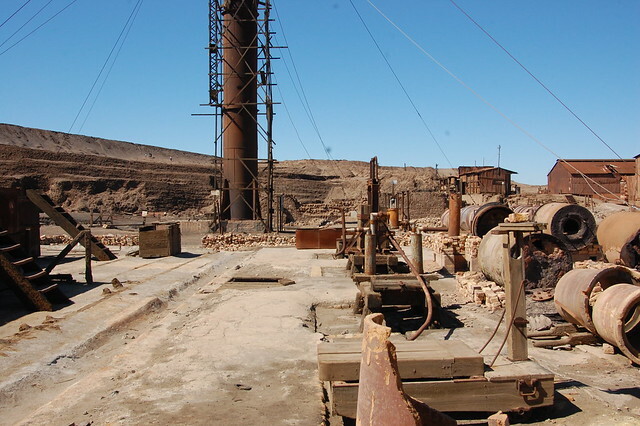 According to what locals told me, Humberstone was actually quite unusual, serving as the “model” saltpeter mine, but that doesn’t make it any less interesting. It just makes you realize that if you think these conditions are harsh, they were much worse in most of the other oficinas. 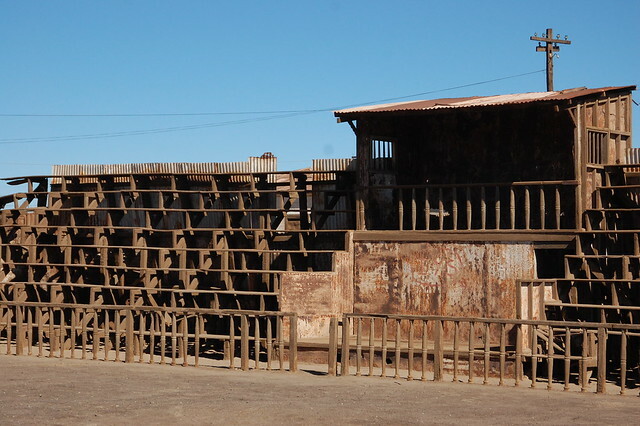 I didn’t know what to expect when arriving at Humberstone, known as an abandoned yet amazingly preserved national monument recognized by UNESCO. I took one of the frequent buses from the Mercado Centenario in the center of Iquique and was deposited at the bus stop on the recently relocated highway. 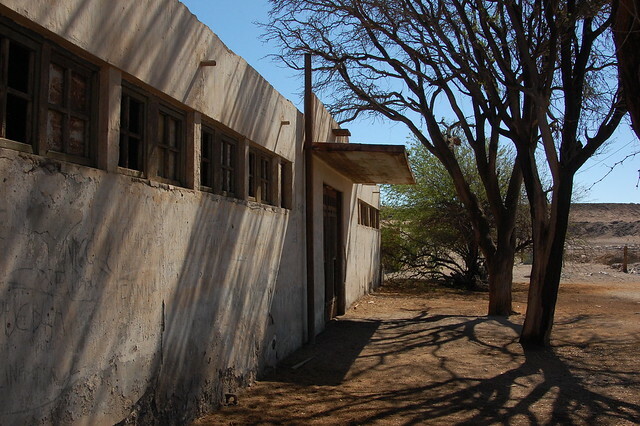 While the highway used to pass right next to Humberstone, now you have to walk about 10 minutes to get to the entrance. After paying the entrance fee, I received my map of the massive site and started wandering around. There is a lot to see. If you are fascinated, as I was, by all the history contained within the site, you could easily spend the entire day there, wandering through the buildings on the main square, poking around the main “streets” containing the living barracks, checking out the various on-site museums displaying wooden doors and windows, household goods, tools used by the miners, or games created by the children. It’s definitely worth contemplating what life was like for so many men, women, and children for decades, living in this hostile climate and having to find a way to adapt to this lifestyle in order to eke out a living. 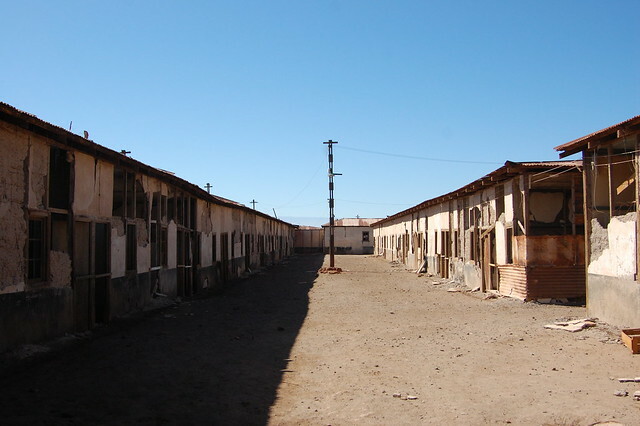 As a teacher myself, I appreciated walking through the old school and picturing the children trying to imagine their futures beyond the pampa (desert mine region), living in a bleak environment. One of the classrooms displays enlarged pages containing an excerpt from a book written by a man who grew up in the saltpeter mines, illustrating the harshness of life for women and children. After walking through the streets of the residential sector, I explored the homes of the higher ranking managers and the relative comforts of their quarters and administrative offices. 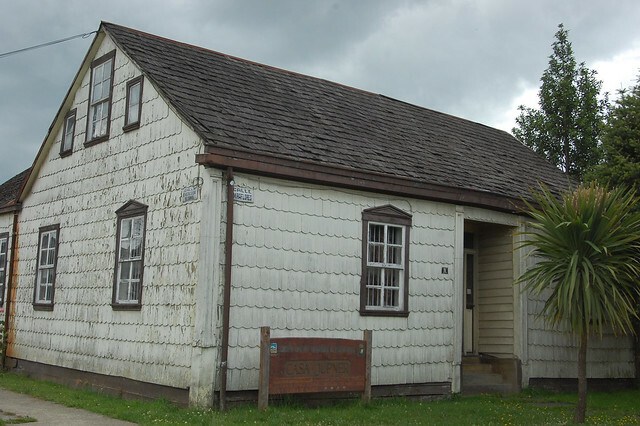 Many of the museum exhibits are housed in these sturdy, well-preserved buildings. From there, I climbed to the top of the “torta” or the mountain created by the residues from the mining process. This provides an amazing vantage point over the entire area, giving a clear view of the vastness of the mine. Looking from the uniform residential buildings (still echoed in the suburban Chilean landscape today), to the towers of nearby Oficina Santa Laura, to the sprawling industrial sector littered with abandoned machinery, I was able to construct a visual of what the area must have looked like a century ago and how lonely it must have felt to live and work here. The expanses of the desert are impressively vast. You can barely make out the highway from the highest vantage point. The sense of isolation is complete. After sufficiently appreciating the view and being thankful for the opportunity to develop a deeper understanding of life here, I headed over to the industrial sector, observing the heavy machinery and getting a sense of how saltpeter was processed. To be fair, I was much more interested in the residential area because it baffled my mind to imagine people living here for as long as they did. Not just here, but in any of the many abandoned oficinas you can see from the highway as you travel around the region. 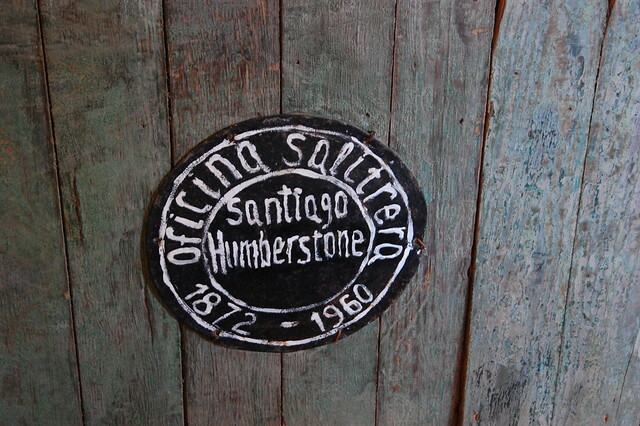 The really ambitious independent traveler can continue exploring Oficina Santa Laura, another nearby saltpeter mine about 20 minutes away on foot. I wanted to continue on to Pica before it got too late in the day (and needed a break from the sun), so I skipped it this time around. For what it’s worth, people say that you can feel the spirits of ghosts while wandering through the abandoned mining complex. Some tour agencies even offer nighttime full moon tours for just this reason. 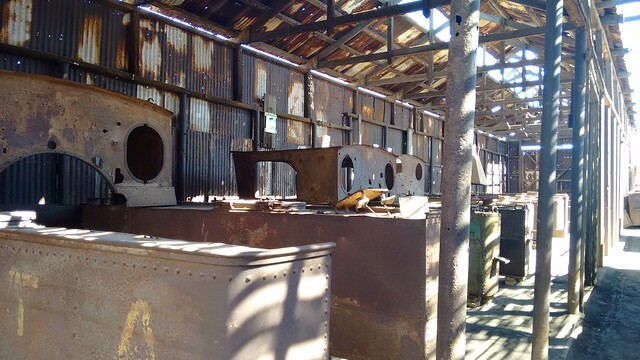 I spoke to a local tour guide who told me that there are definitely spirits still inhabiting other mining complexes, especially those where conditions were more brutal and more lives were lost. I found it particularly moving to hear the stories of these spirit encounters and imagine these poor souls still wanting to tell their stories. Whatever your beliefs, I think it’s important to honor these workers of the past and how their sacrifice and dedication contributed to the development of Chile. 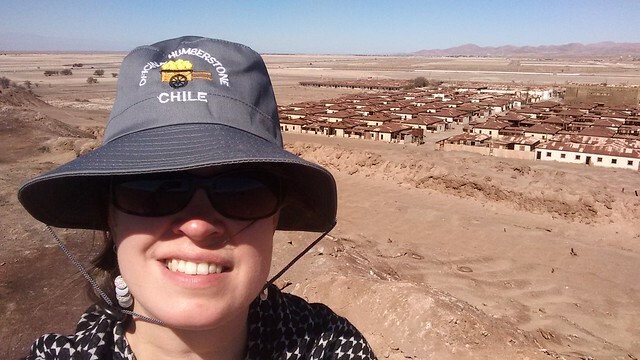 My visit to Humberstone gave me a greater appreciation for the realities of mining and brought me to a deeper understanding of Chile and its culture. I highly suggest a visit. I went independently, which gave me much more time at the mining complex and enabled me to read the plentiful, informative signage (often in Spanish but sometimes in English) and spend more time appreciating the entire site. 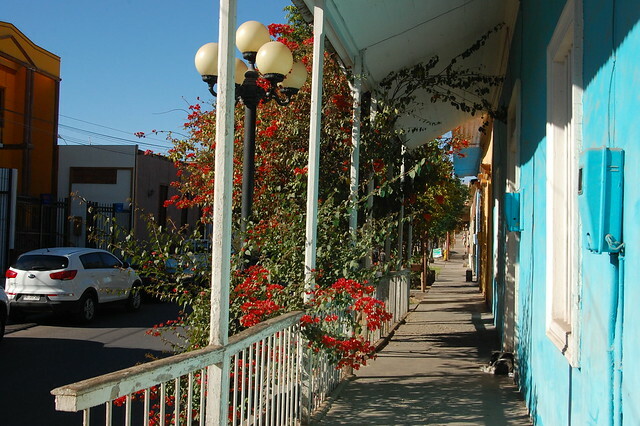 Humberstone is easily reached via public transportation. Buses leave every few minutes from the 700 block of Barros Araña, near the Mercado Centenario in Iquique. 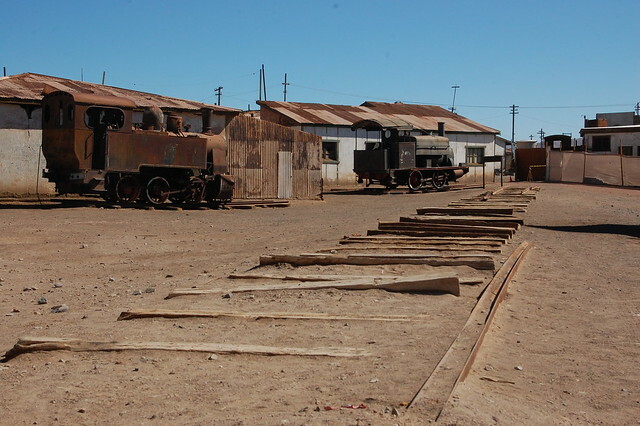 A bus to Humberstone from Iquique cost $2000CLP in July 2015. Make sure to tell the driver that you will get off in Humberstone, as the buses continue on to more distant destinations, and only tourists stop in Humberstone. The highway exit is incredibly well labeled and visible, but you can always follow the route on Google Maps if you want to make sure you don’t miss it! Upon arrival, cross the highway via the overpass and keep walking to the visible parking lot. The entrance is well labeled and easily to find. Entry to the site costs $3000CLP and includes a map of the complex. The map gives a good sense of the layout of the site. I started with the main plaza, headed through the residential sector, climbed the “torta,” and then saw the administrative offices, before heading to the industrial sector. On my way back, I wandered through the exhibits lining the main road. Due to the exhausting nature of being in the sun for so long, I also suggest heading to the farther sector first and working your way back, ending with the indoor museums. Do not forget sunblock, and if you don’t have a hat, you can buy one at the artisan stands located on site. The sun is brutal. Just imagine living here! 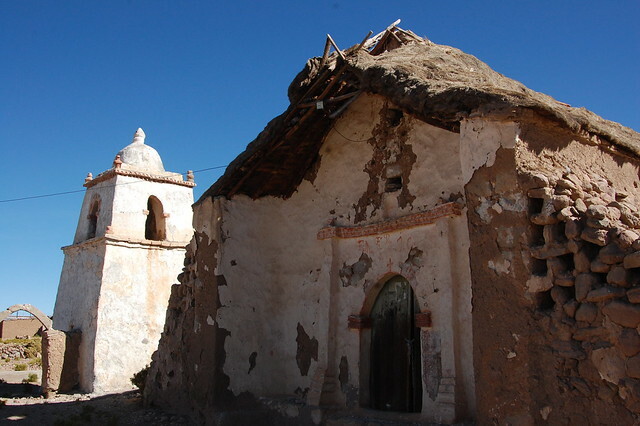 You can walk to Oficina Santa Laura from Humberstone if you are interested in seeing another site. Oficina Santa Laura gives a clearer sense of the industrial aspect of the oficinas. 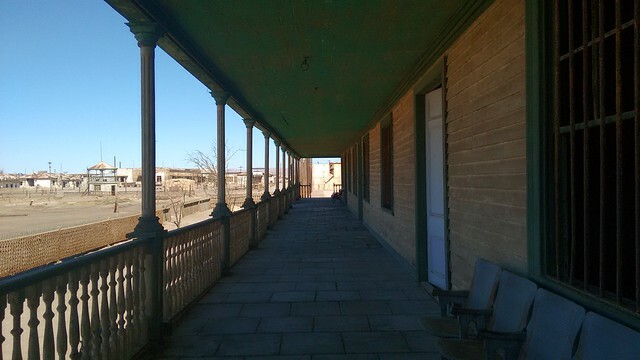 From Humberstone, I headed onward to Pica by waiting at the same bus stop I got off at. You can also visit La Tirana on the way to Pica. If you want to squeeze all three locations into one day’s trip on public transportation, leave Iquique by 8 or 9AM to give yourself enough time to explore. 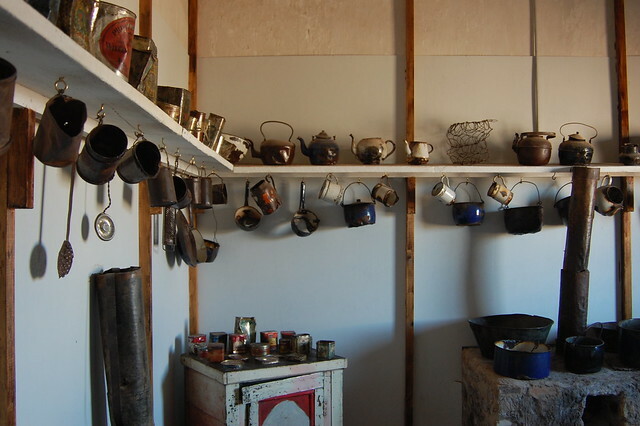 For more information on the saltpeter mines, give yourself time to explore the many on-site museums and displays. This BBC article gives a little more context on the mining complex. This interesting article explains how important saltpeter used to be.